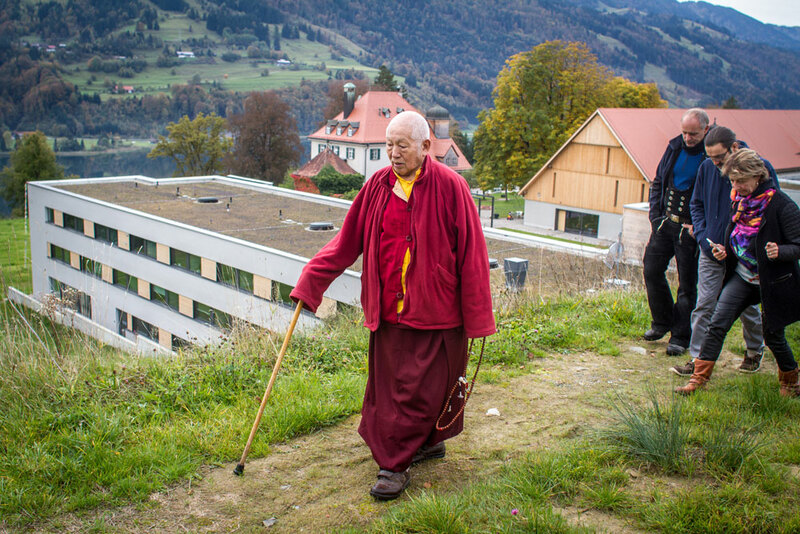 Welcome back to the EC, Lama Toensang! 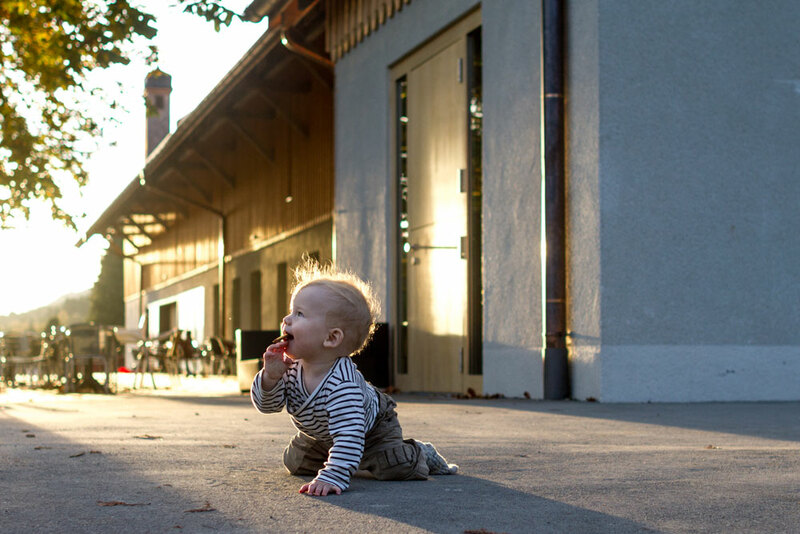 The best things come when you least expect them! 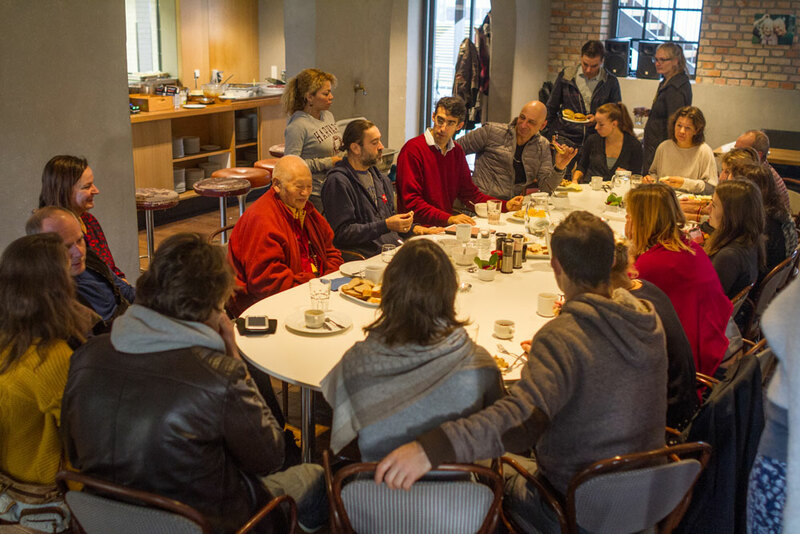 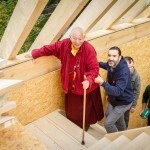 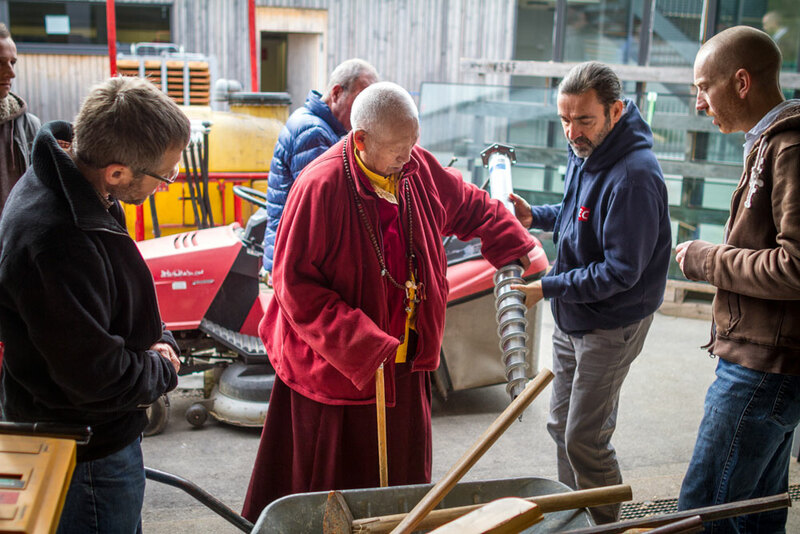 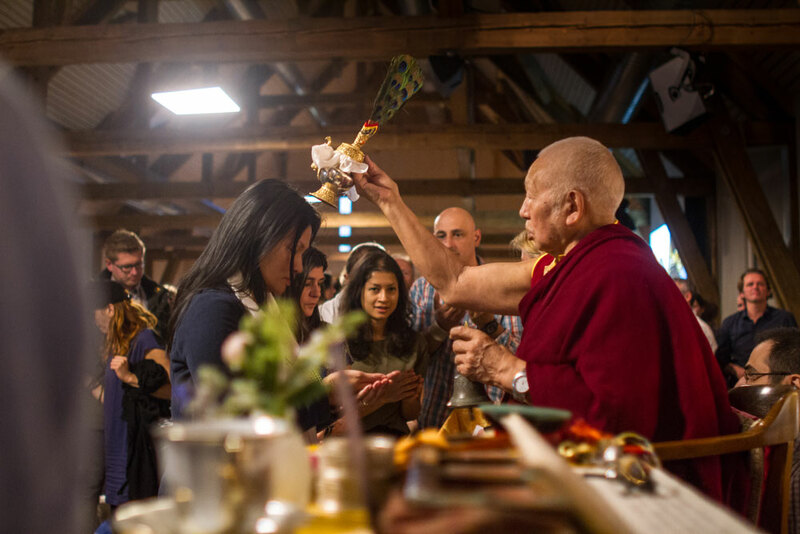 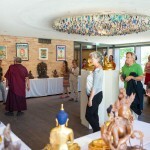 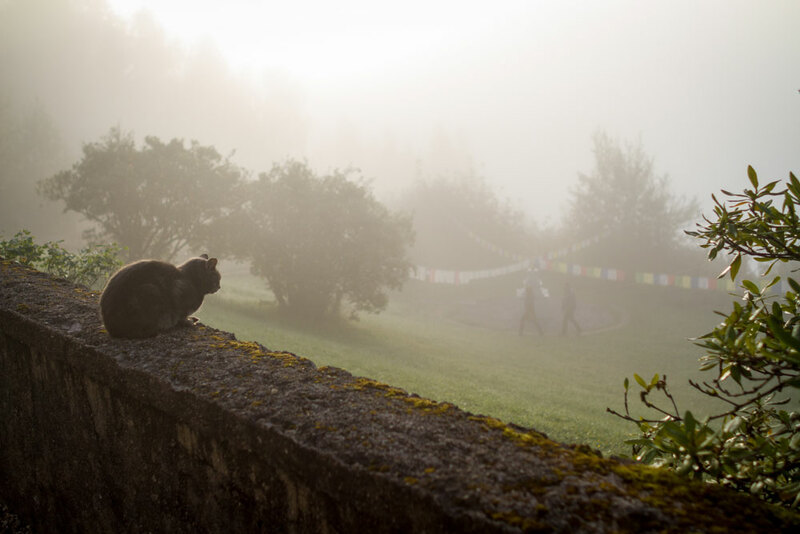 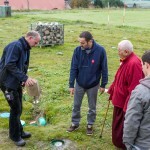 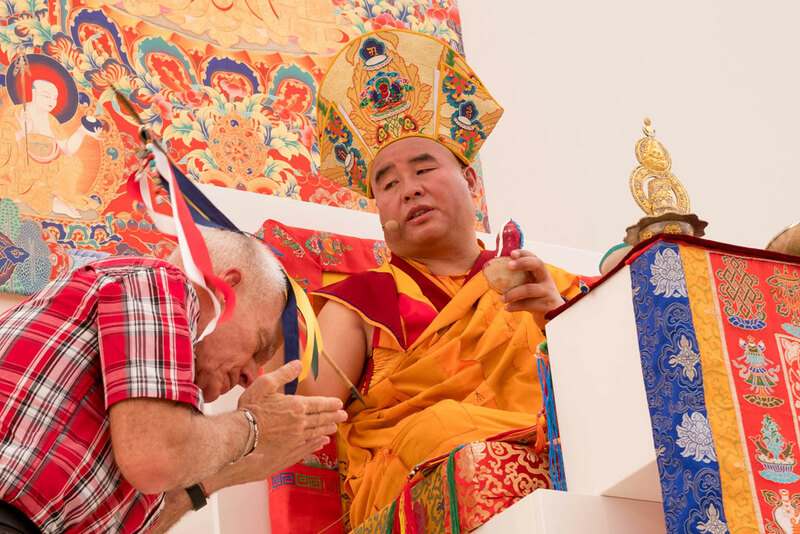 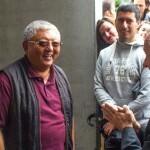 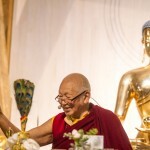 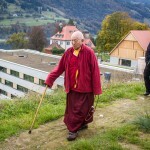 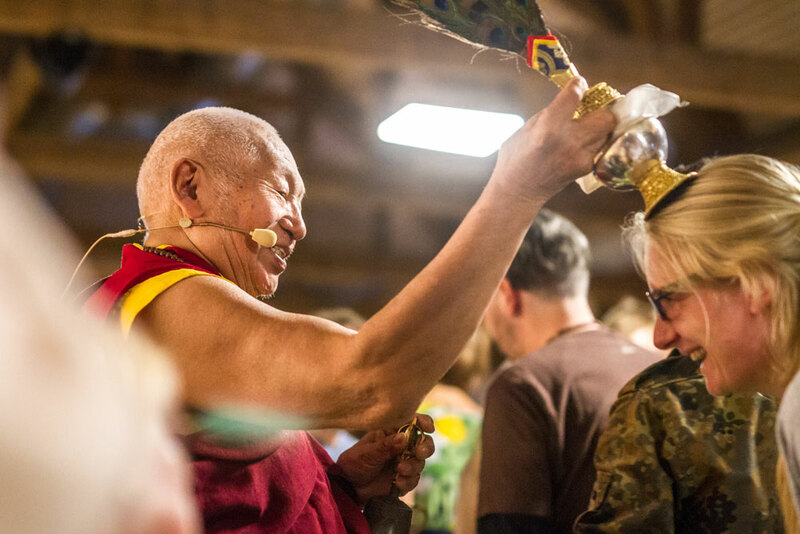 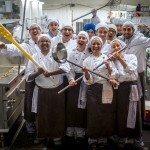 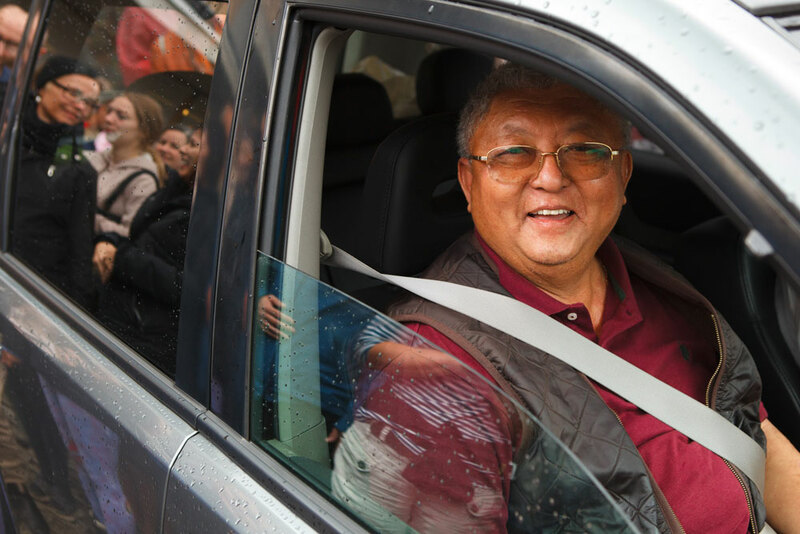 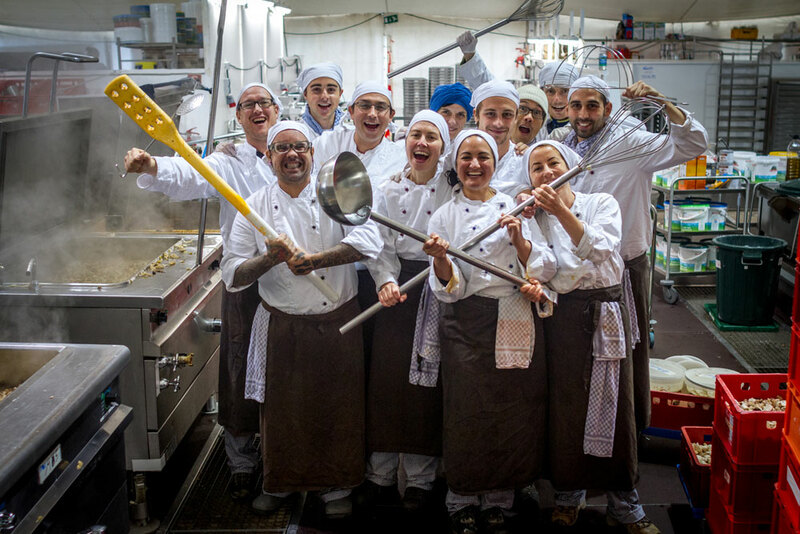 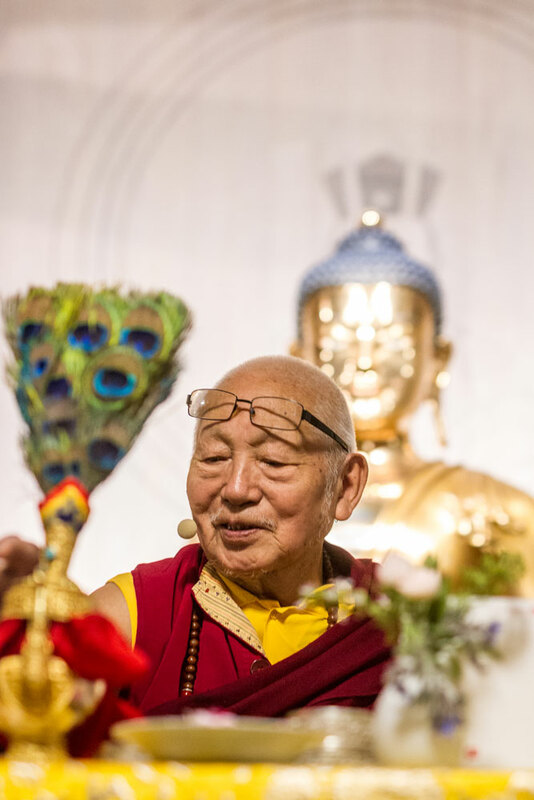 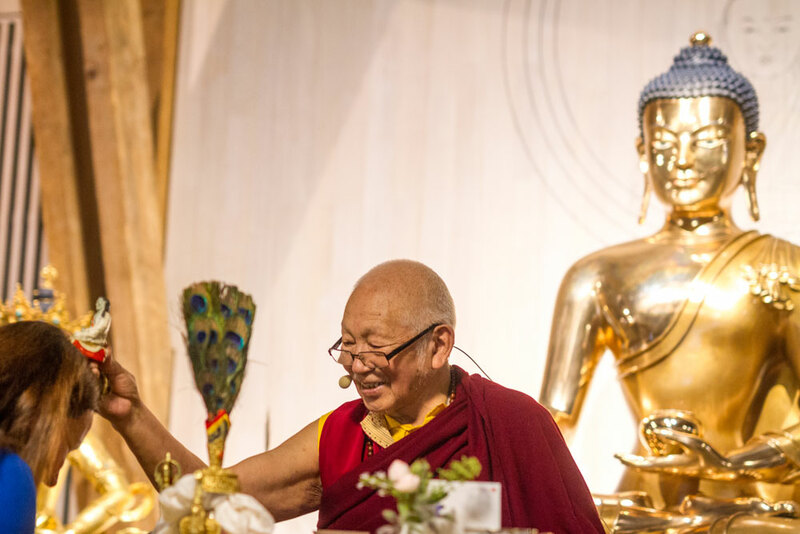 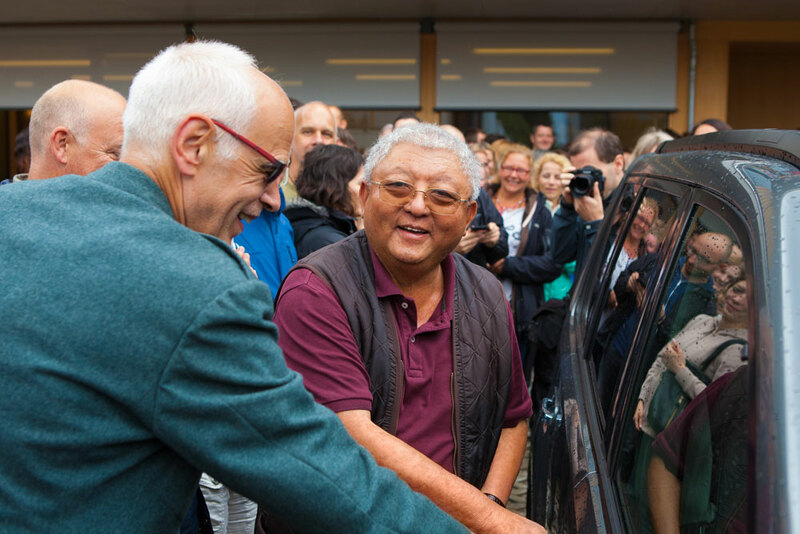 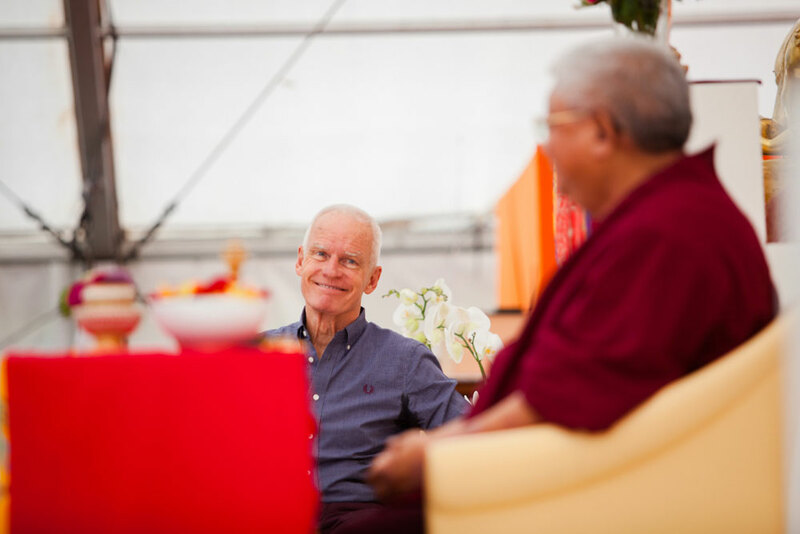 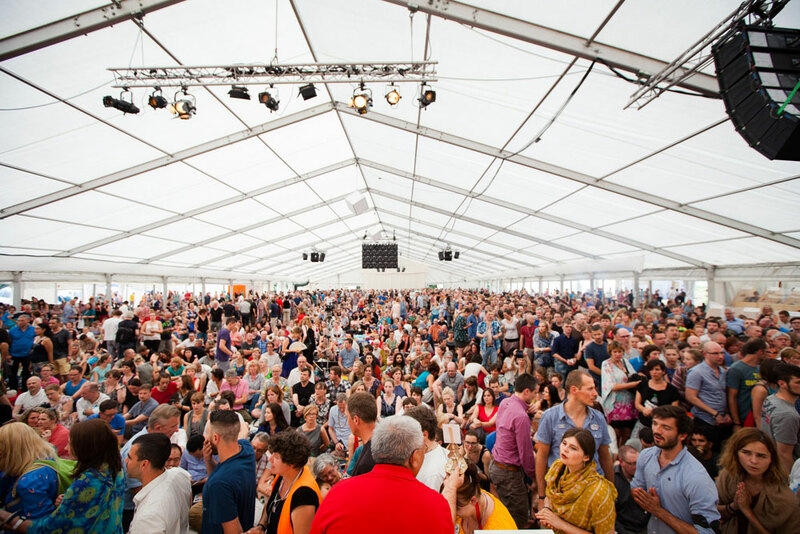 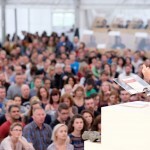 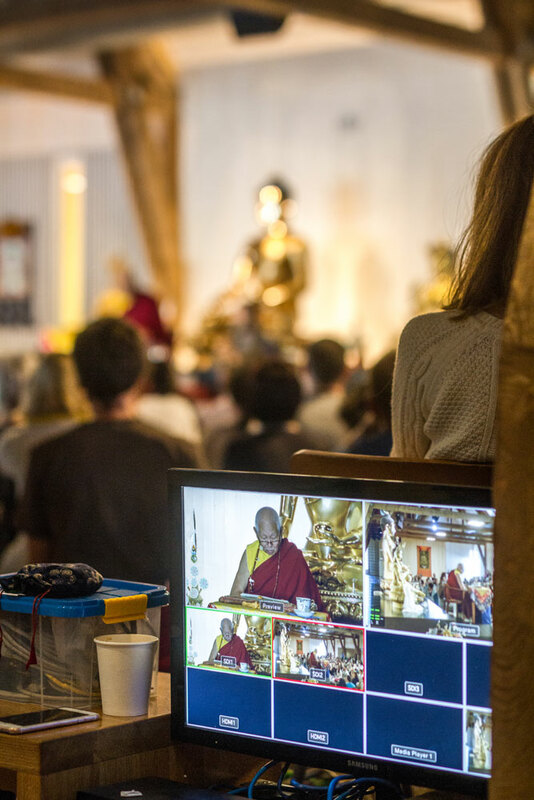 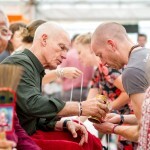 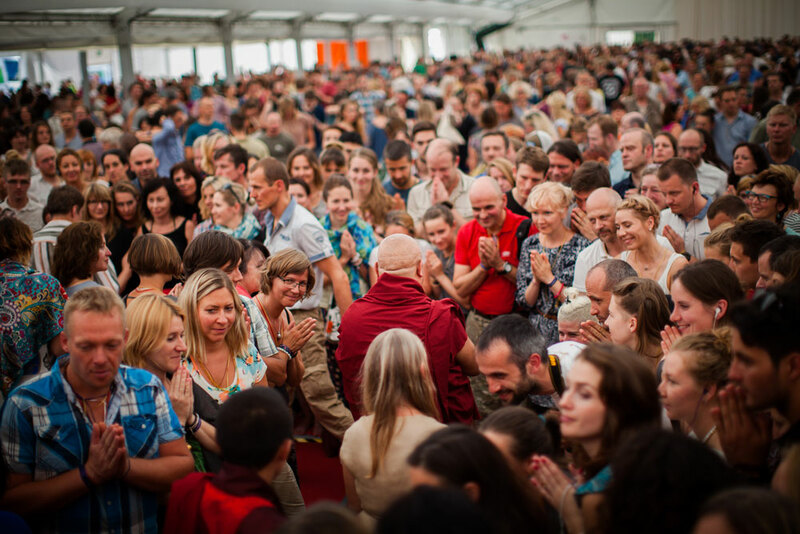 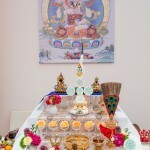 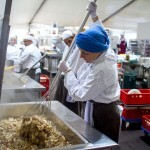 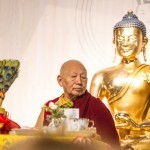 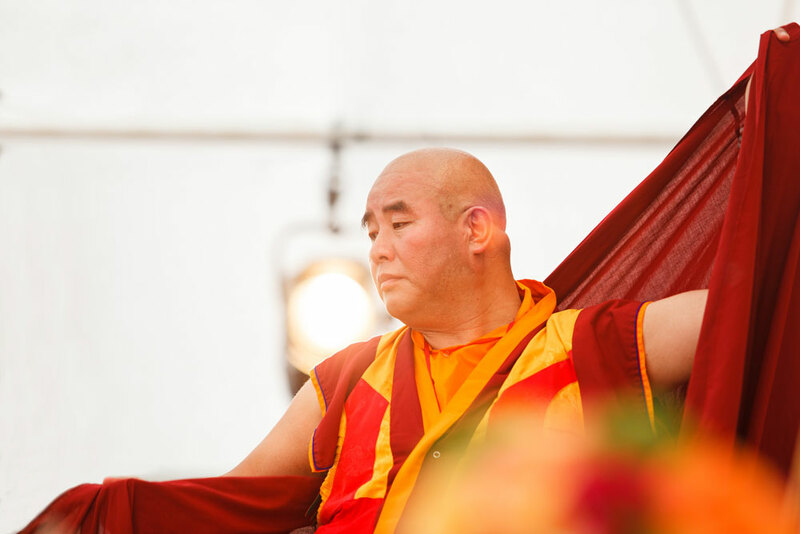 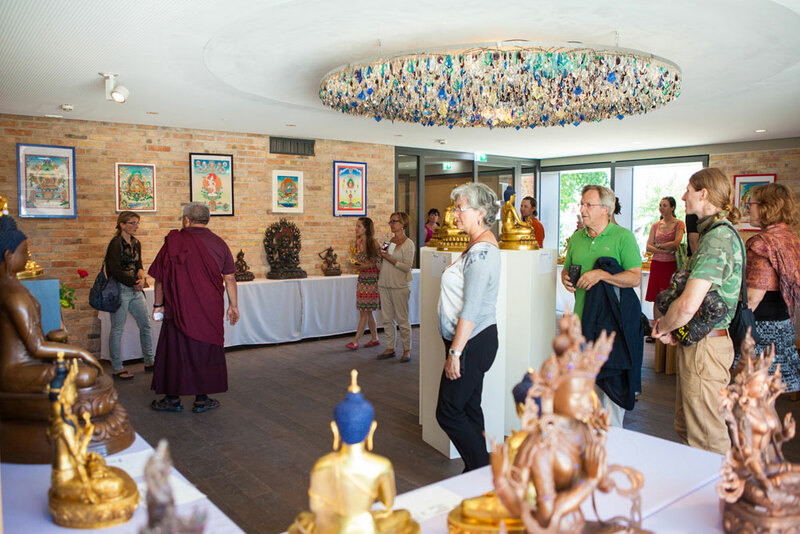 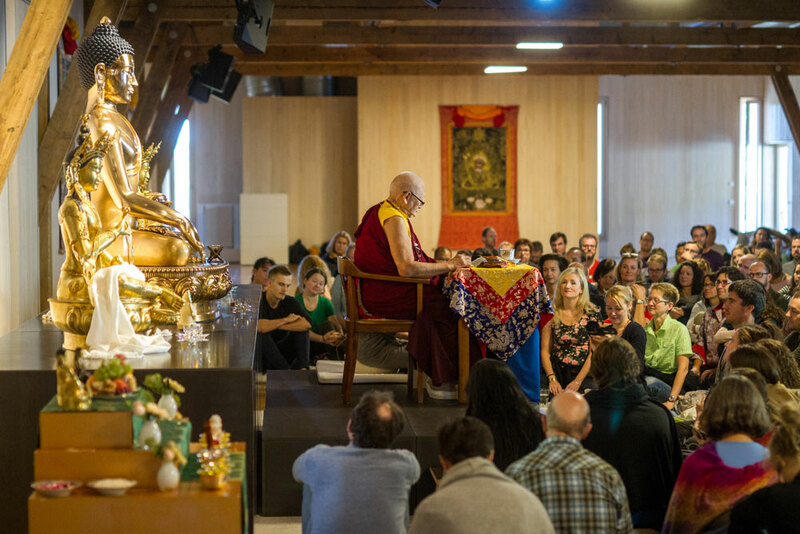 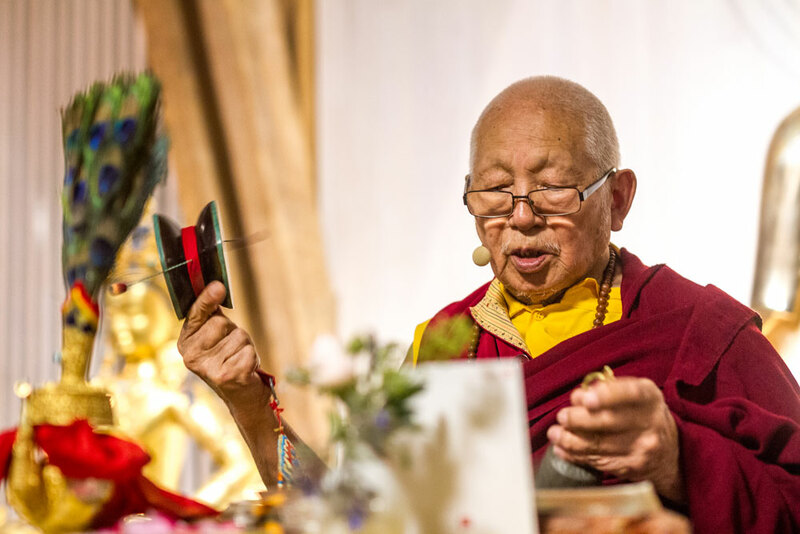 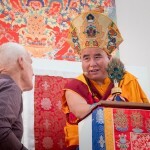 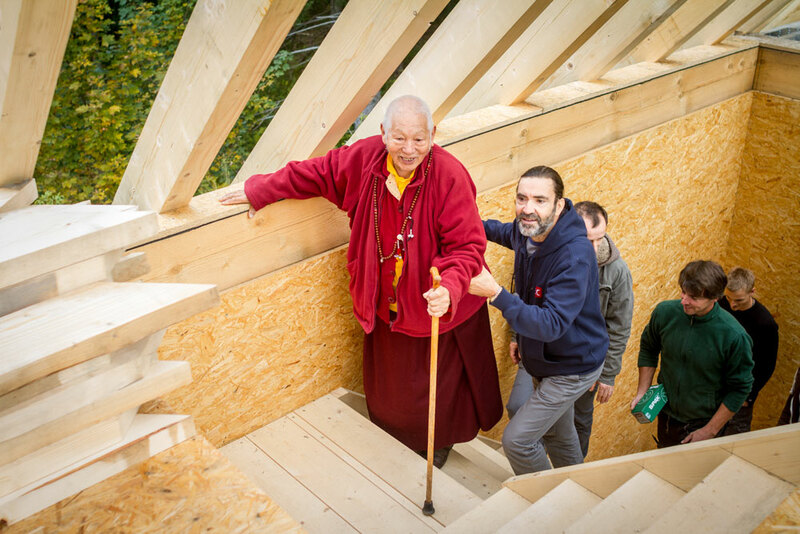 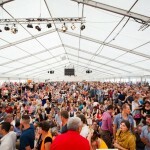 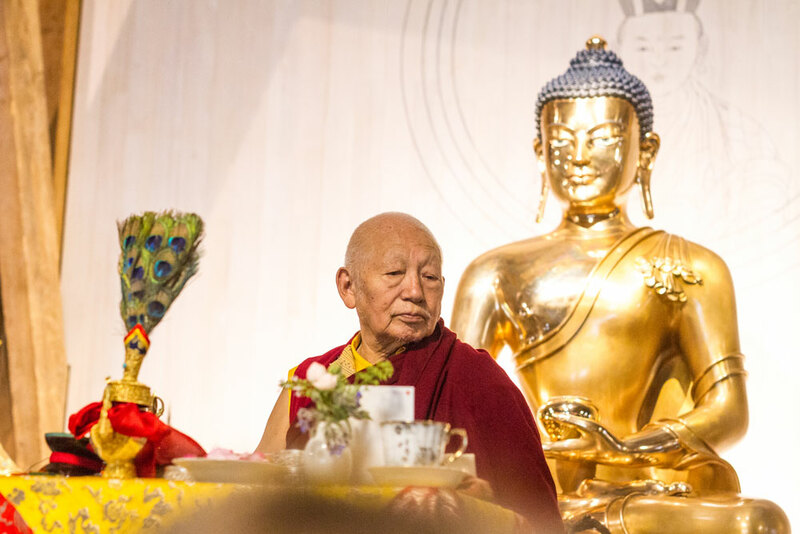 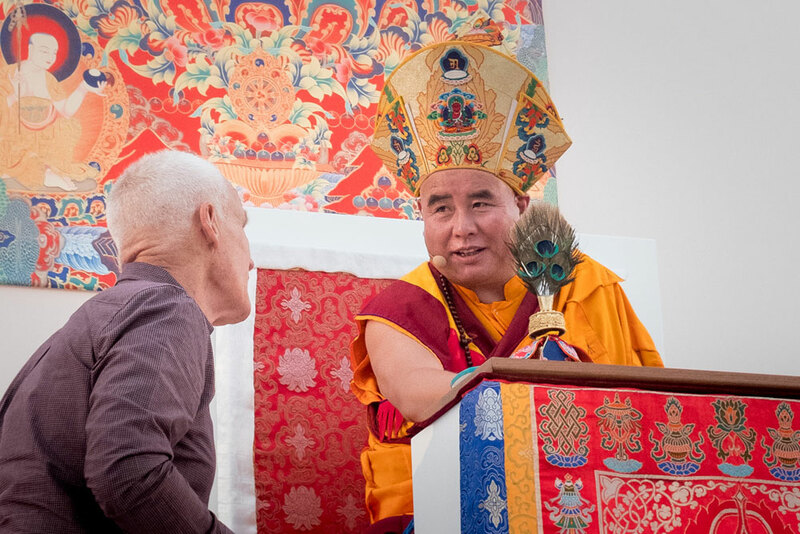 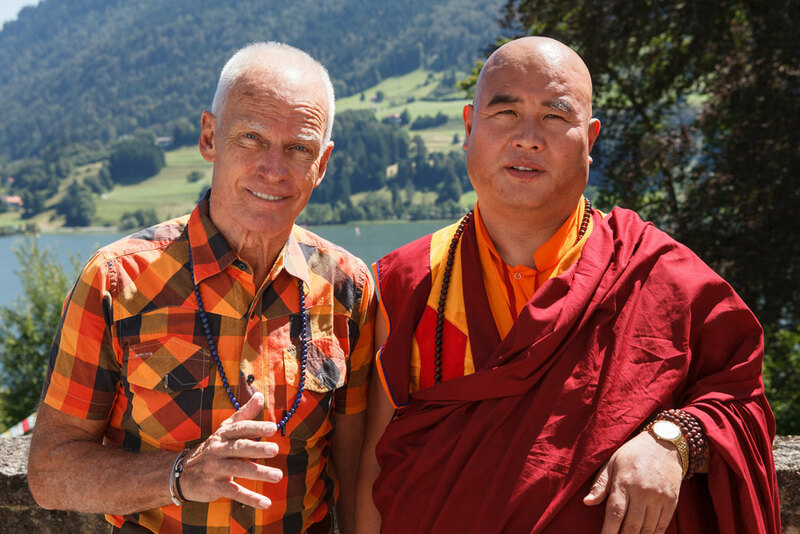 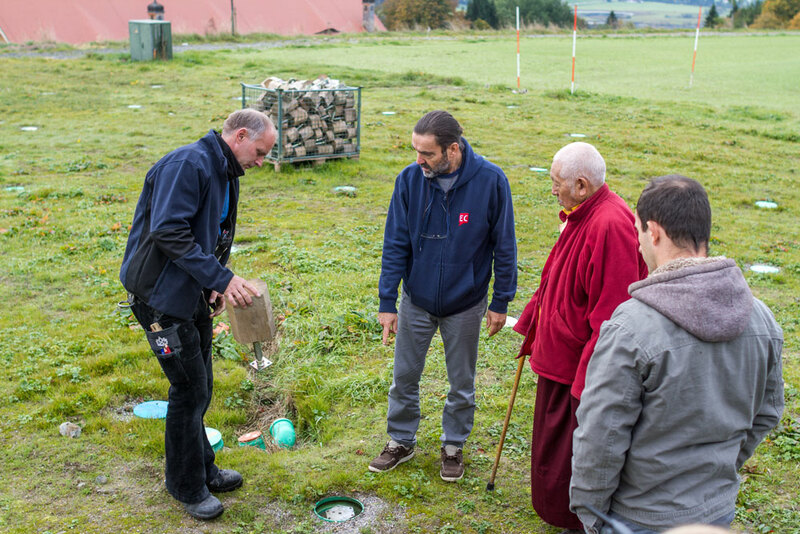 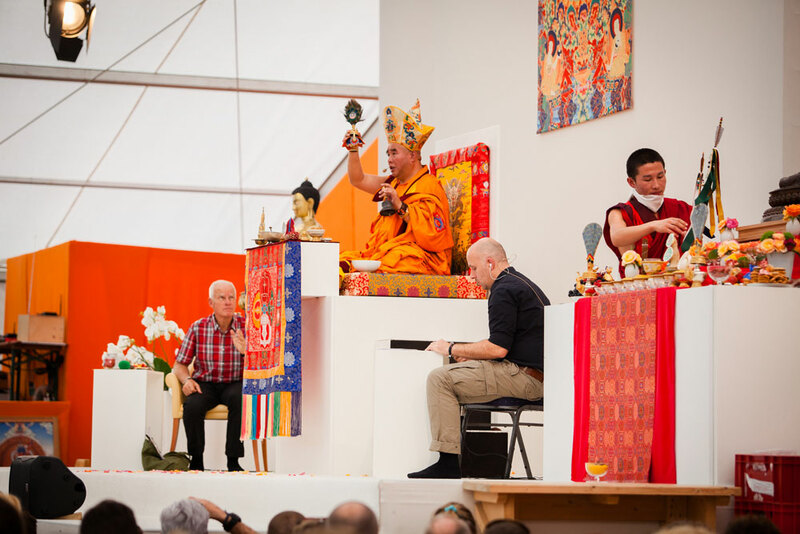 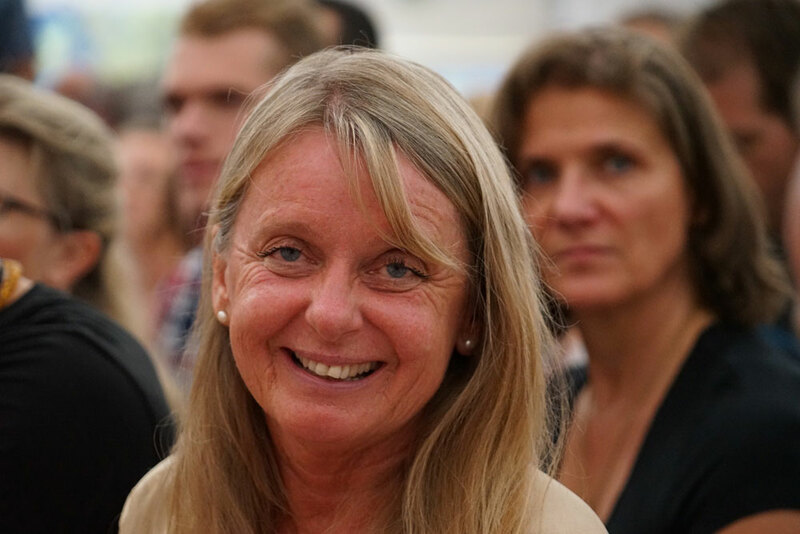 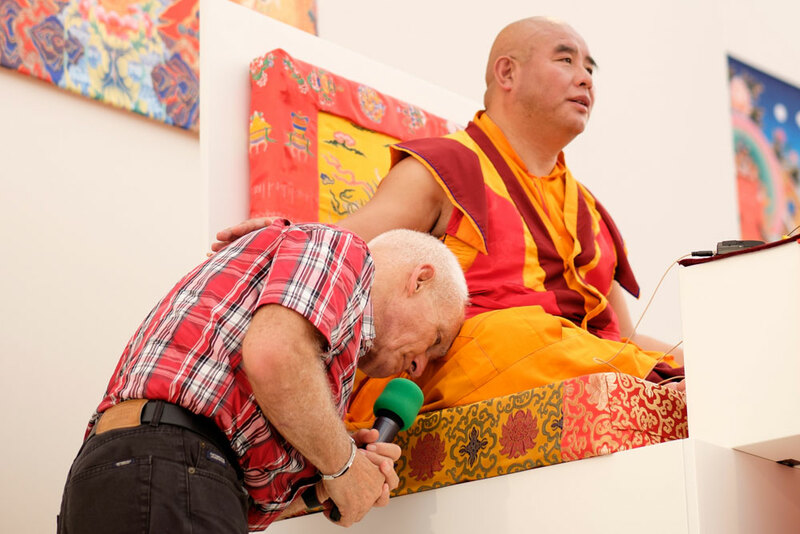 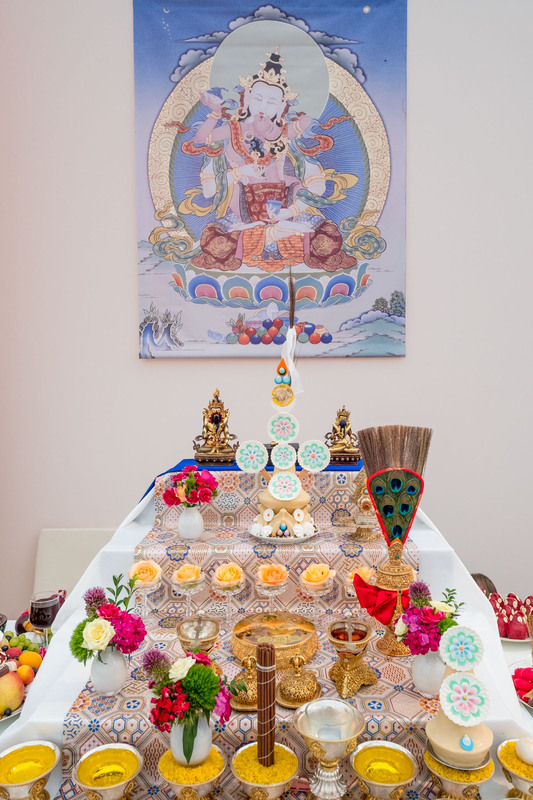 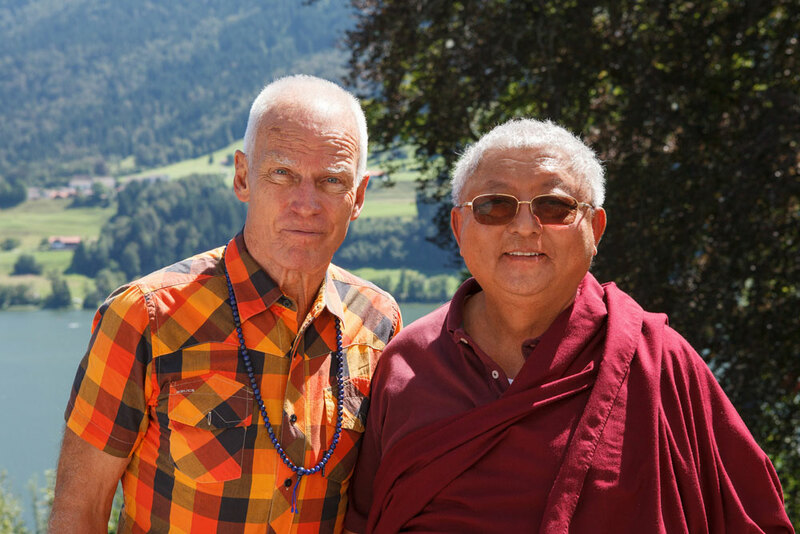 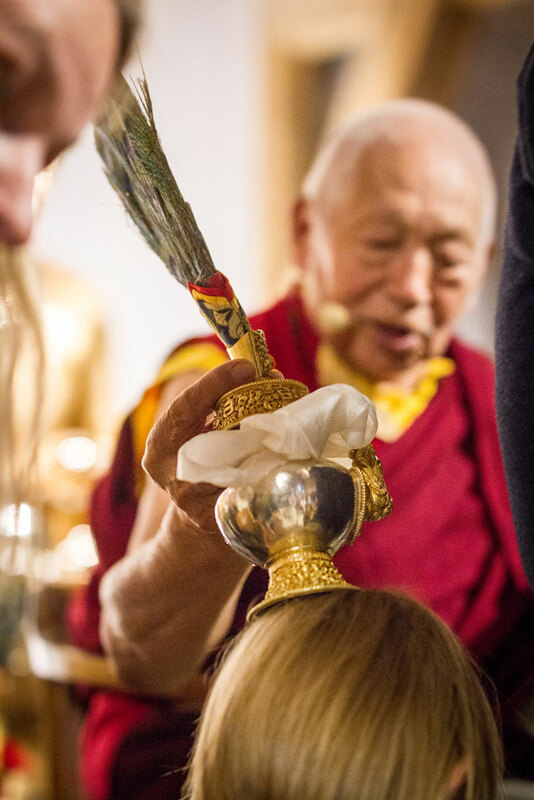 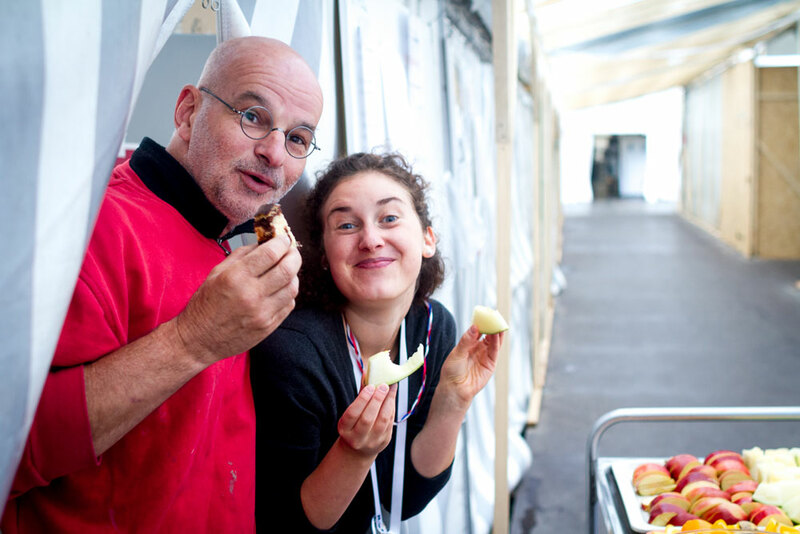 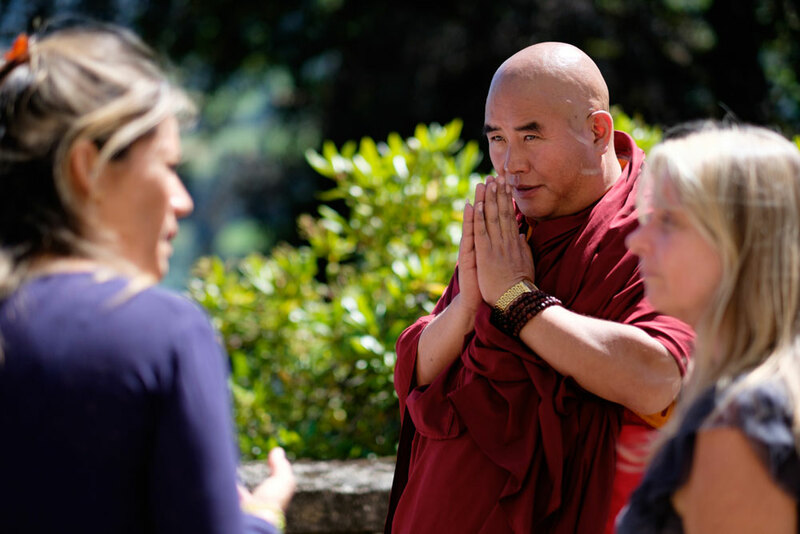 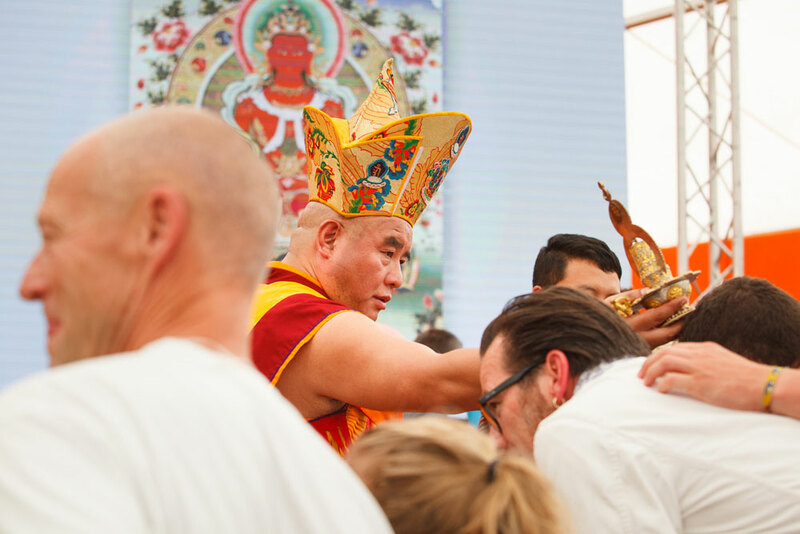 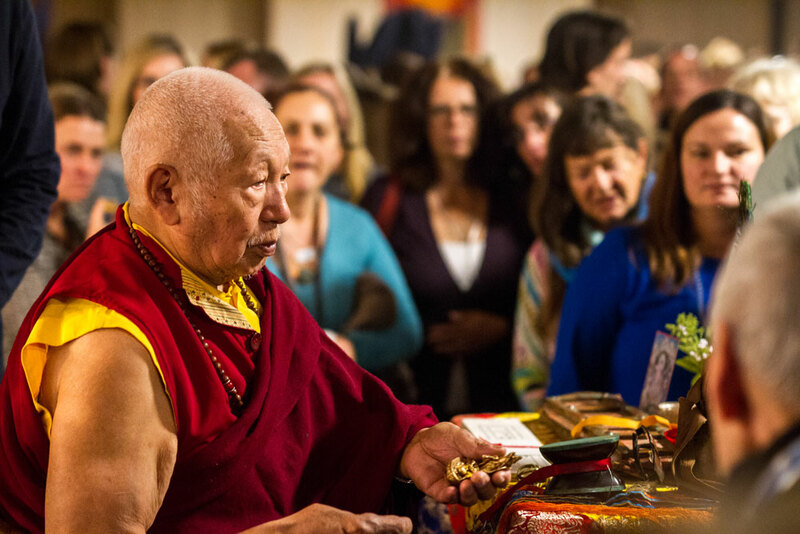 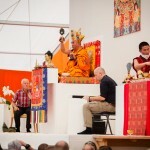 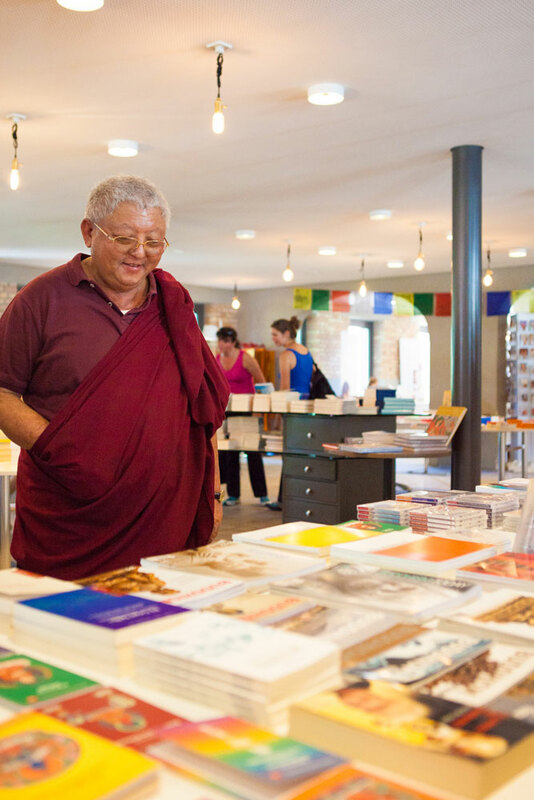 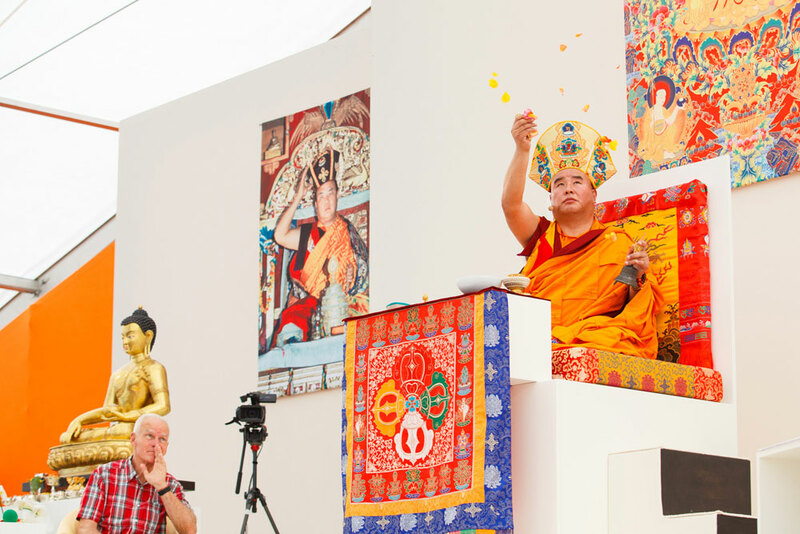 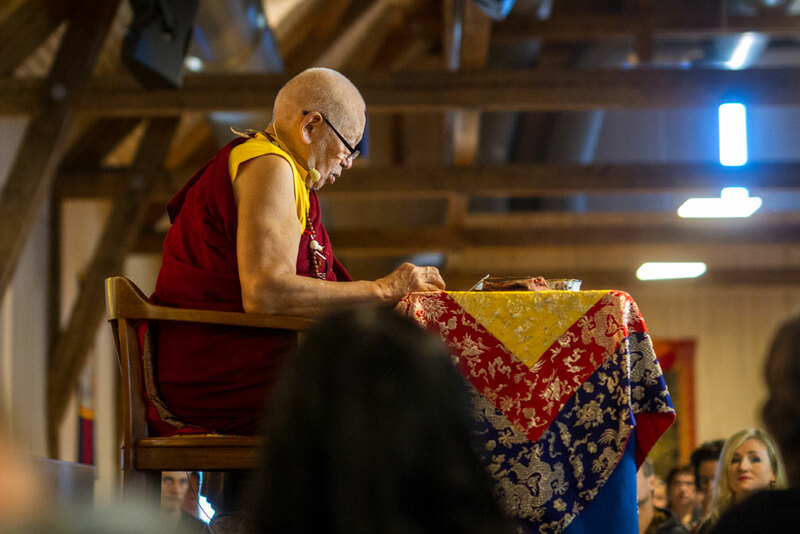 With only ten day notice beforehand, we had the wonderful chance to host a long weekend with Lama Toensang of Montchardon in France at the Europe Center. 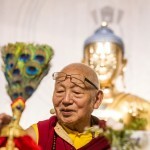 Lama Toensang spent his youth in Tibet, under the guidance of H.H. 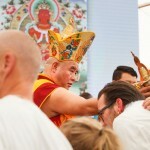 the 16th Karmapa Rangjung Rigpe Dorje. 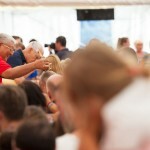 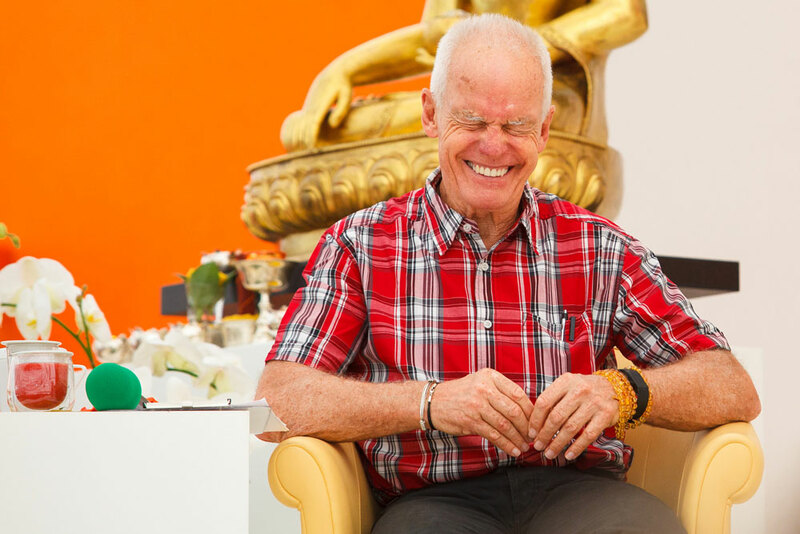 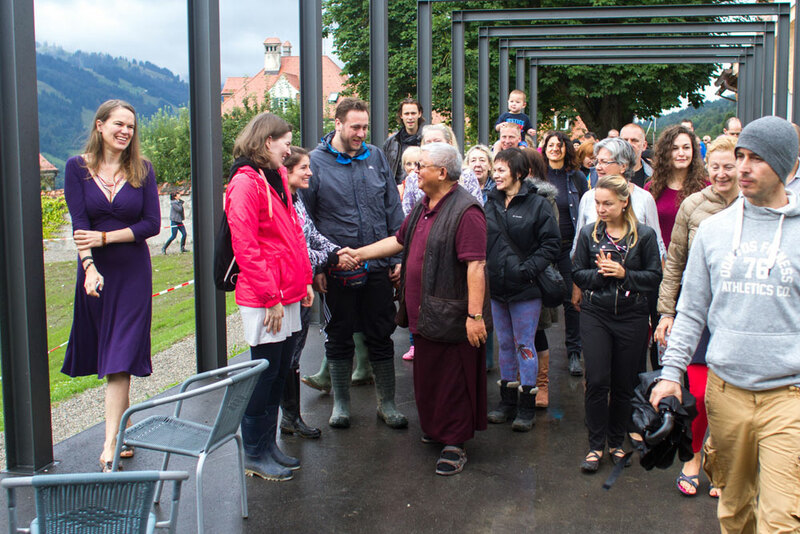 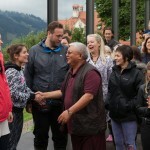 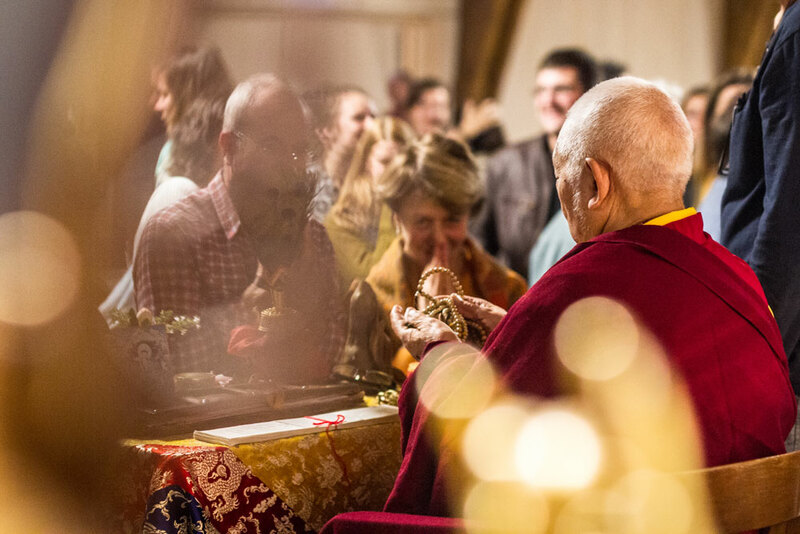 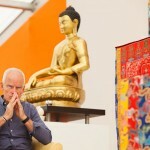 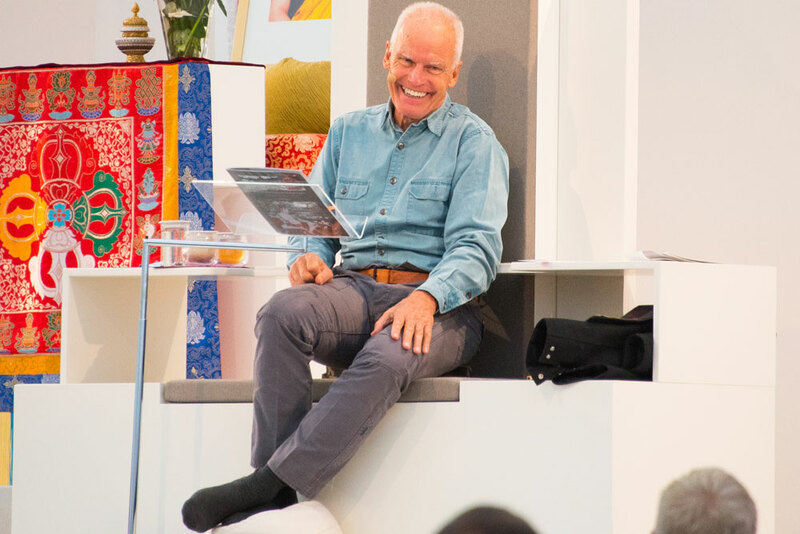 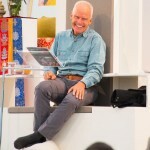 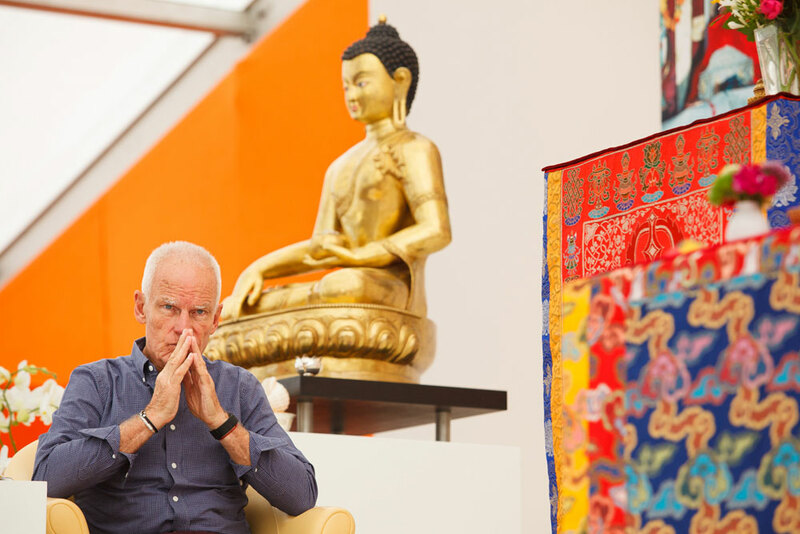 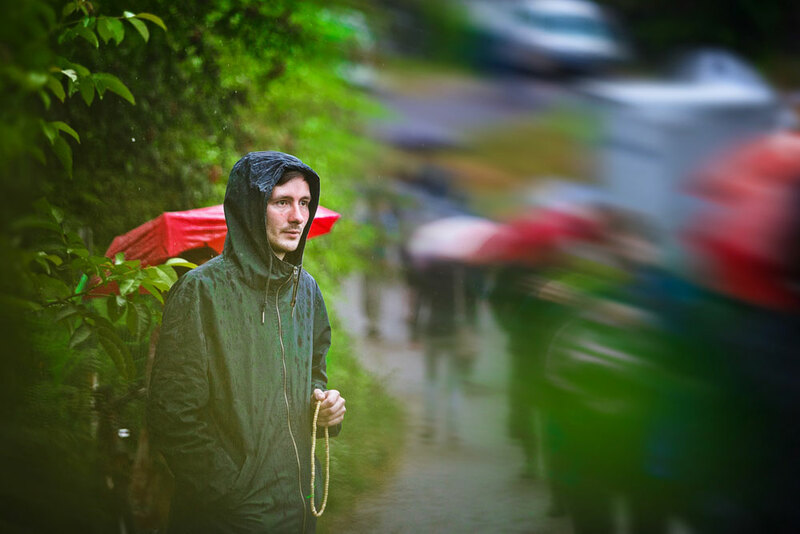 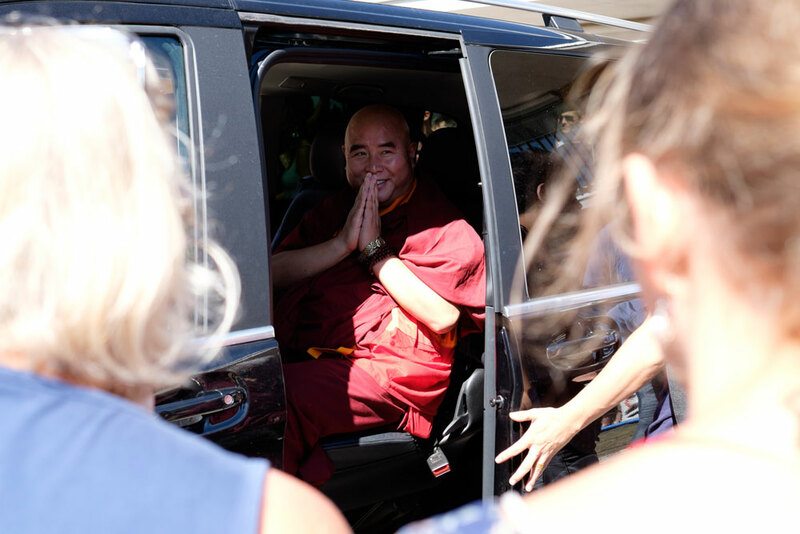 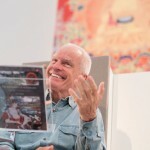 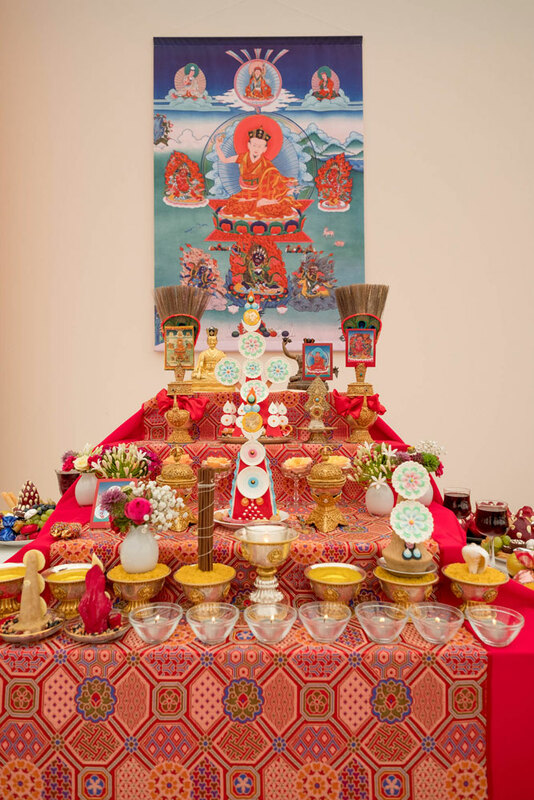 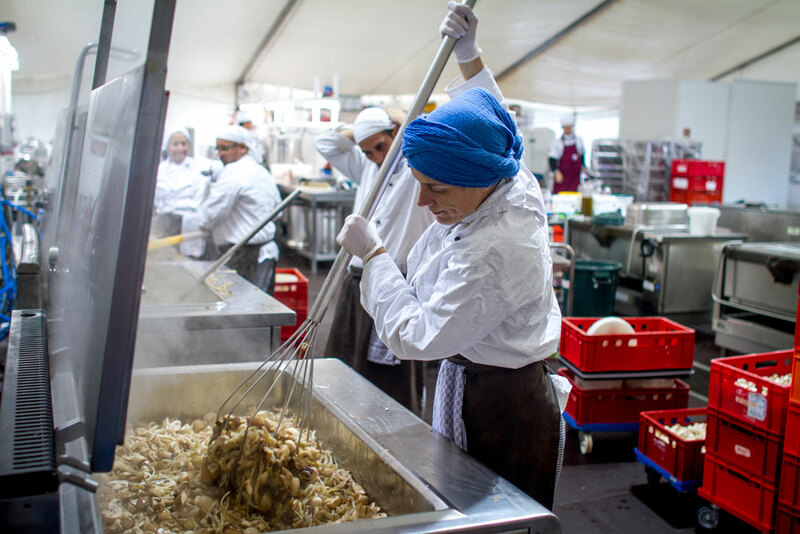 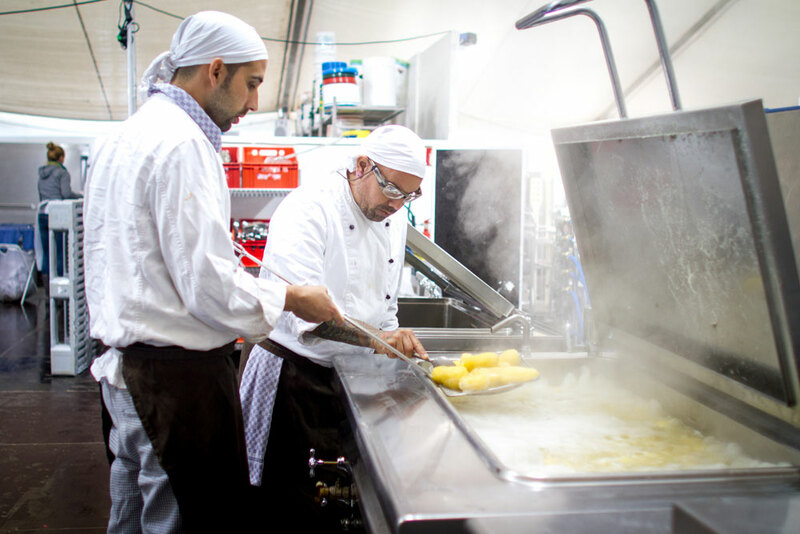 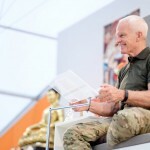 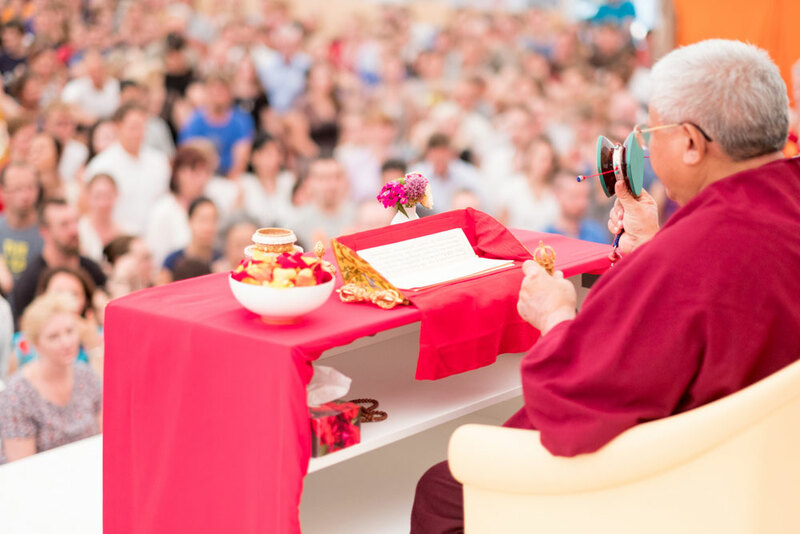 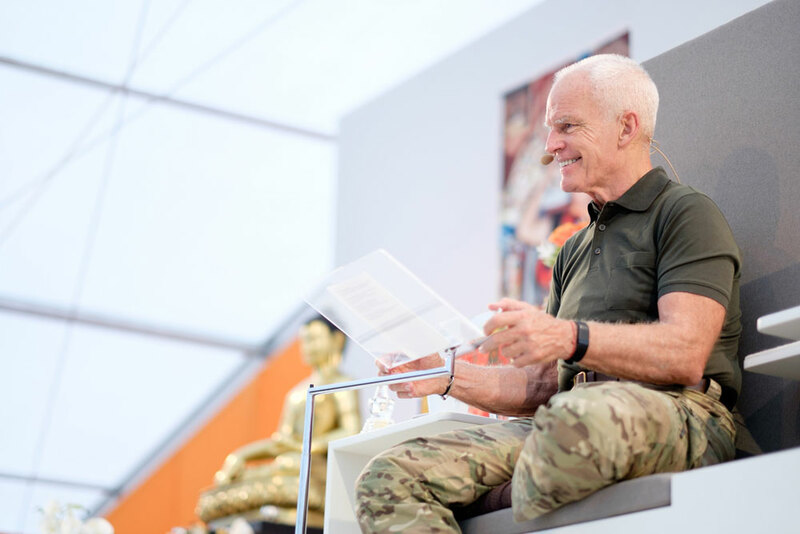 Through his tireless efforts and his exceptional personality, he built up a flourishing Buddhist center in Montchardon, welcoming many visitors from all over Europe each year. 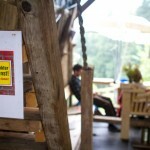 The many international visitors are not the only similarity of Montchardon and the Europe Center. 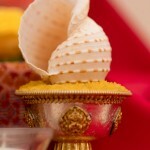 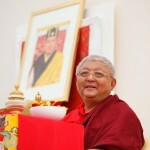 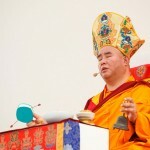 Both are lay Buddhist centers of the Karma Kagyu lineage under the spiritual guidance of the 17th Karmapa Thaye Dorje. 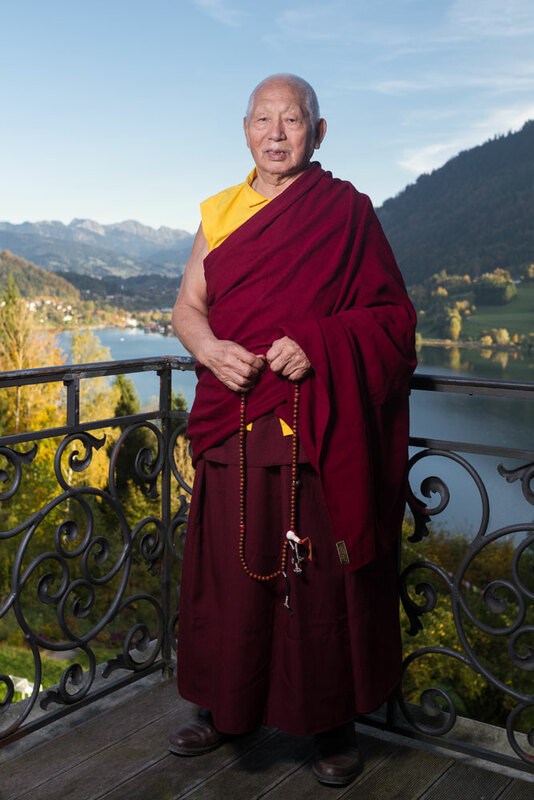 Originally from the region of Kham in Eastern Tibet, Lama Toensang was born in 1934 into a family of lay Lamas. 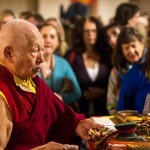 Drawn to spiritual practice already in his early years, he spent eight years of his youth traveling the holy places of Tibet. 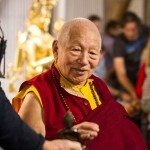 At the age of 17 he was ordained at the monastery of the Karmapa in Tsurphu. 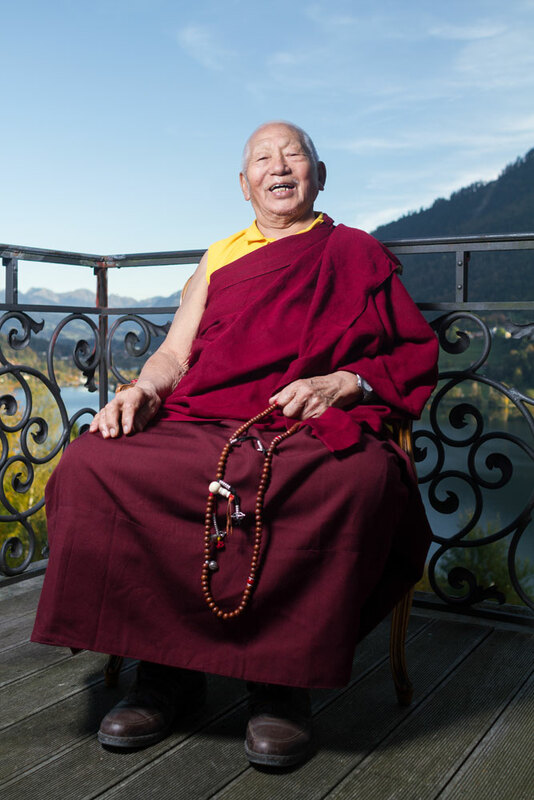 In 1959, he fled from the Chinese invasion and spent time in Rumtek, Gyalwa Karmapa’s main monastery in India. 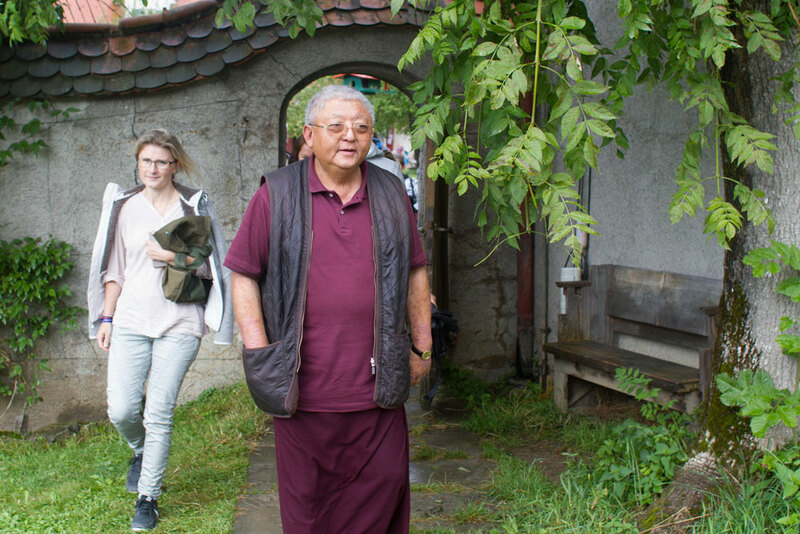 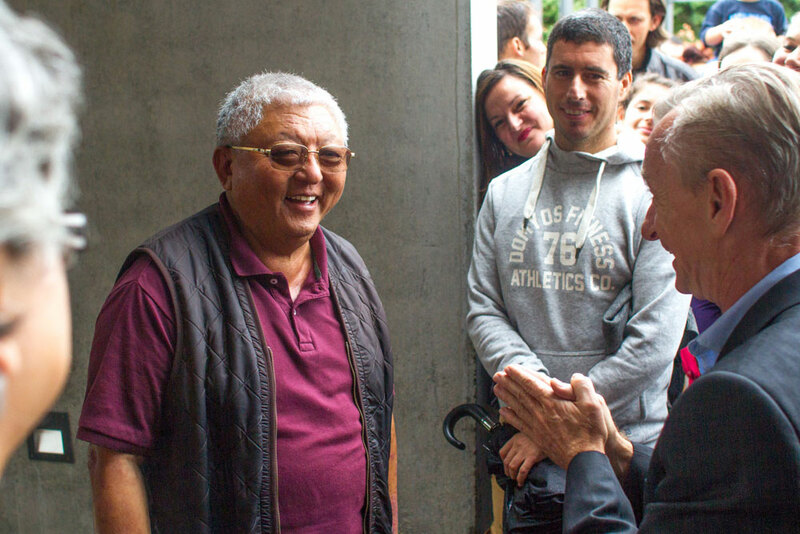 After many years of retreat in Sonada, he became the spiritual director of Montchardon at the request of the 16th Karmapa in 1976. 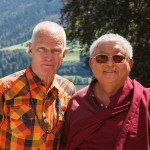 Like his old friends Lama Ole and Hannah Nydahl, Lama Toensang was also a student of Kalu Rinpoche. 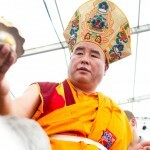 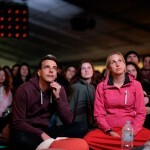 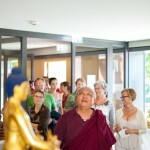 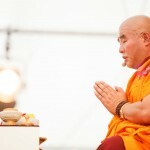 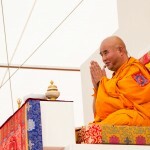 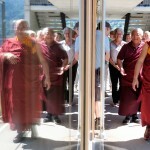 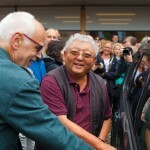 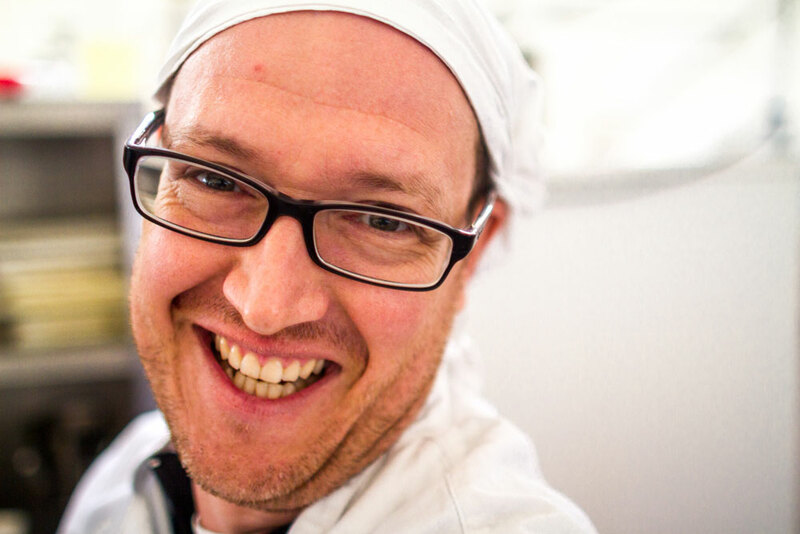 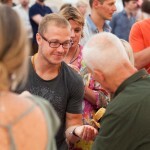 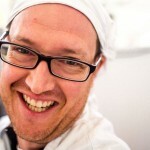 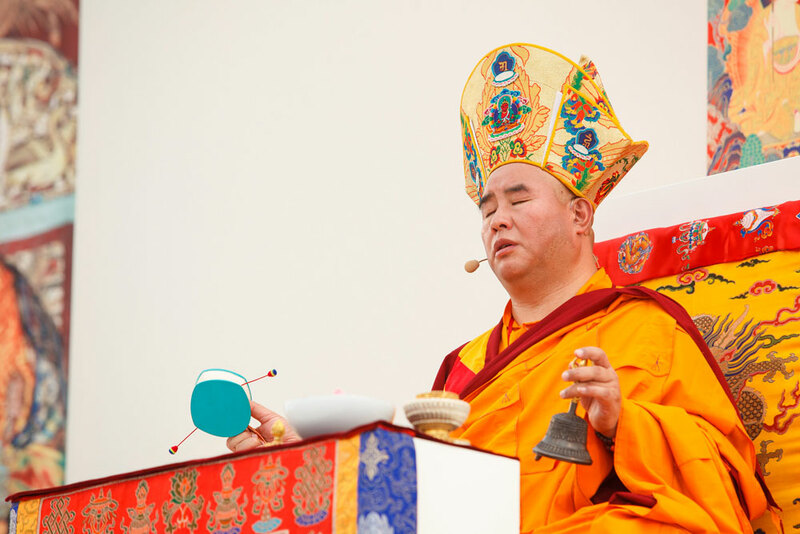 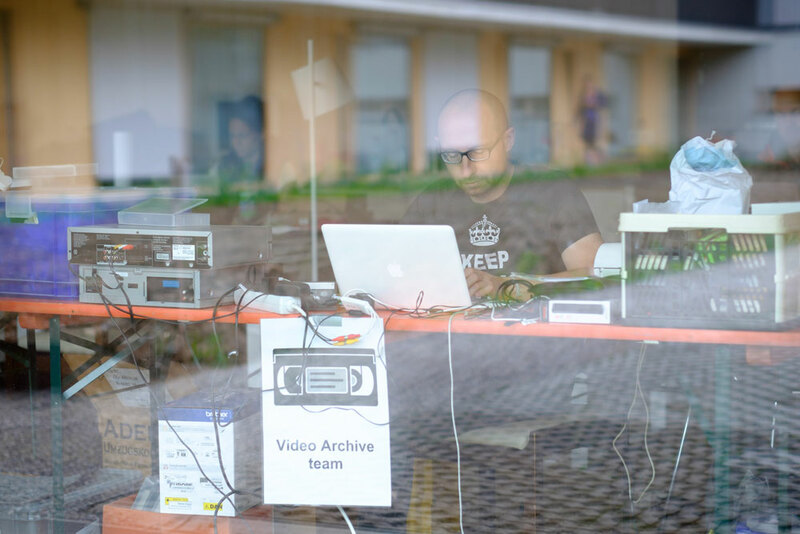 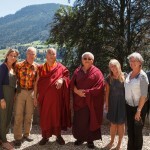 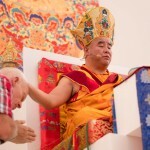 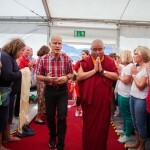 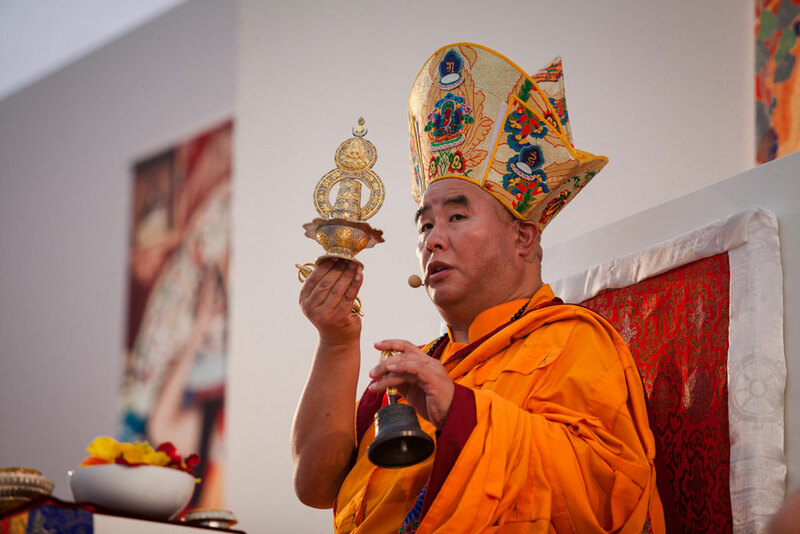 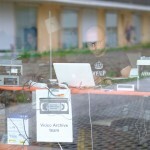 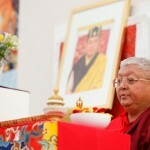 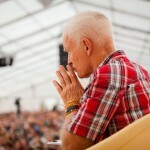 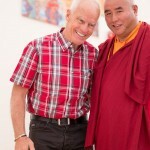 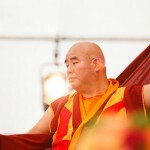 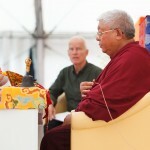 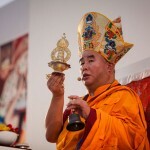 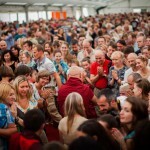 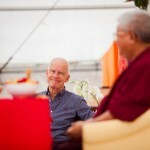 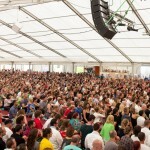 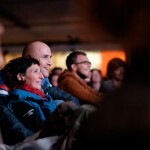 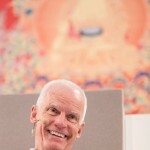 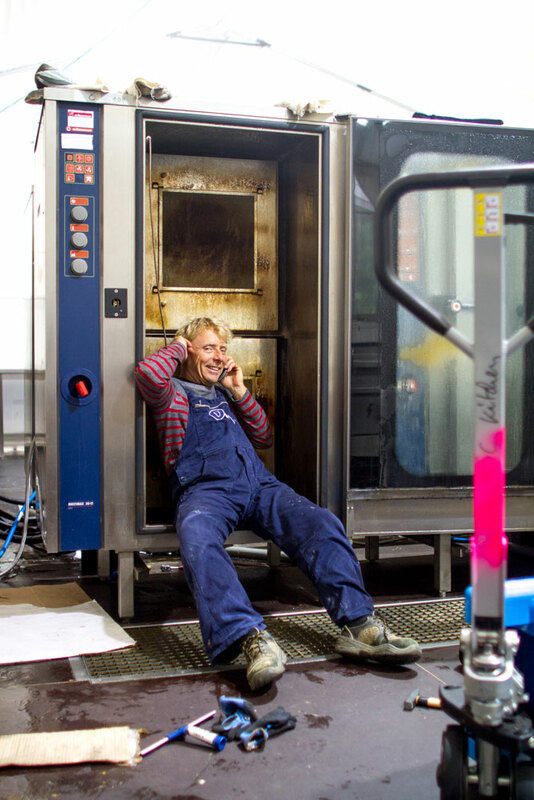 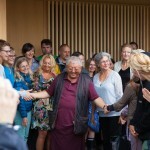 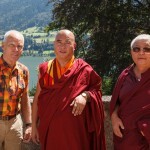 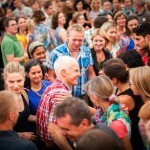 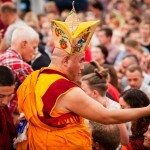 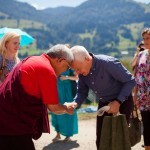 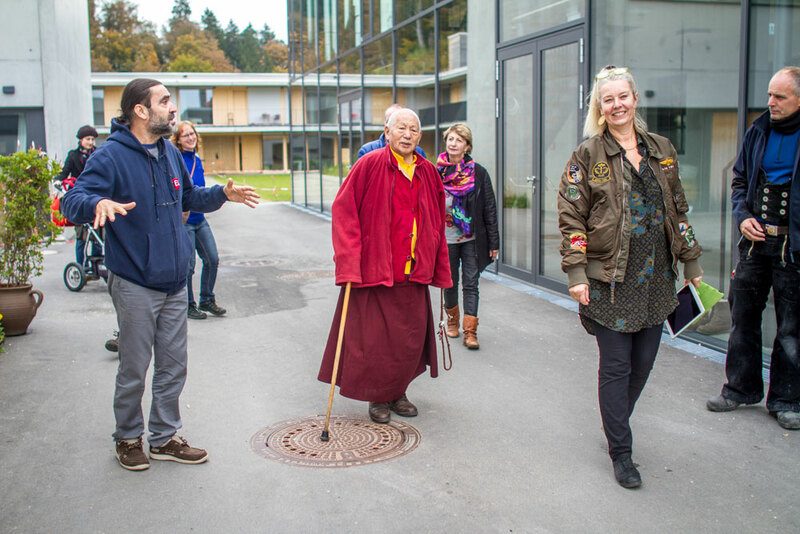 Since 2011 he has been a frequently invited special guest of Lama Ole at the EC. 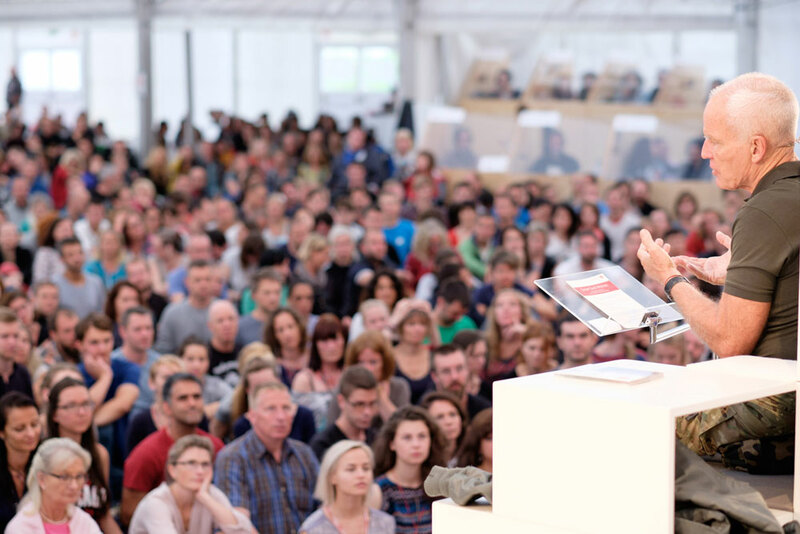 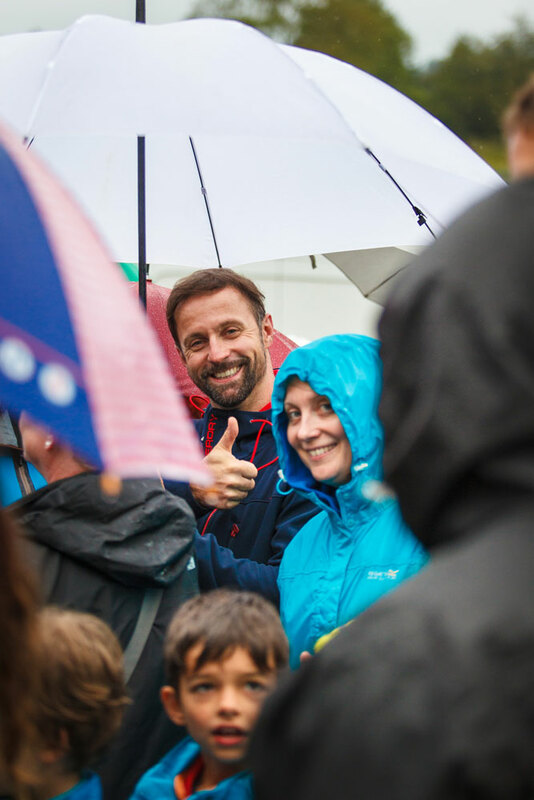 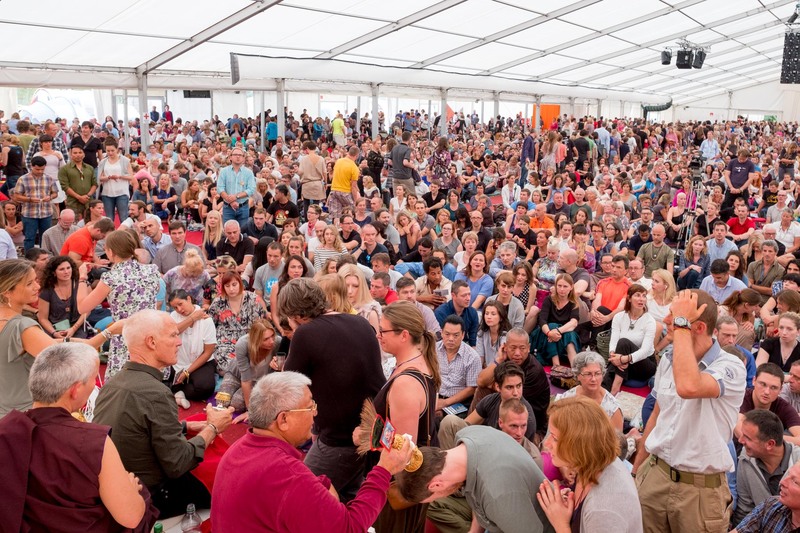 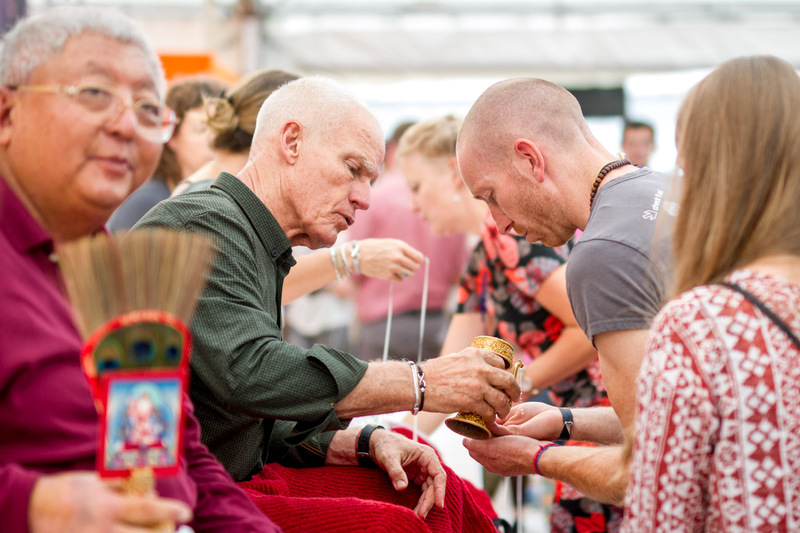 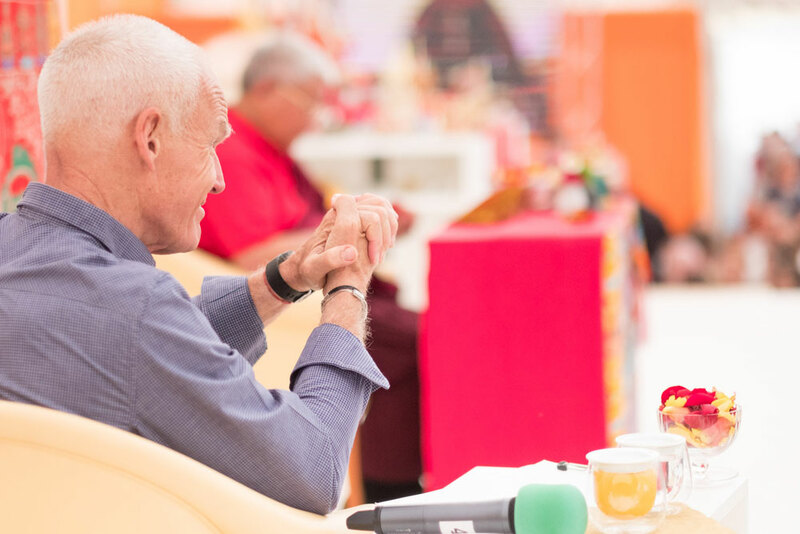 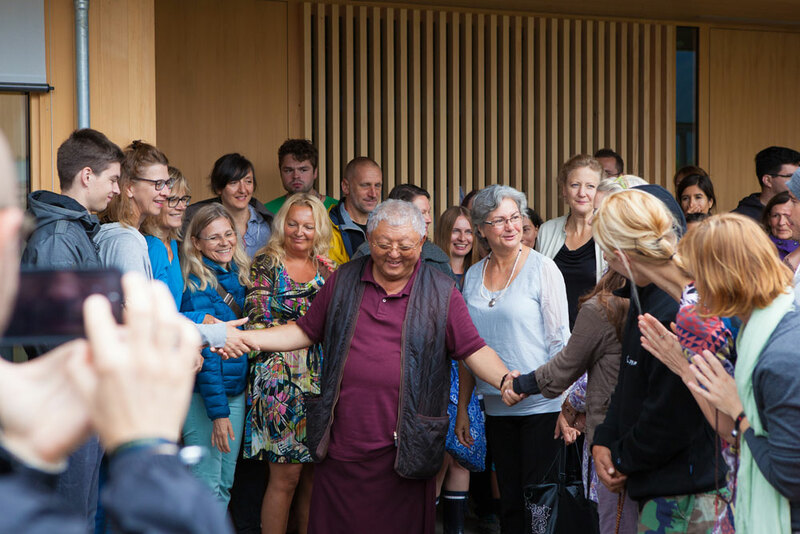 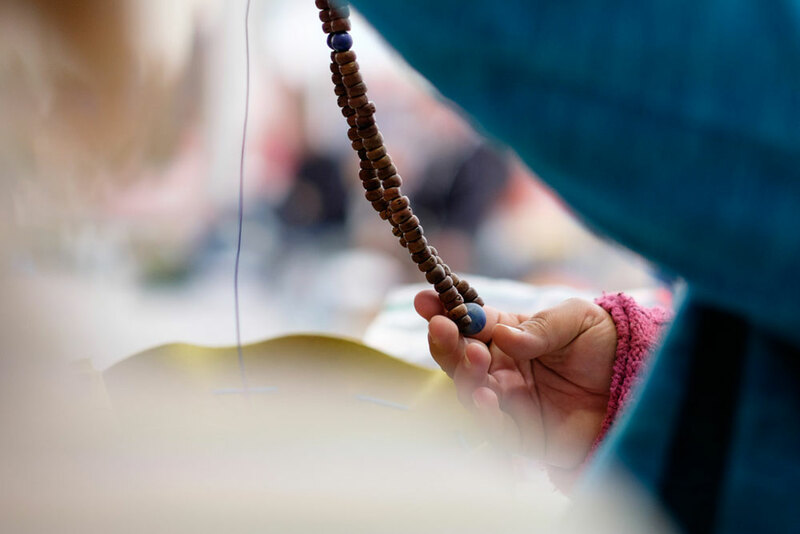 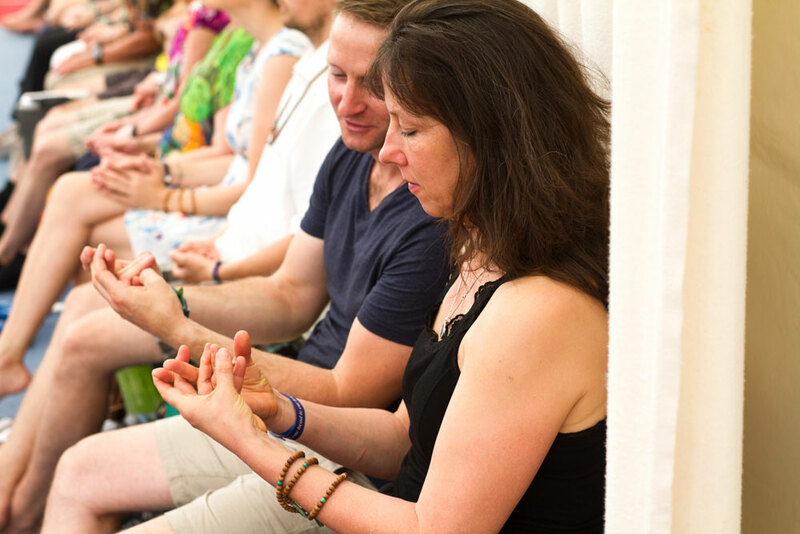 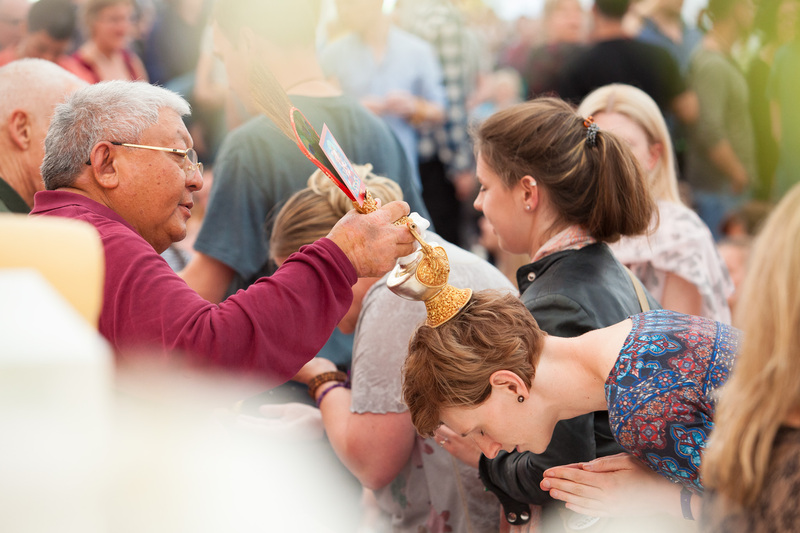 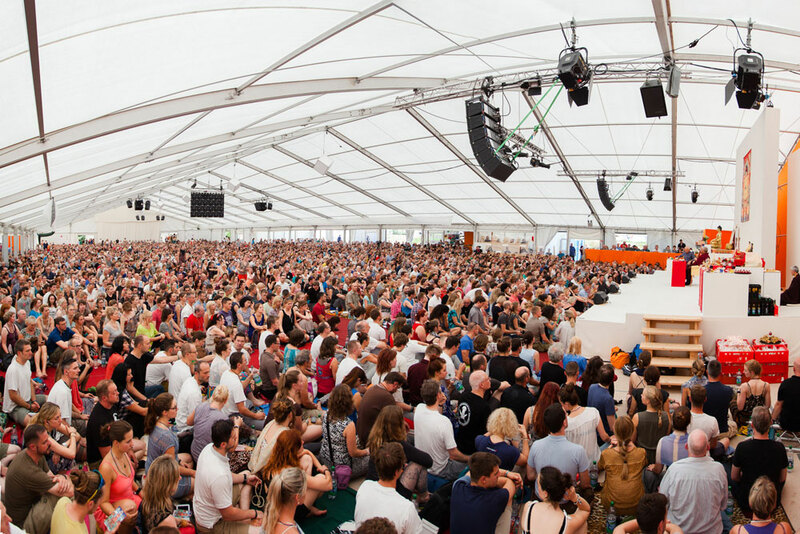 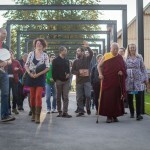 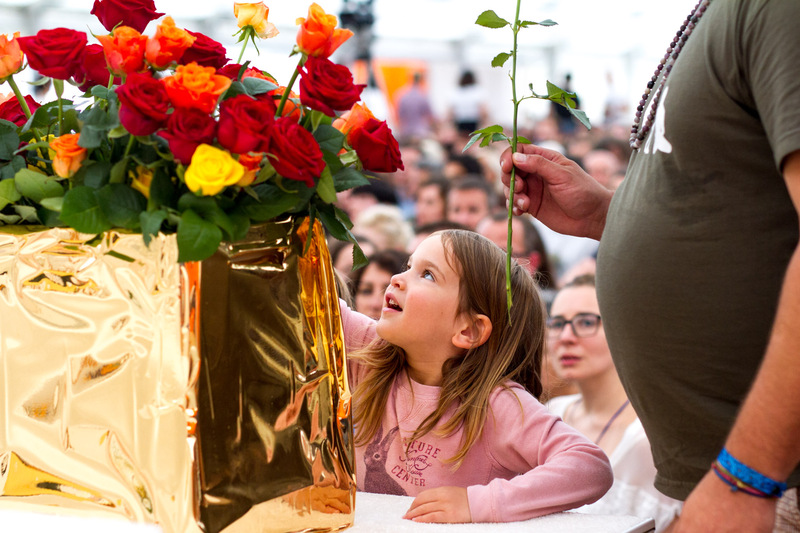 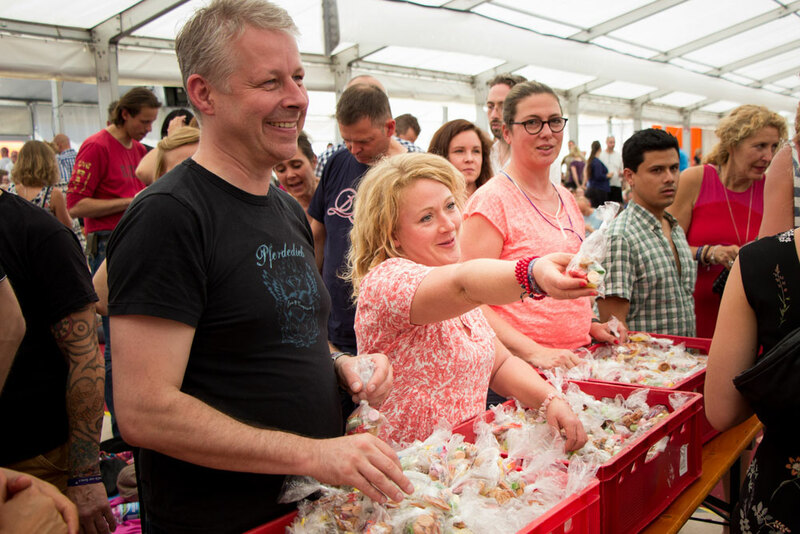 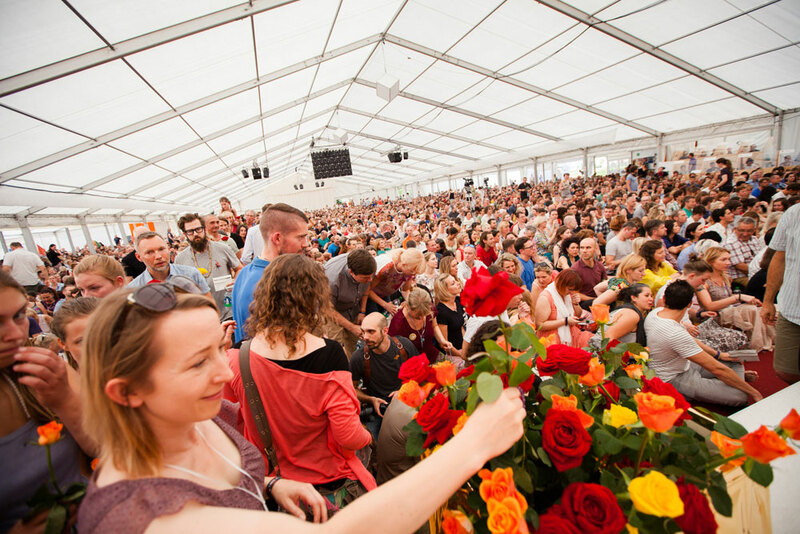 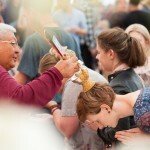 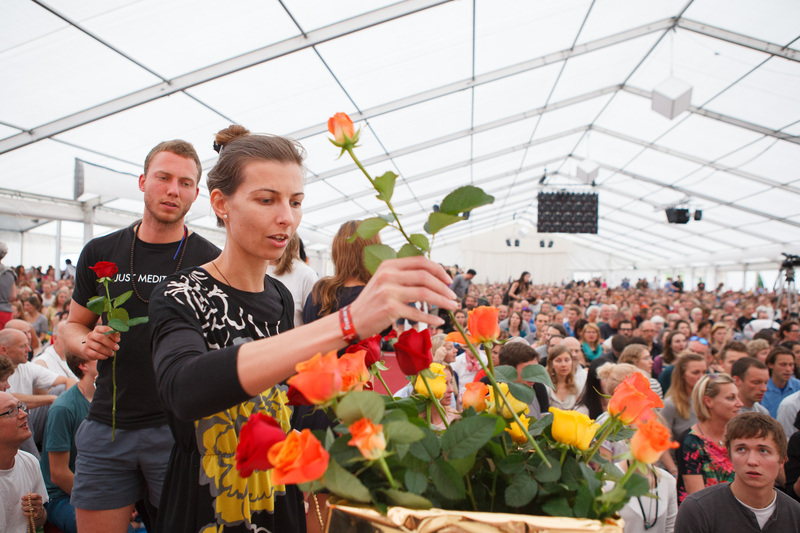 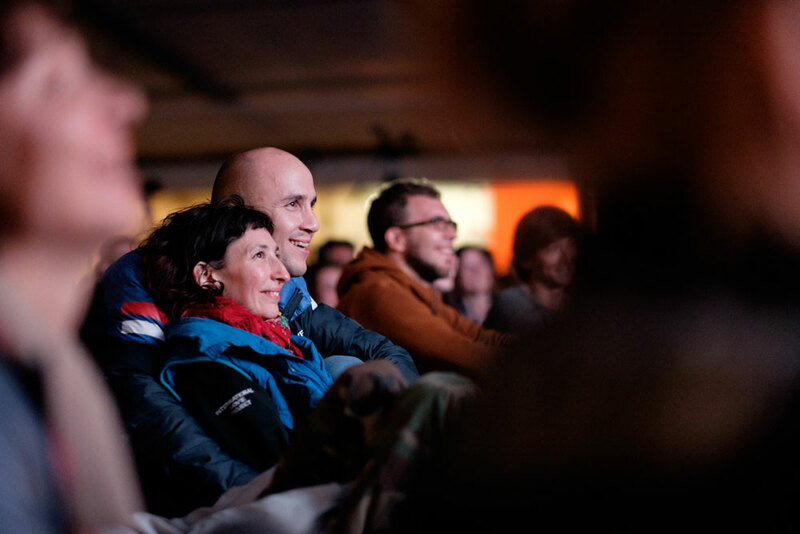 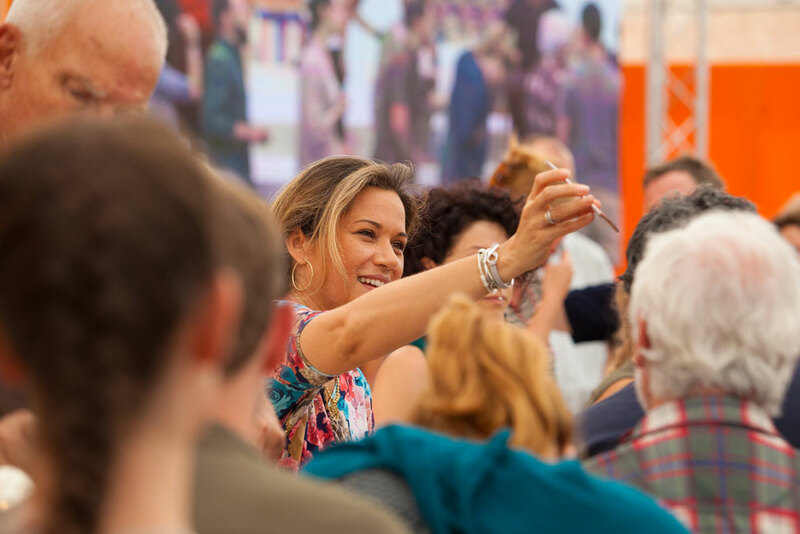 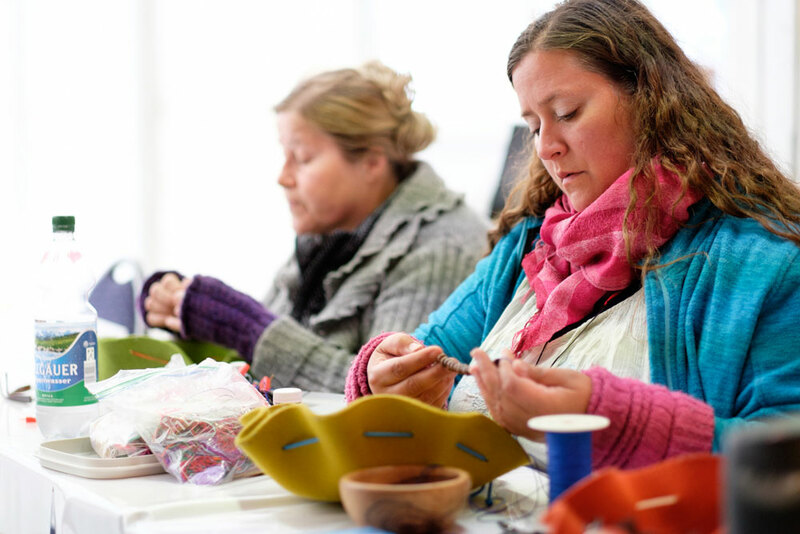 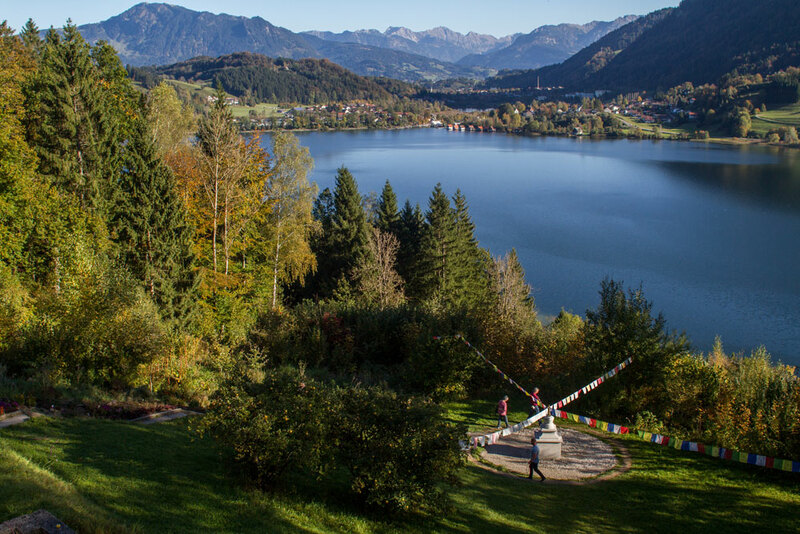 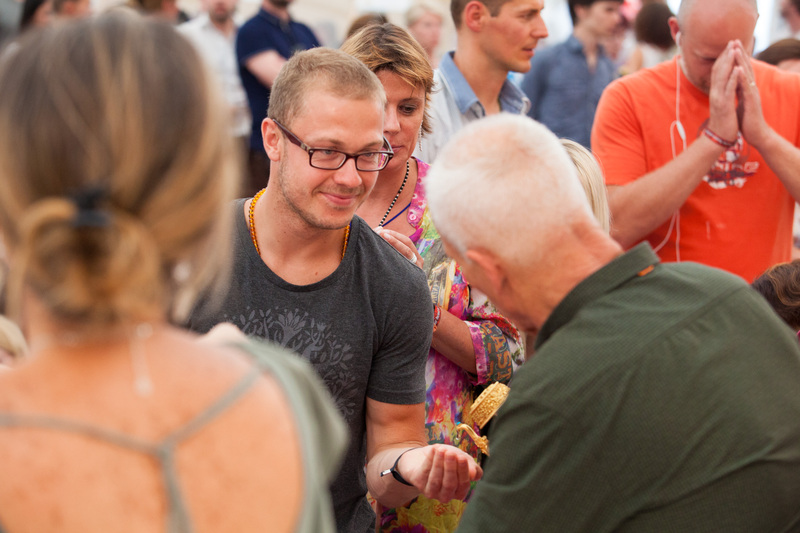 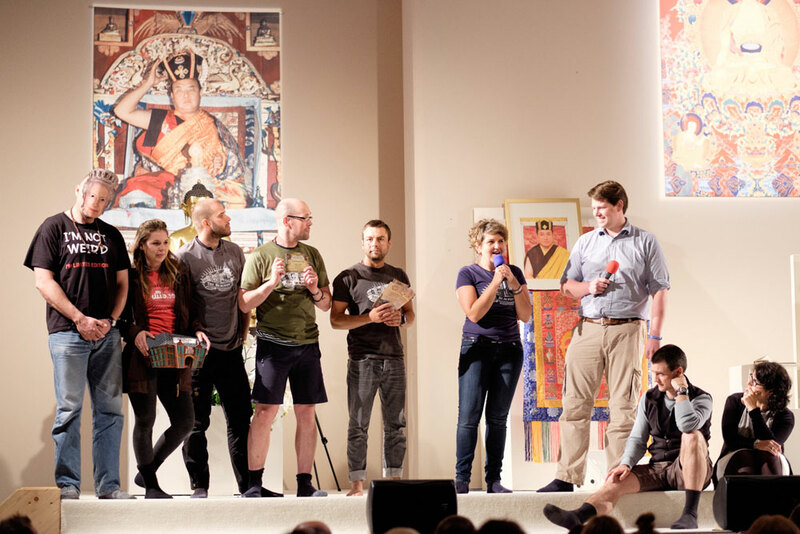 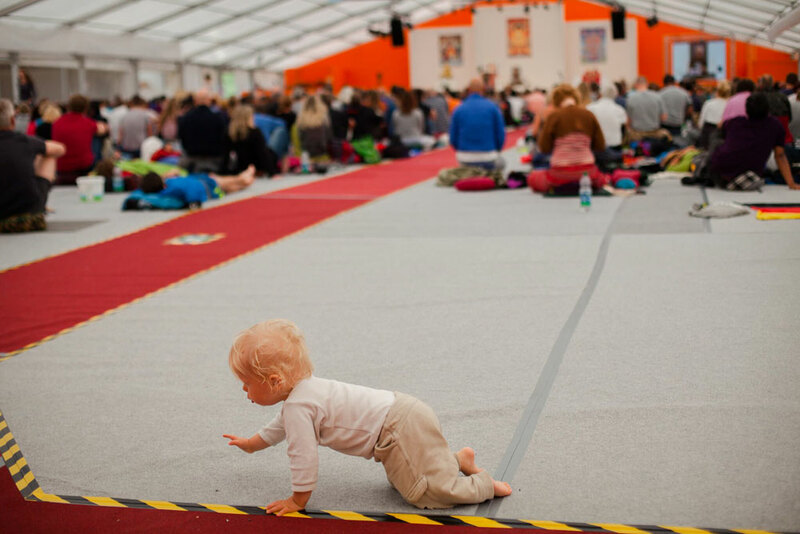 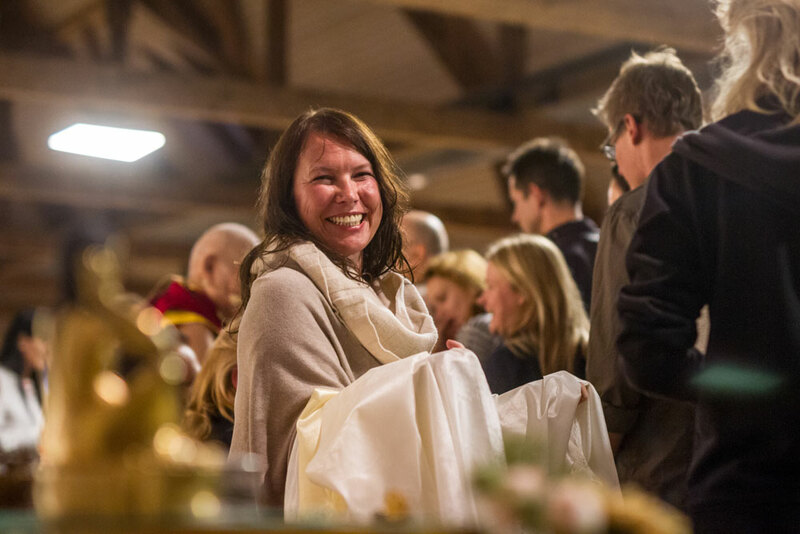 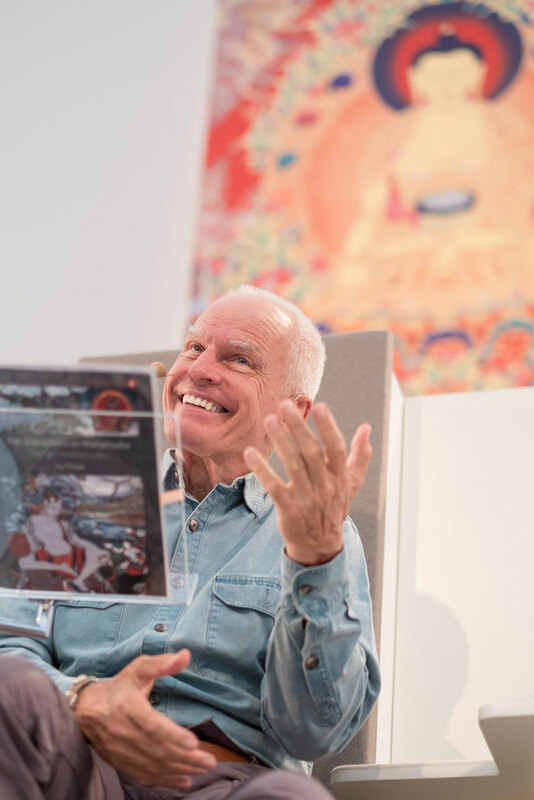 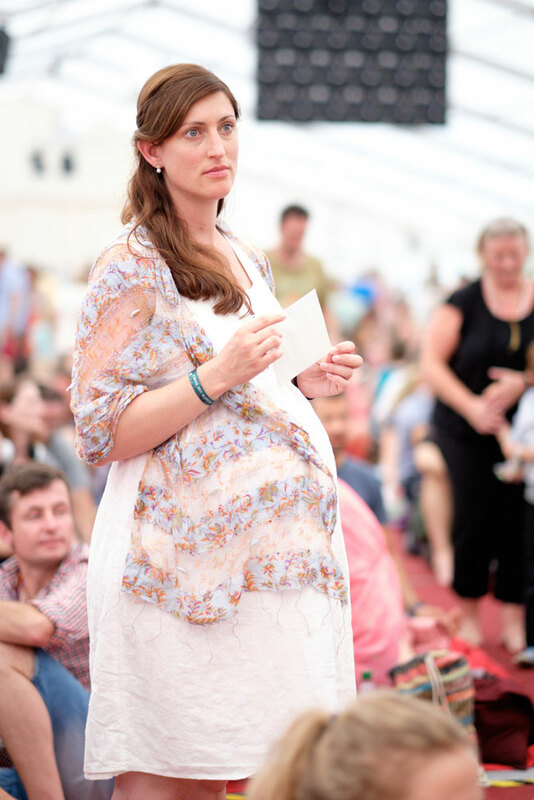 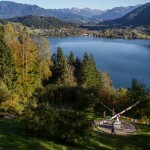 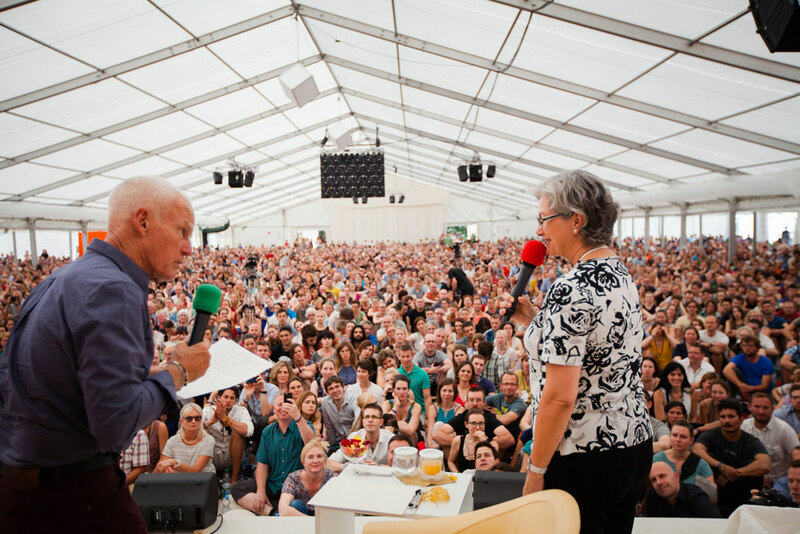 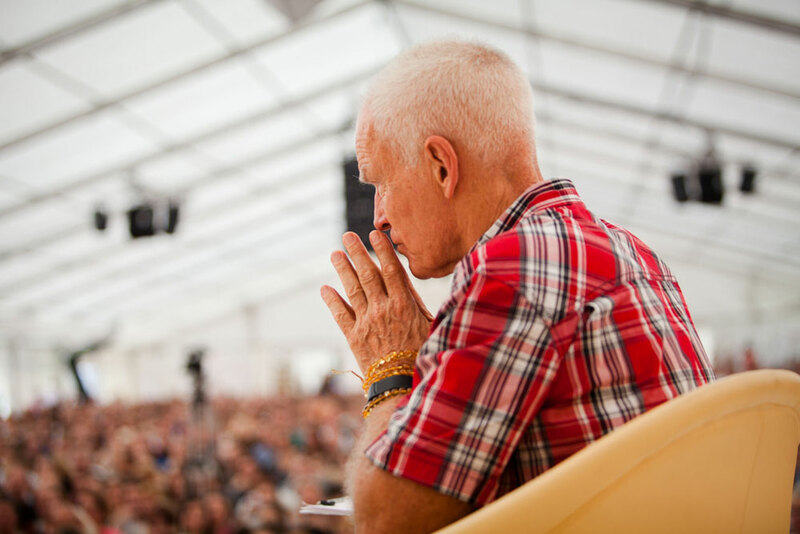 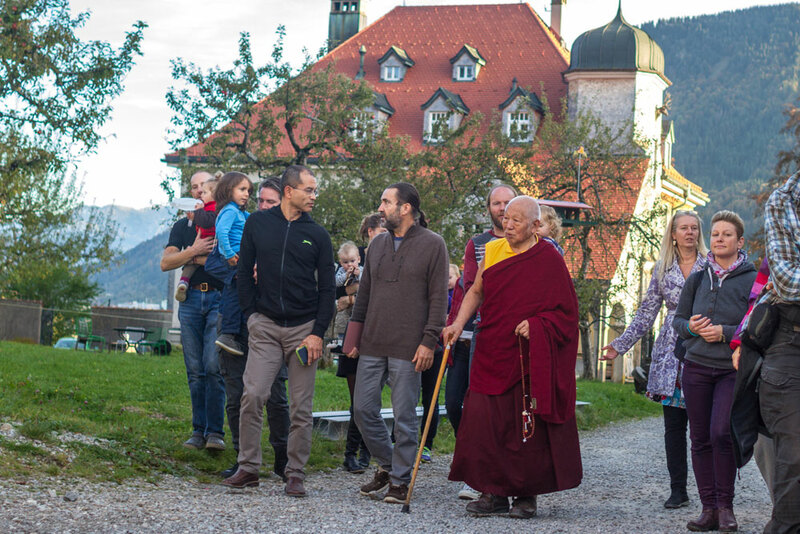 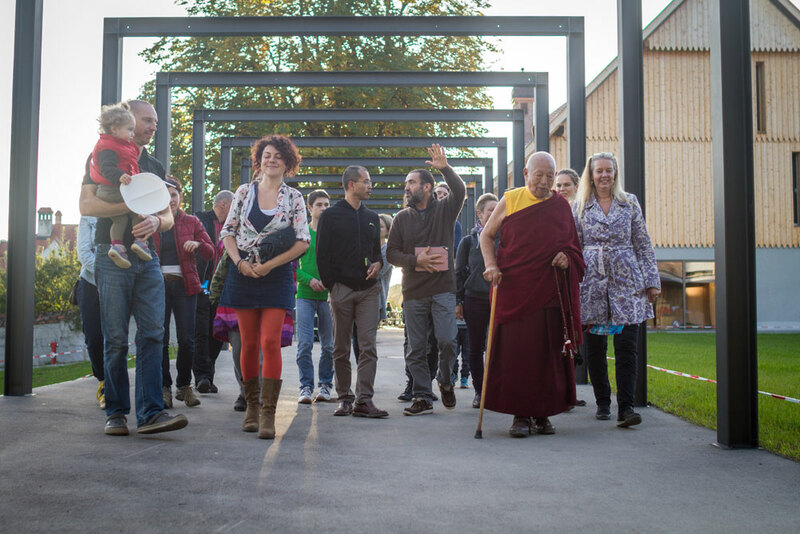 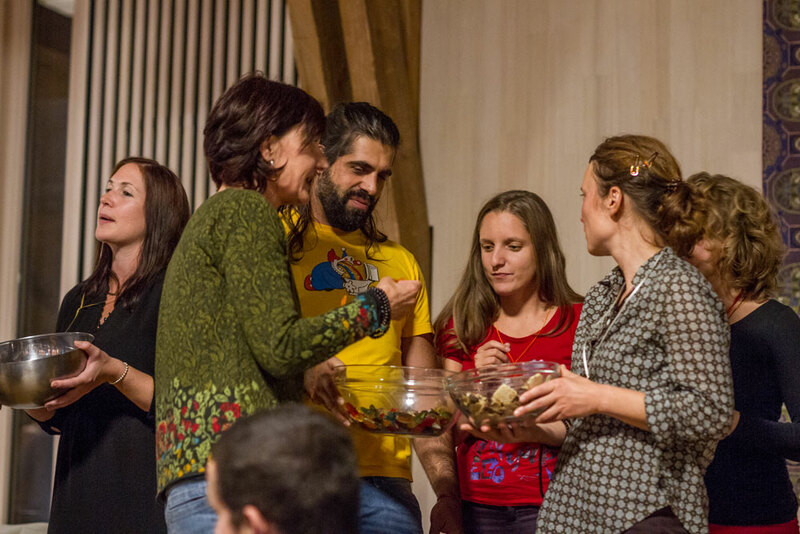 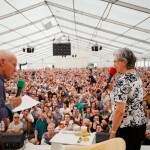 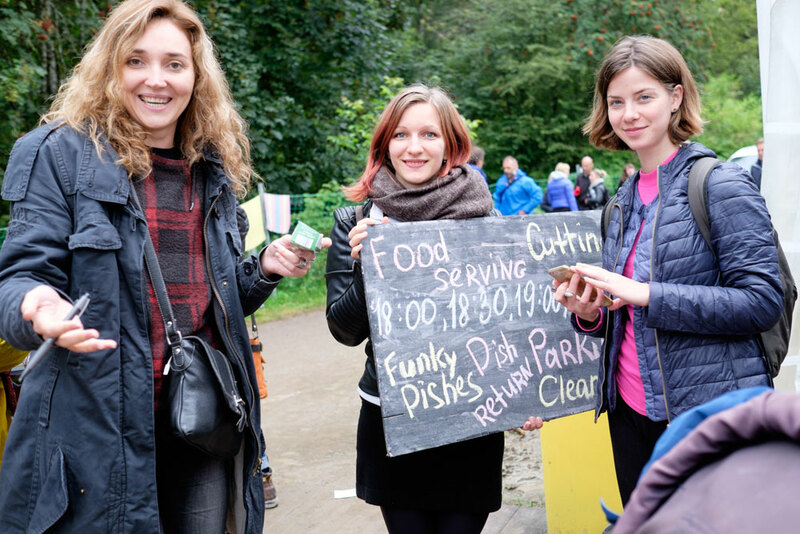 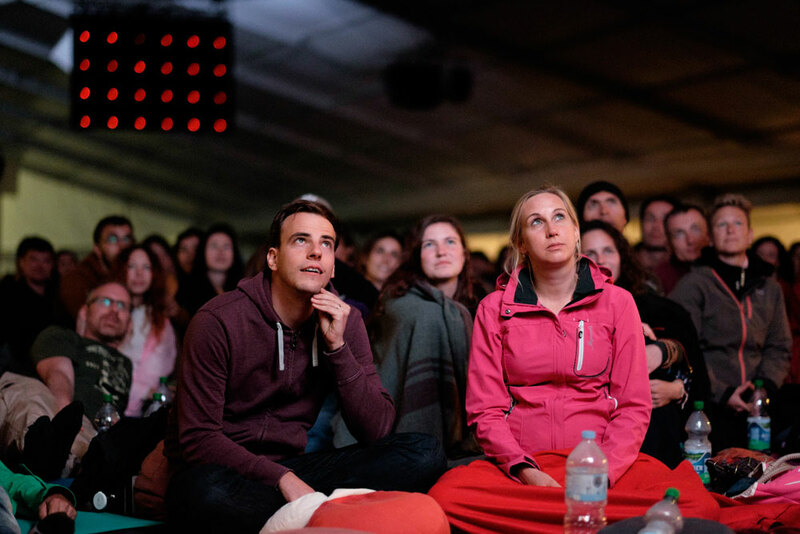 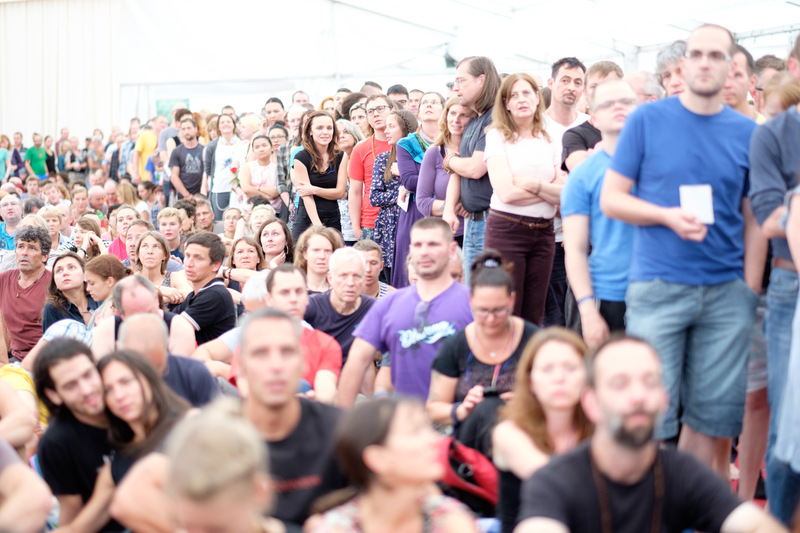 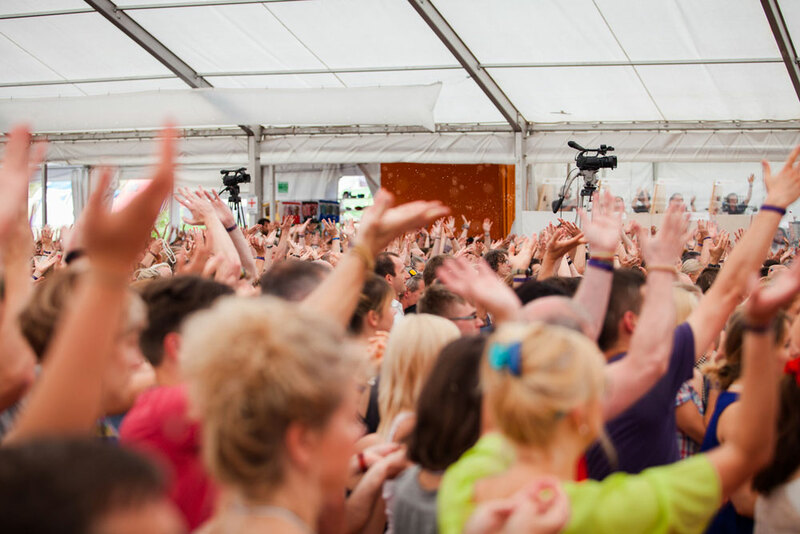 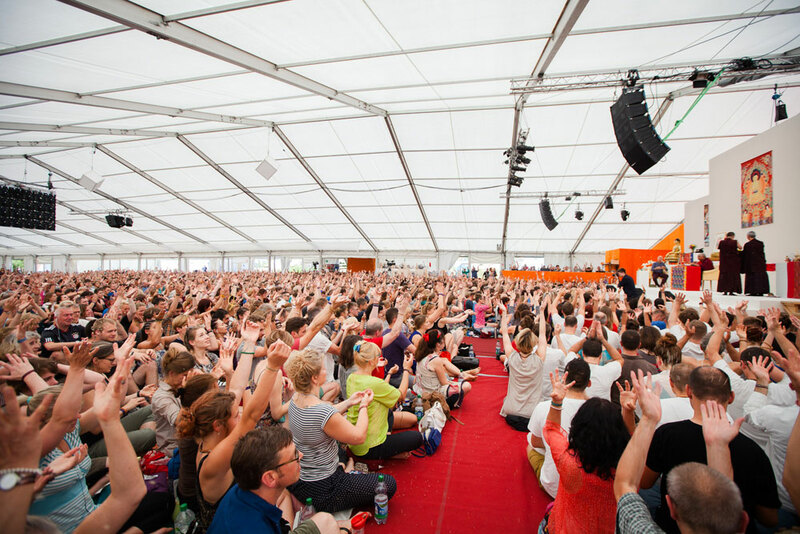 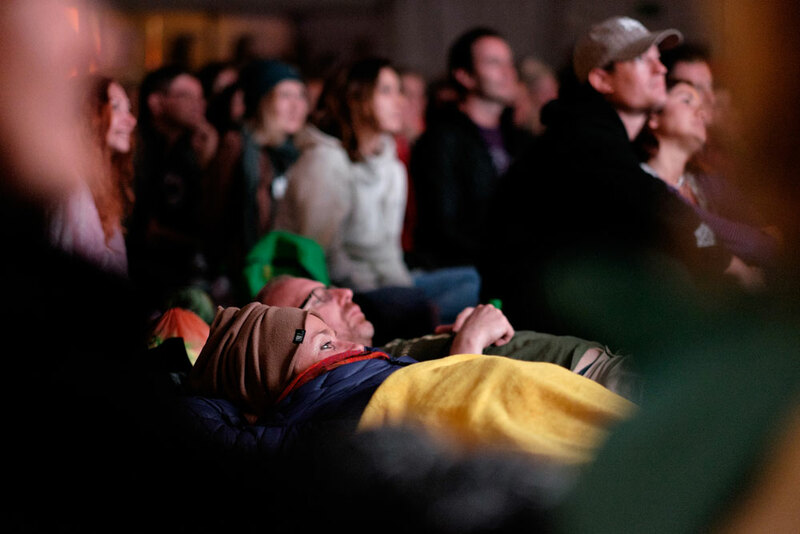 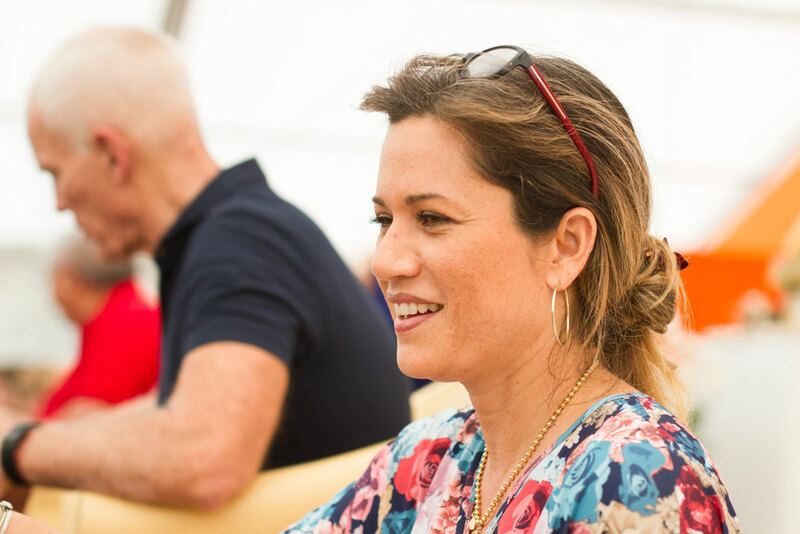 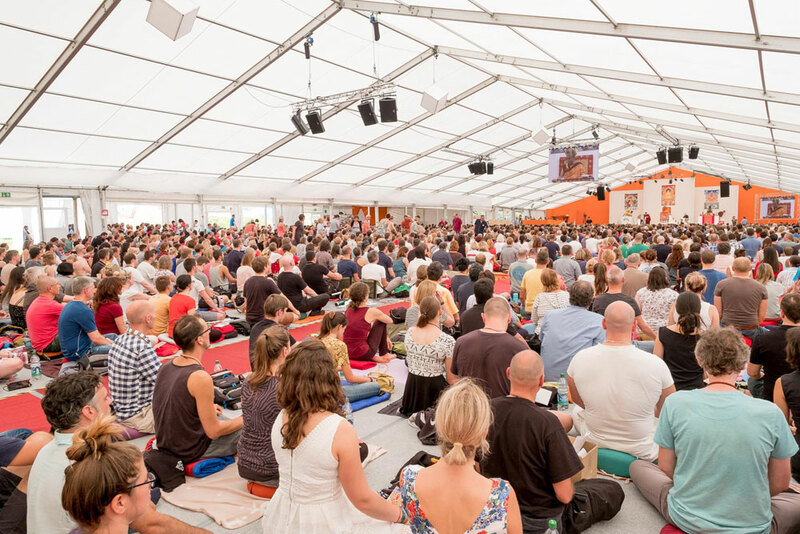 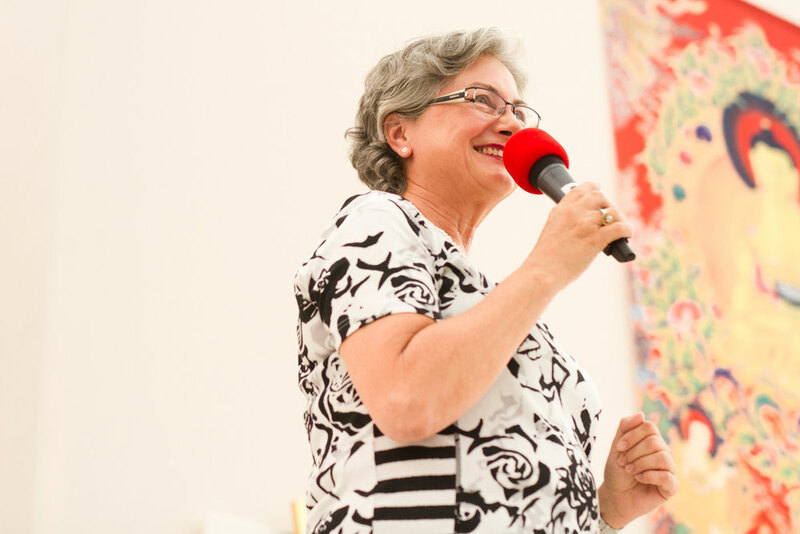 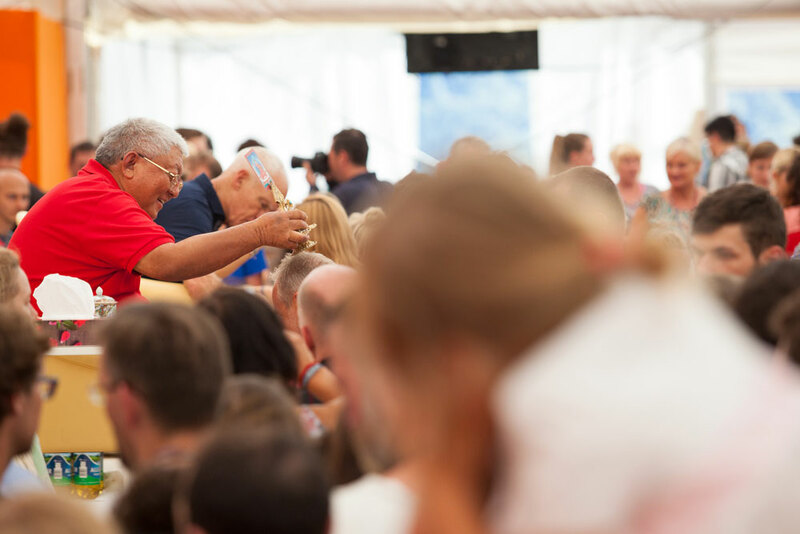 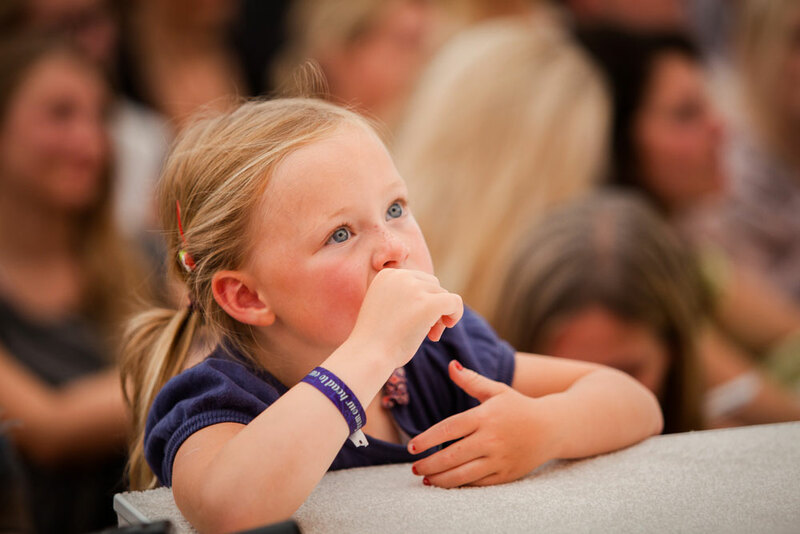 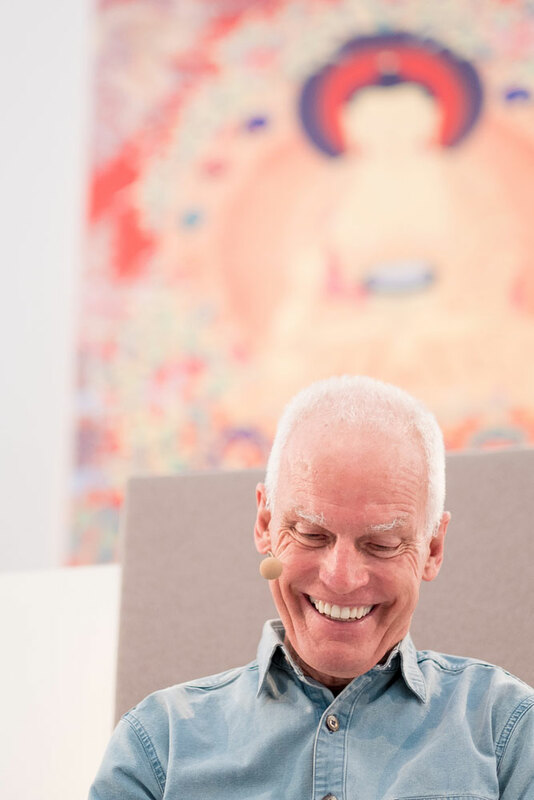 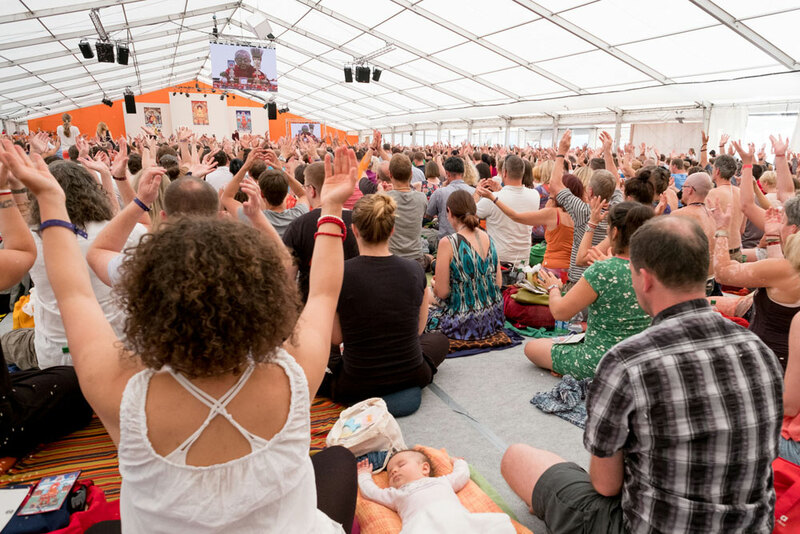 Lama Toensang came to the EC to give us the precious empowerment into Milarepa – and so much more… Despite the short notice, 700 people made it for the weekend with empowerment, lecture and spontaneous storytelling in sunny and warm autumn weather. 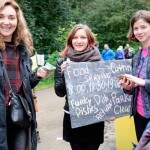 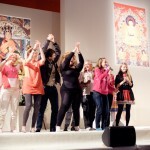 A truly memorable weekend! 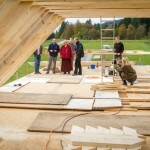 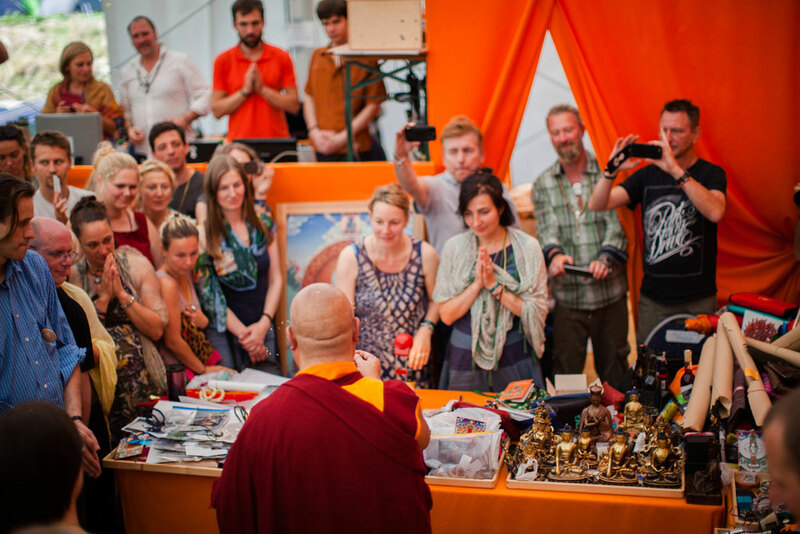 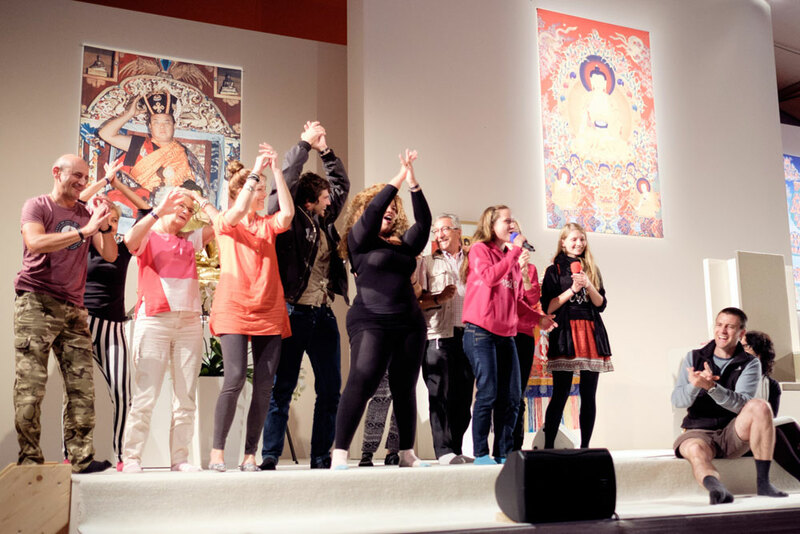 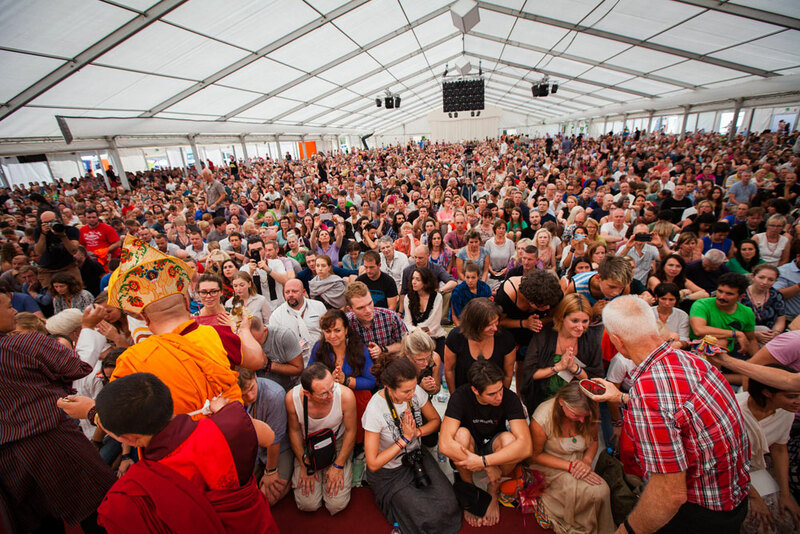 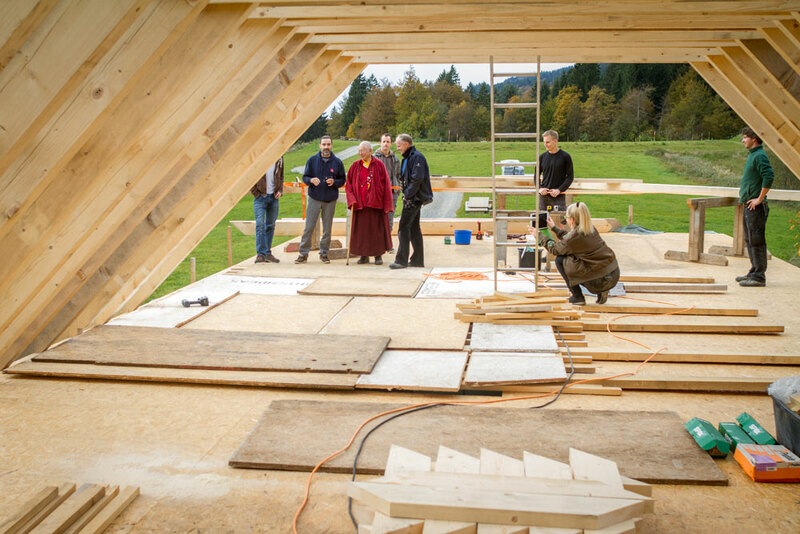 This was the fourth empowerment Lama Toensang has given at the Europe Center: A Milarepa empowerment in 2011 was the first. 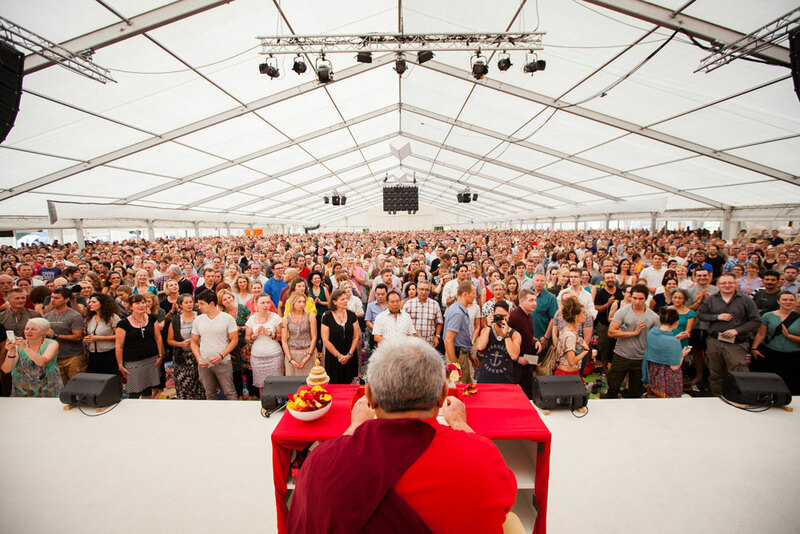 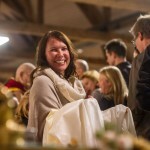 He also gave the first ever empowerment on the grounds of today’s gompa into 1000armed Loving Eyes, when it was still the old barn, in 2012. 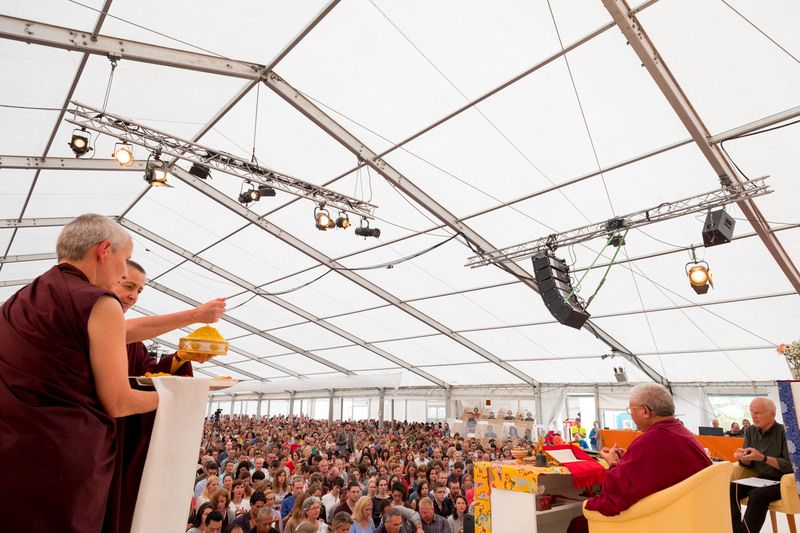 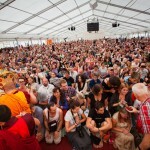 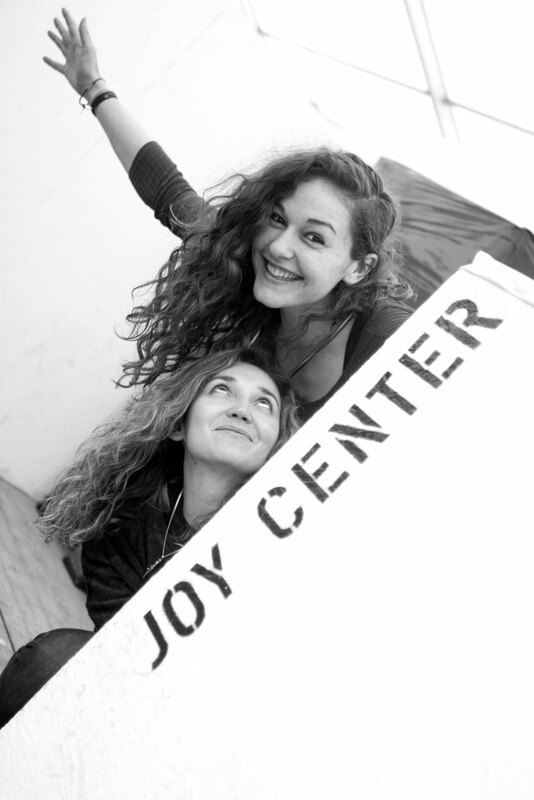 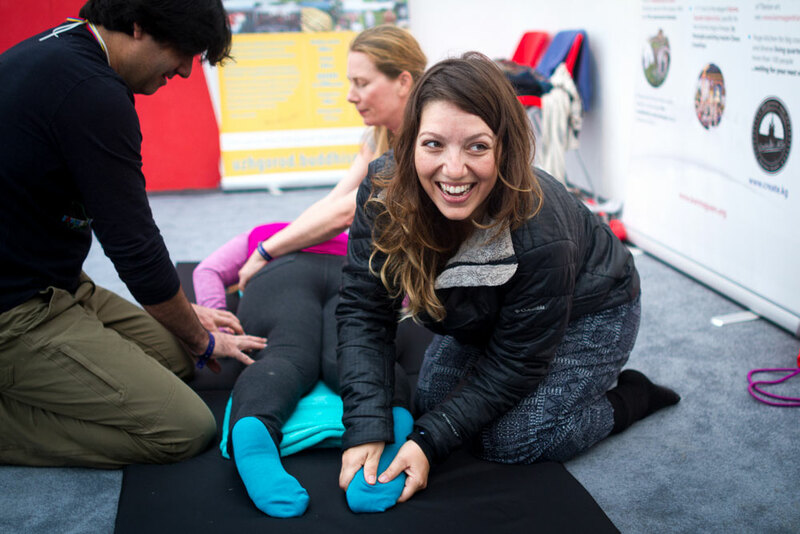 One year later, we put up a tent to host the many students receiving the empowerment into Medicine Buddha. 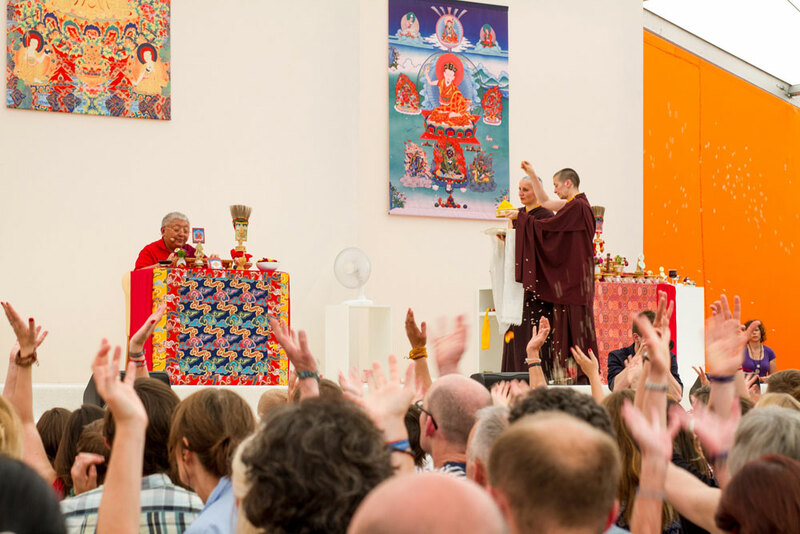 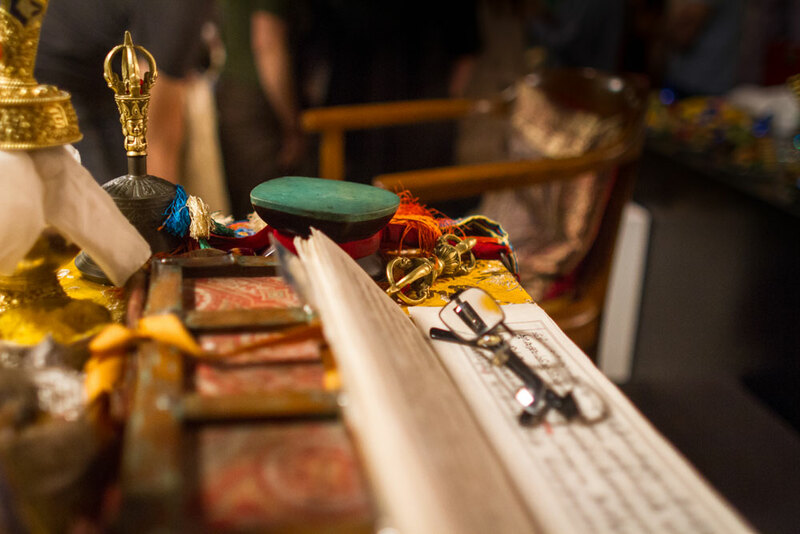 This time, however, not “only” the empowerment but also many of the inspiring stories shared by Lama Toensang were all about the impressive life of Tibet’s great yogi, Milarepa. 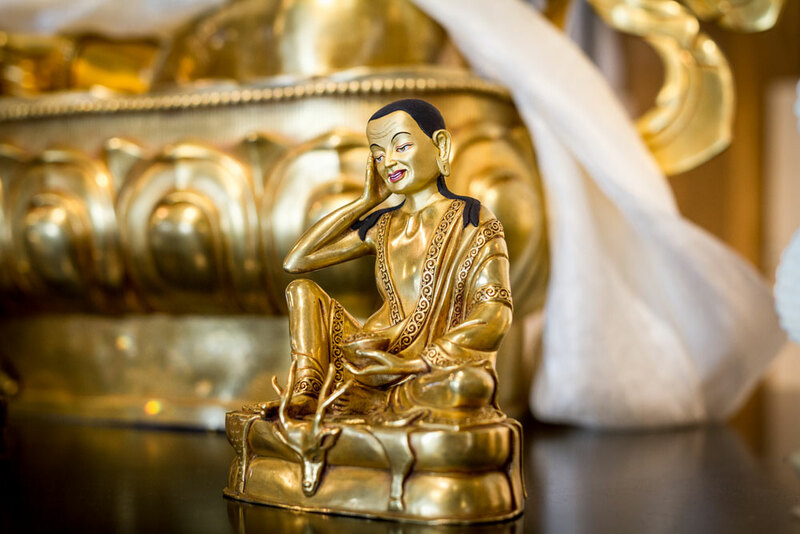 Milarepa (1052-1135) had a dark childhood, and used black magic to wreak revenge on many people who had oppressed his family. 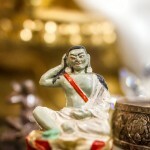 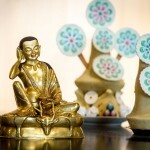 Having repented, he turned to Buddhism to purify his past misdeeds. 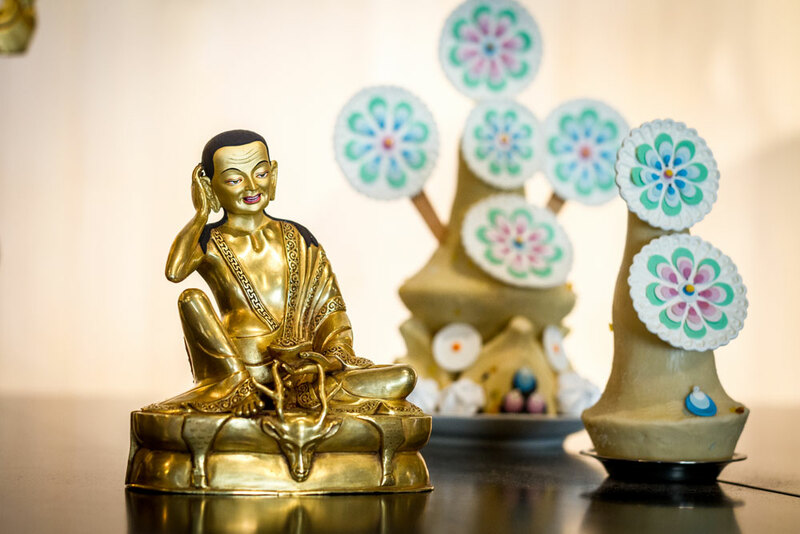 Milarepa built several towers for his teacher Marpa with his bare hands, which Marpa would cruelly tell him to tear down again. 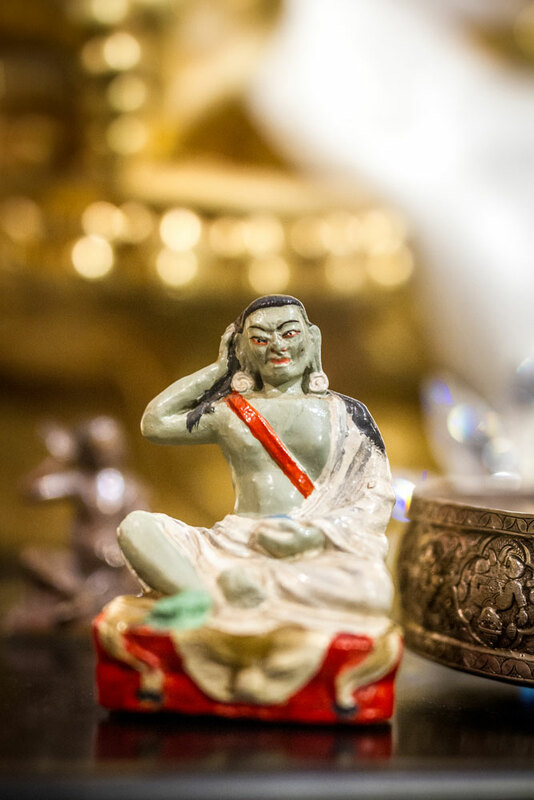 In this way, Marpa skilfully removed many karmic obstacles for his student. 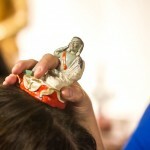 Milarepa spent years in retreat, and reached enlightenment. 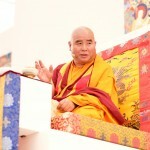 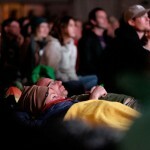 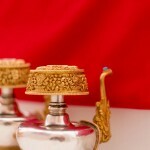 He is best known for his spontaneous songs of realization. 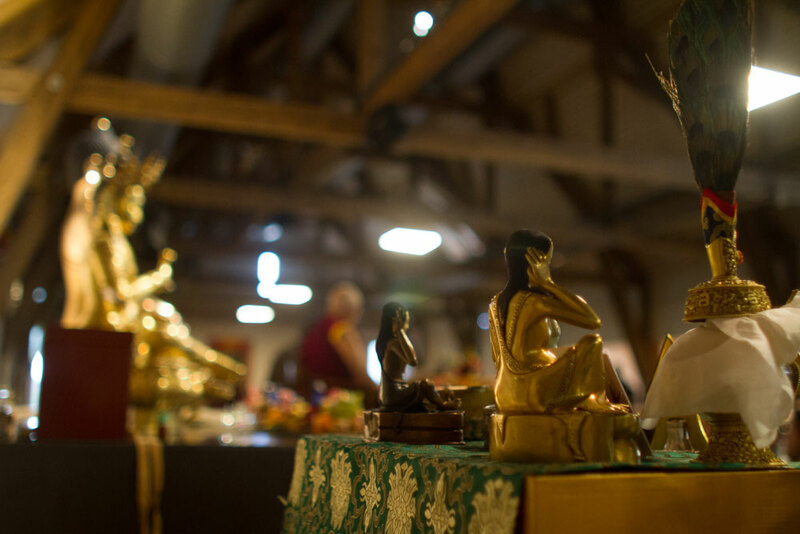 Gampopa was Milarepa’s most renowned student. 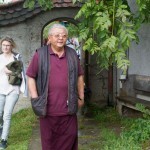 The “doctor from Dhagpo” lost his wife to illness. 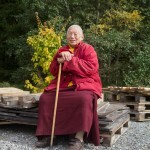 On her deathbed she made him promise not to take another wife, and so Gampopa became a monk. 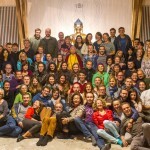 Gampopa trained with Milarepa, achieved realization, and accumulated perhaps 50,000 students. 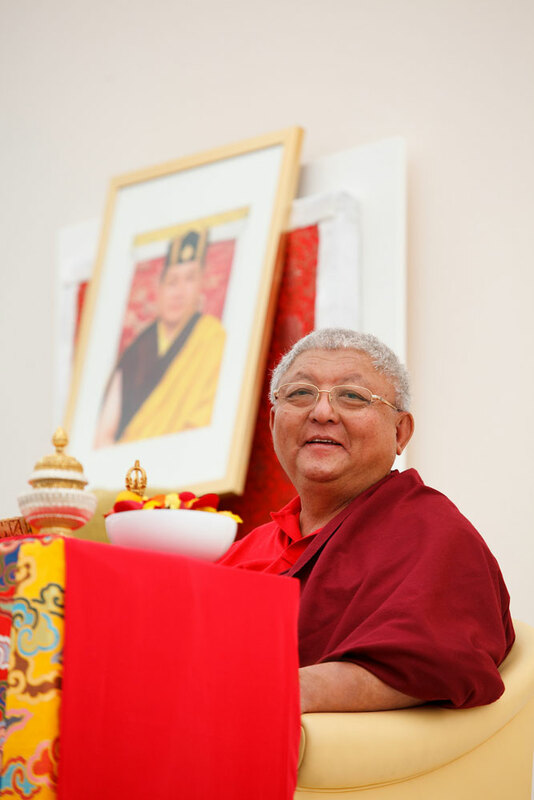 Four of Gampopa’s students founded four major branches of the Kagyu lineage: Barom Kagyu, Karma Kagyu, Phagdru Kagyu, and Tshalpa Kagyu. 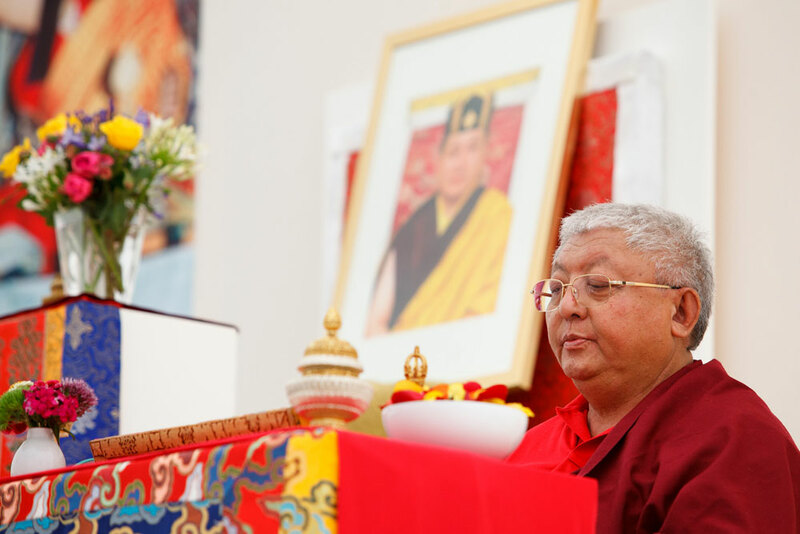 Another of Milarepa’s students, the yogi Rechungpa, brought several important transmissions into the Karma Kagyu lineage, and, along with Gampopa, was a teacher of the 1st Karmapa, Dusum Khyenpa (1110-1193). 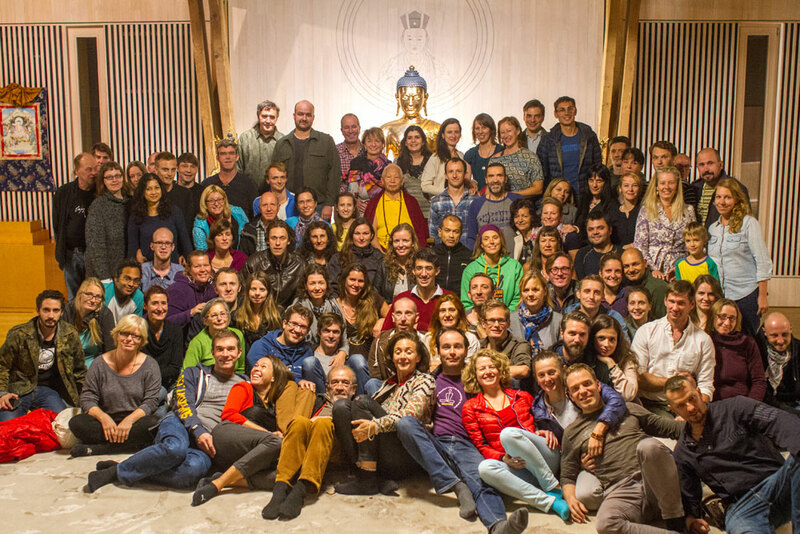 As if the Milarepa empowerment, high teachings and a long story-telling evening had not already been such a great gift, Lama Toensang left it up to the EC sangha to get the most out of spending one more day with us on Monday! 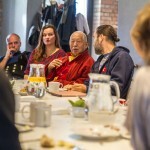 Lama Toensang had breakfast, lunch and dinner together with us in the pub. 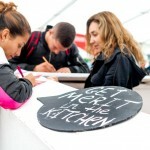 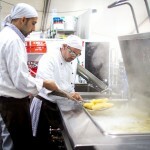 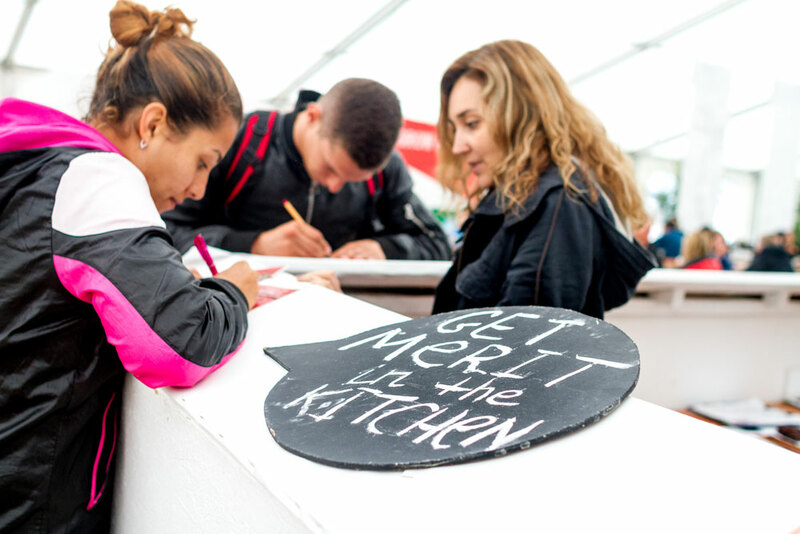 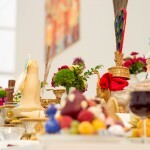 Each meal took hours. 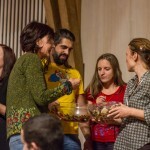 Not because we ate so much, but because he patiently answered all our questions and continued Sunday night’s spontaneous storytelling-session as well. 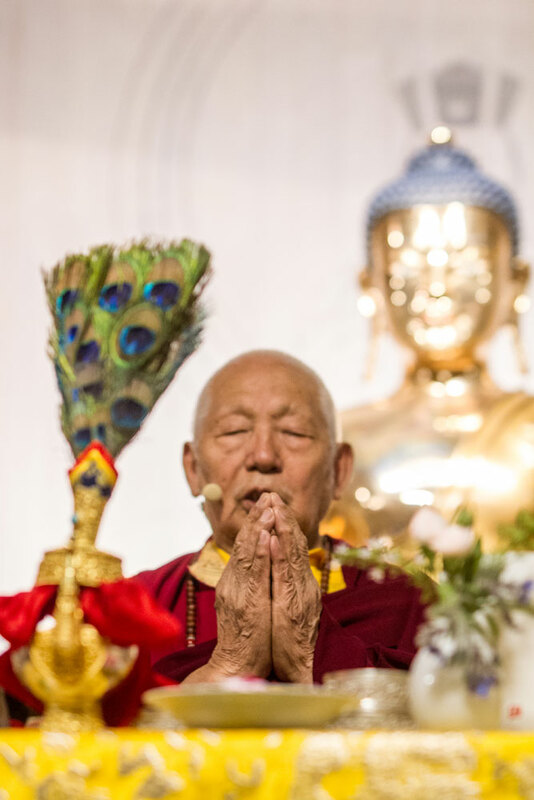 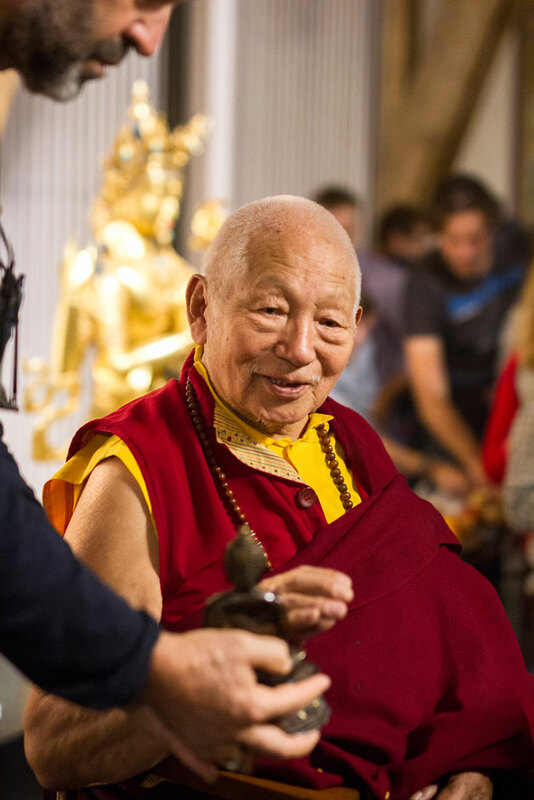 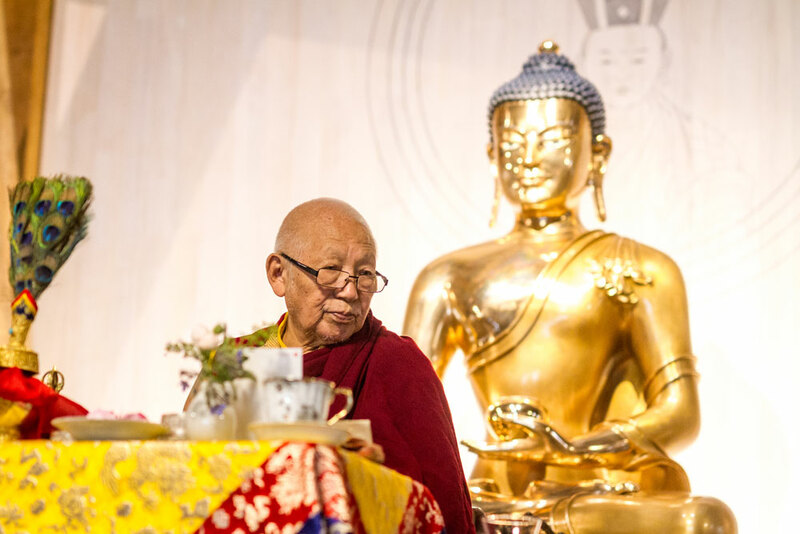 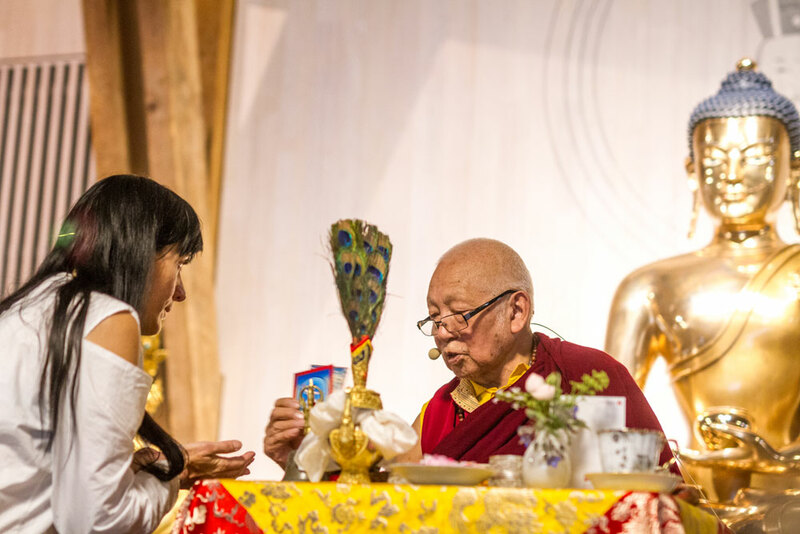 Lama Toensang is full of highly inspiring stories from over 80 years of life experience in Dharma – lots of highly inspiring memories. 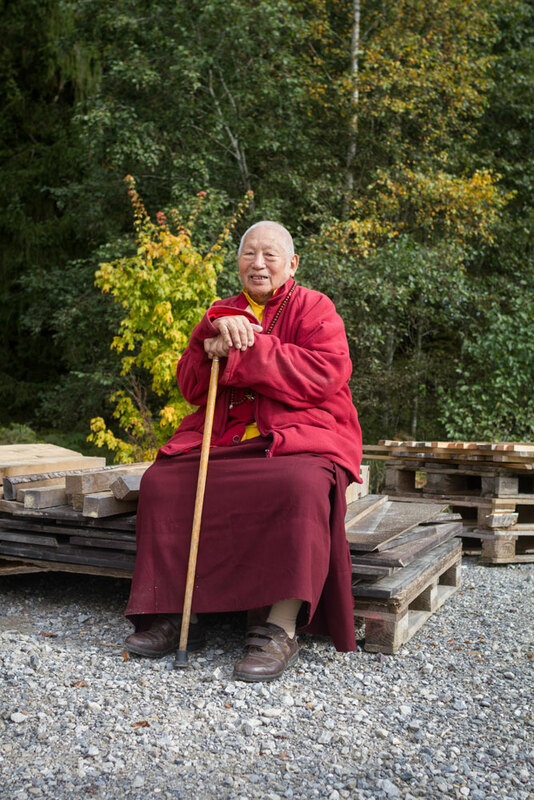 All his life Lama Toensang was building up different centers and monasteries for Karmapa including Rumtek. 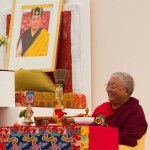 With 17 years he was ordained as a monk in Tsurphu under the guidance of the 16th Karmapa. 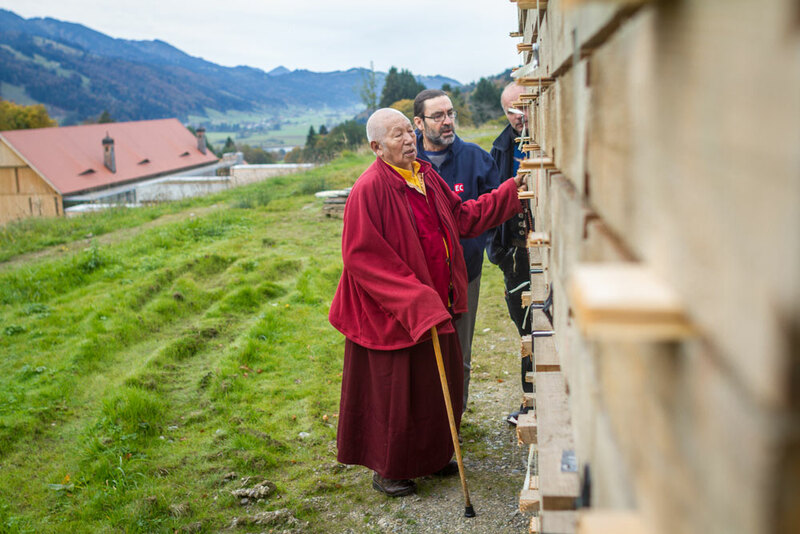 He was a strong man and because of that, he often was sent to help the carpenters, painters and other craftsmen. 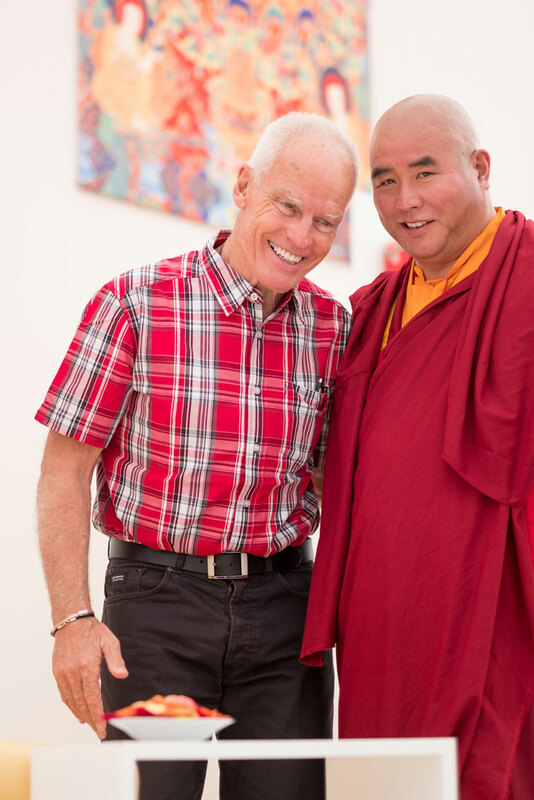 He has been living and working in Montchardon already for 42 years. 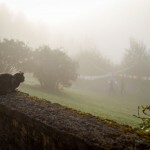 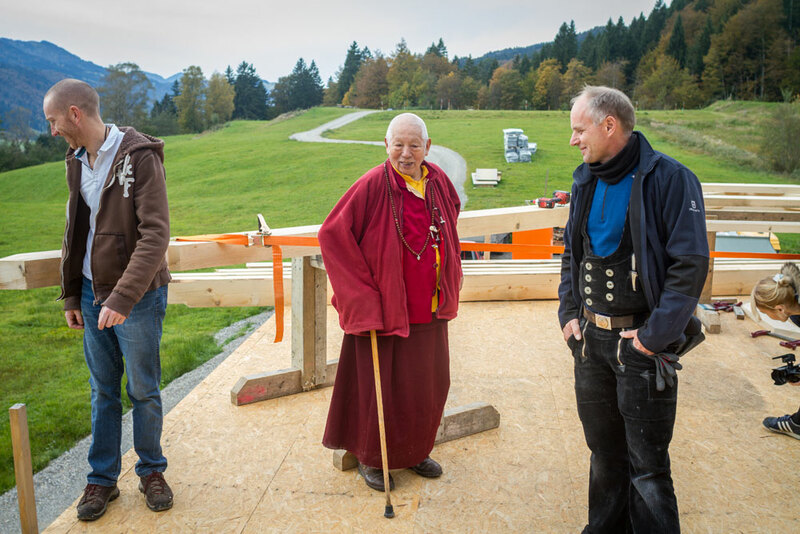 When he came there, it was only a farm house in the middle of the mountains… very similary to the EC. 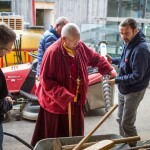 Despite his high age, the very hands-on Lama had a look at everything new on the premises. 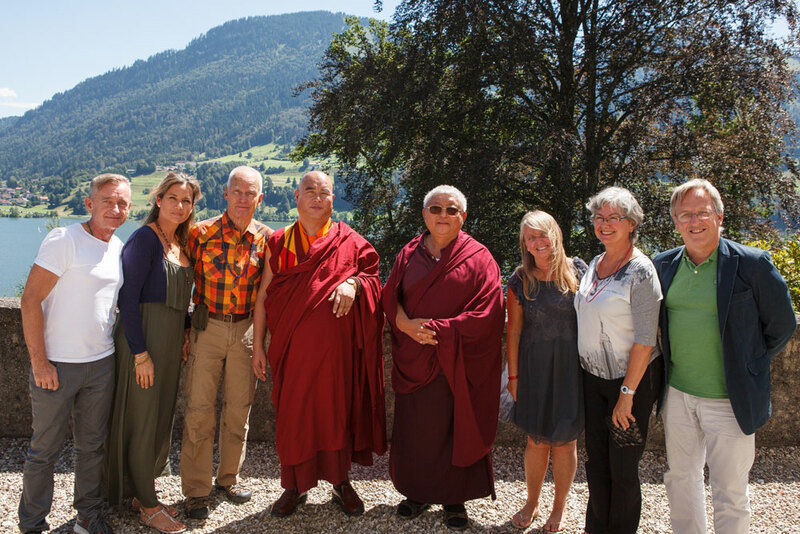 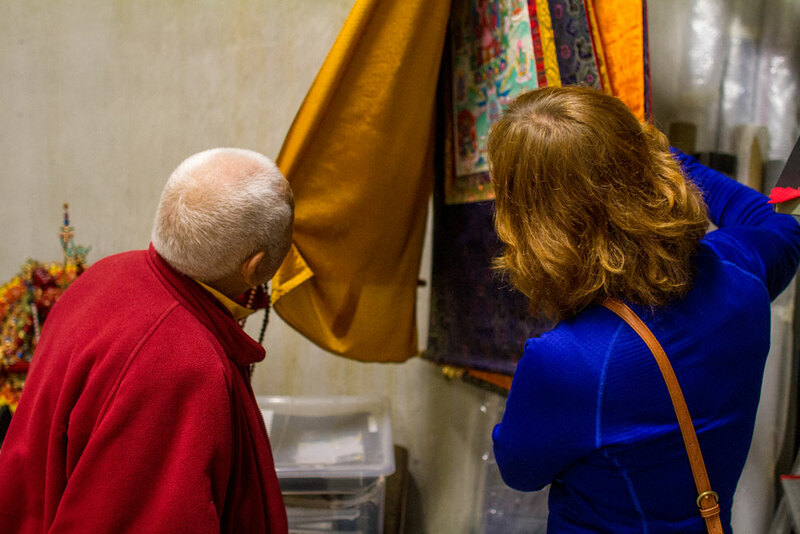 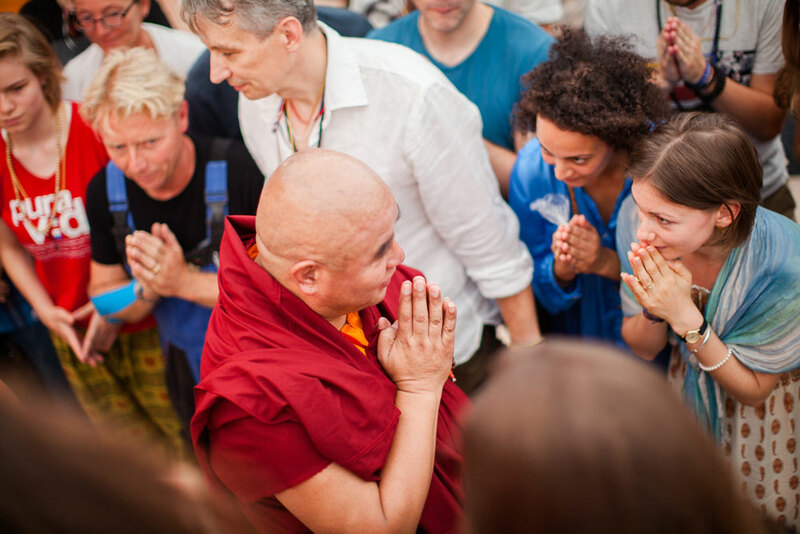 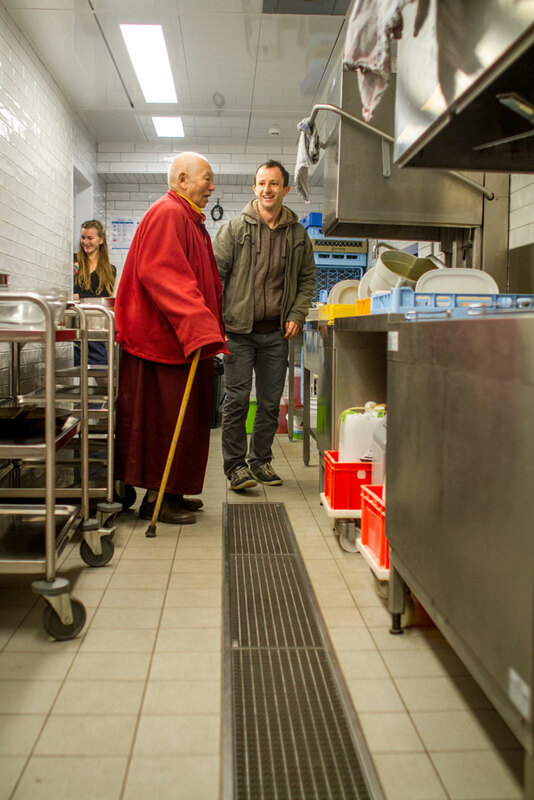 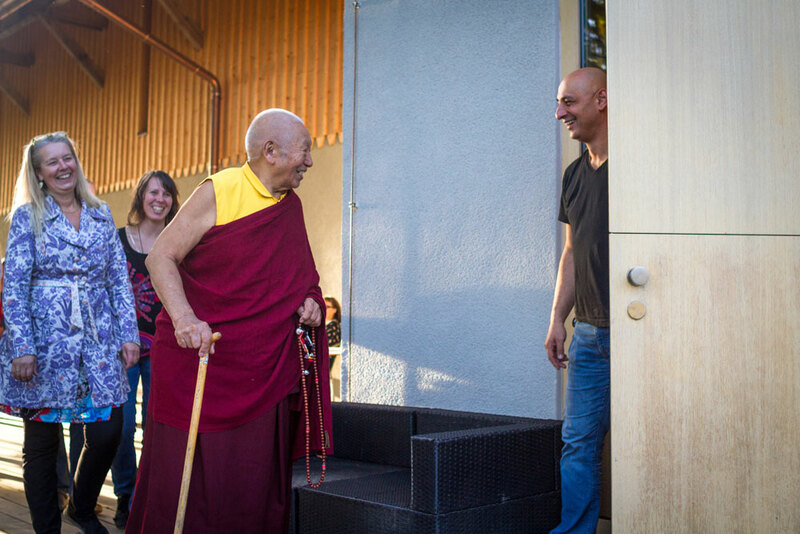 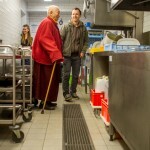 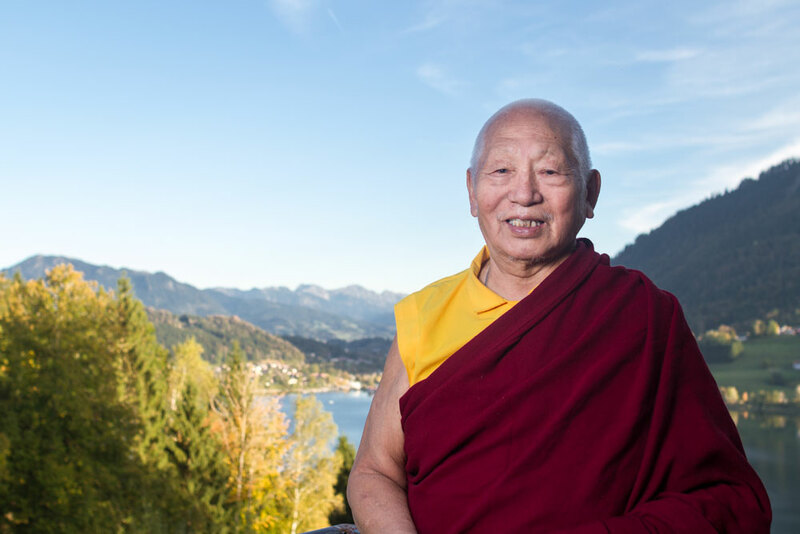 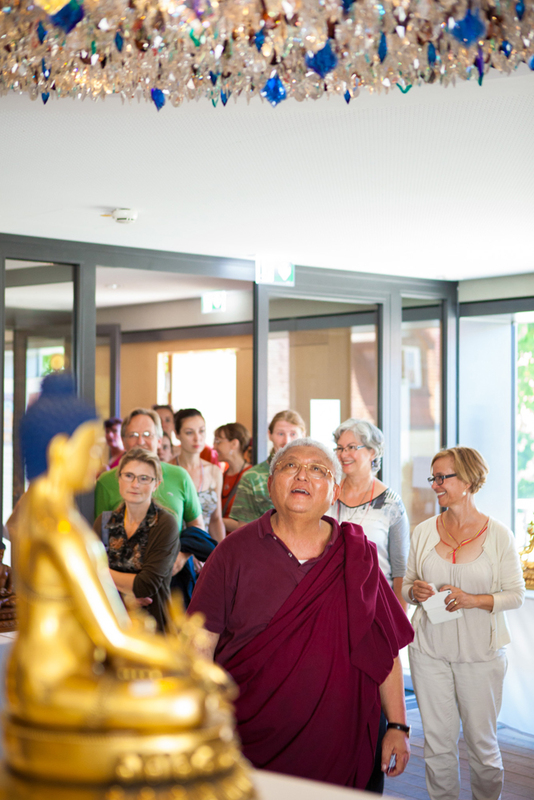 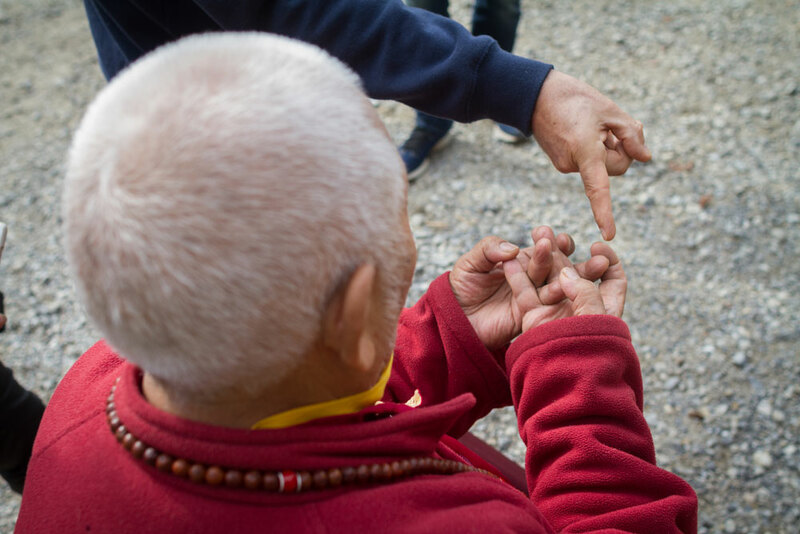 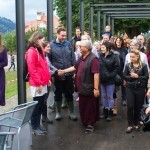 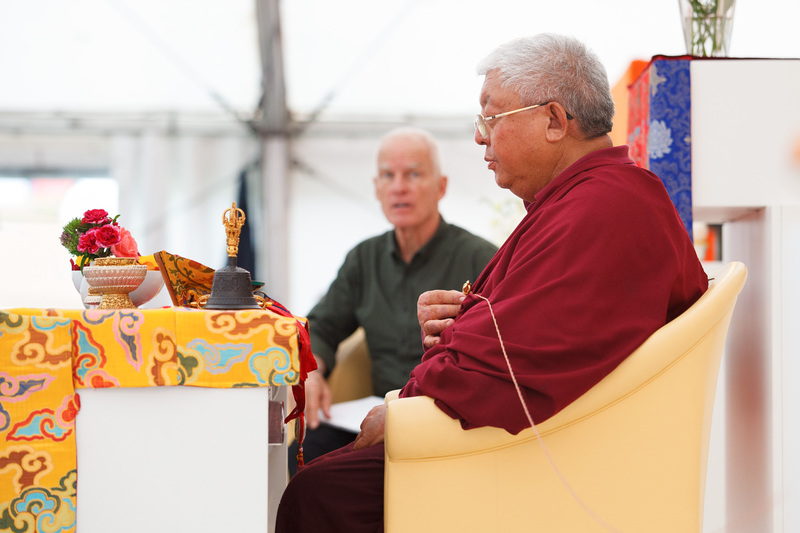 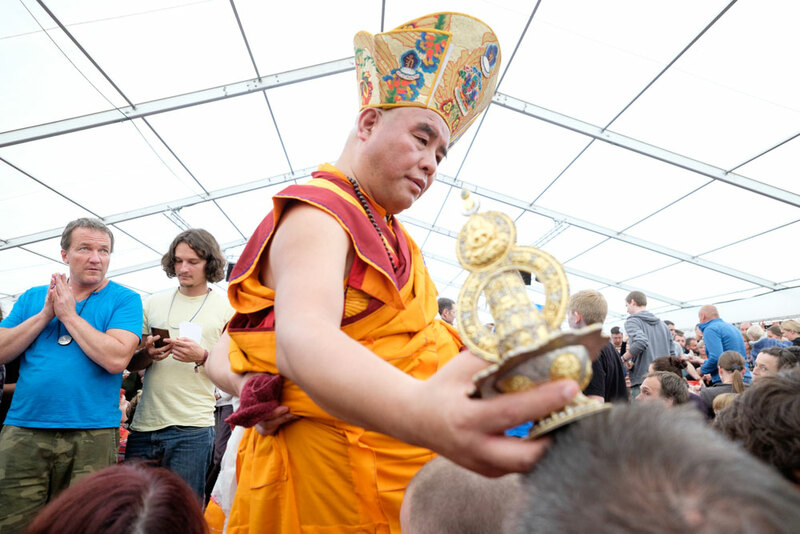 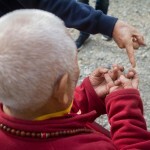 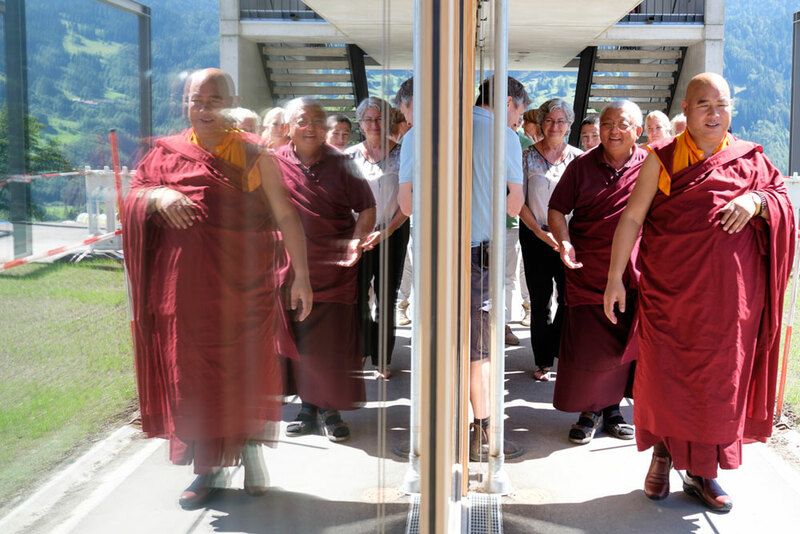 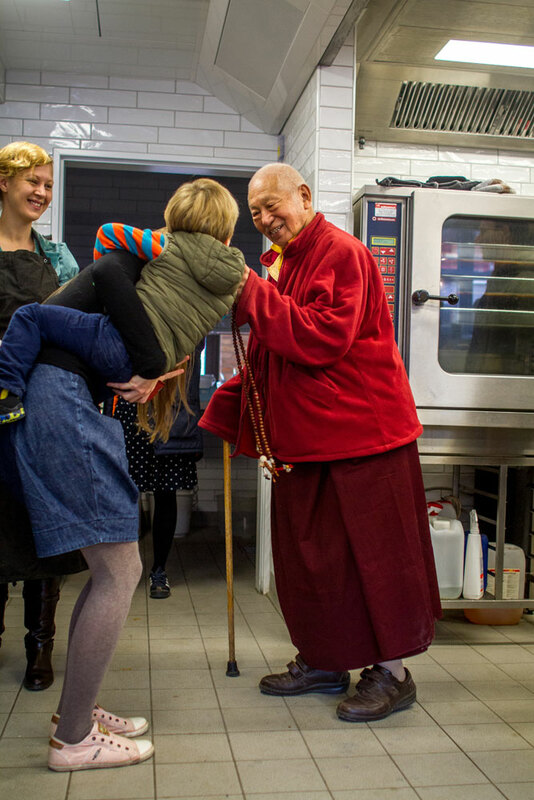 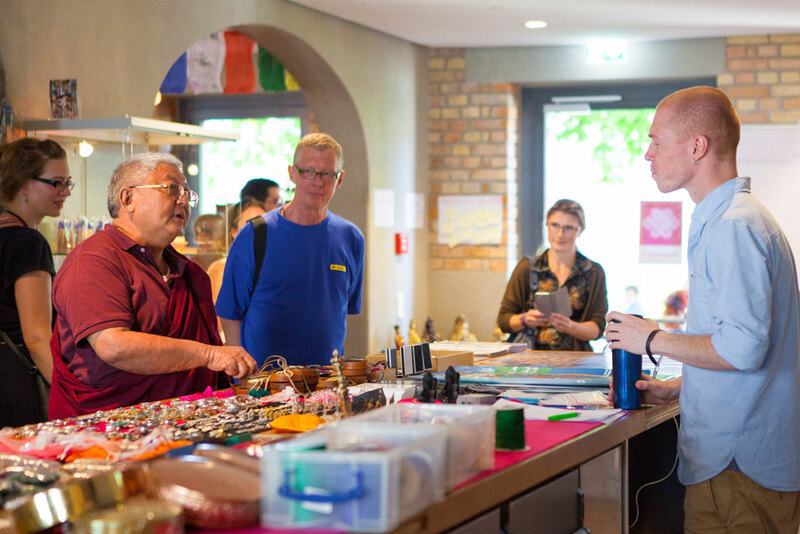 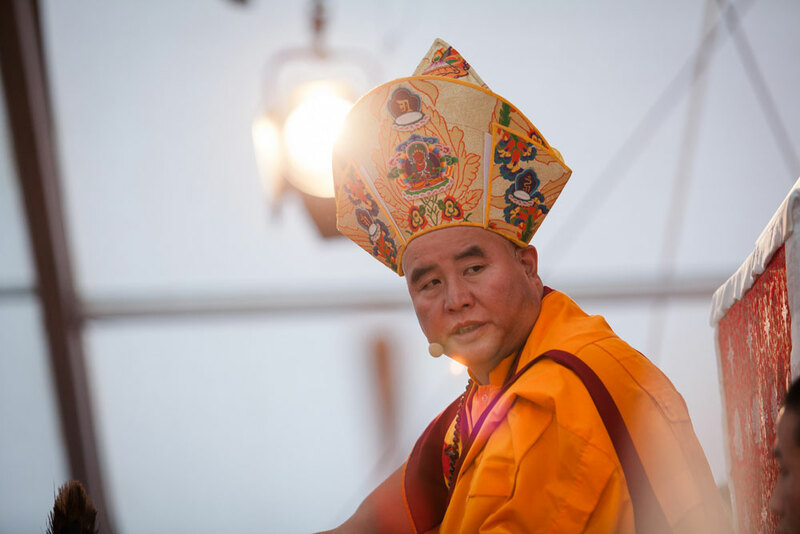 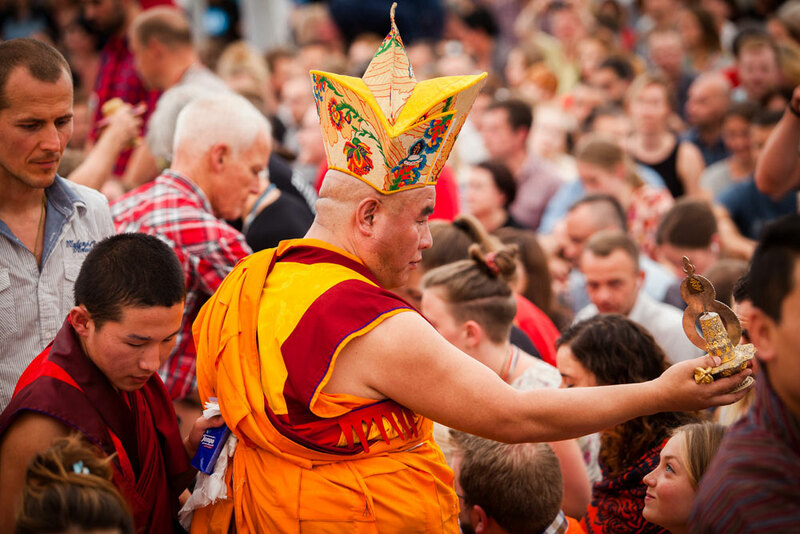 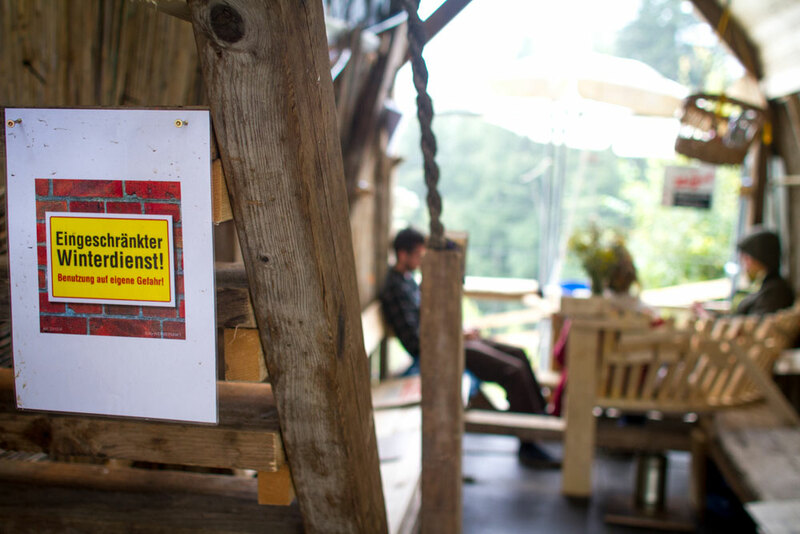 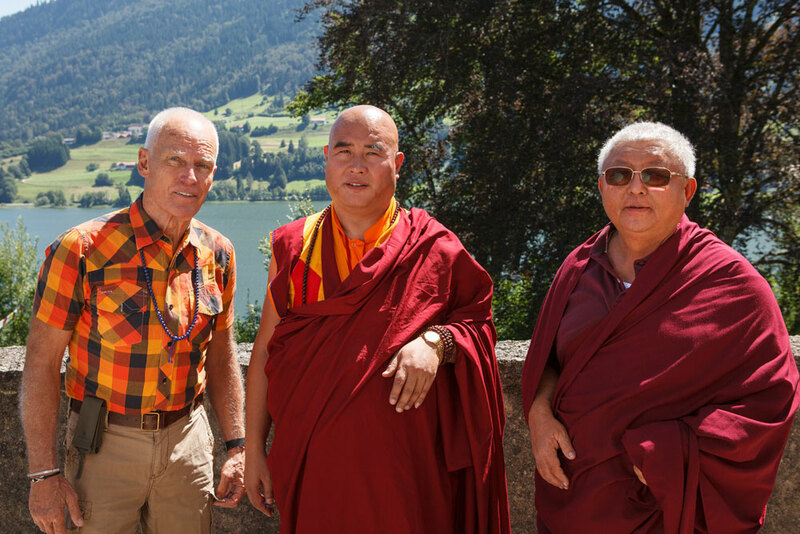 A lot has changed in and around the EC since Lama Toensang visited us last in 2013! 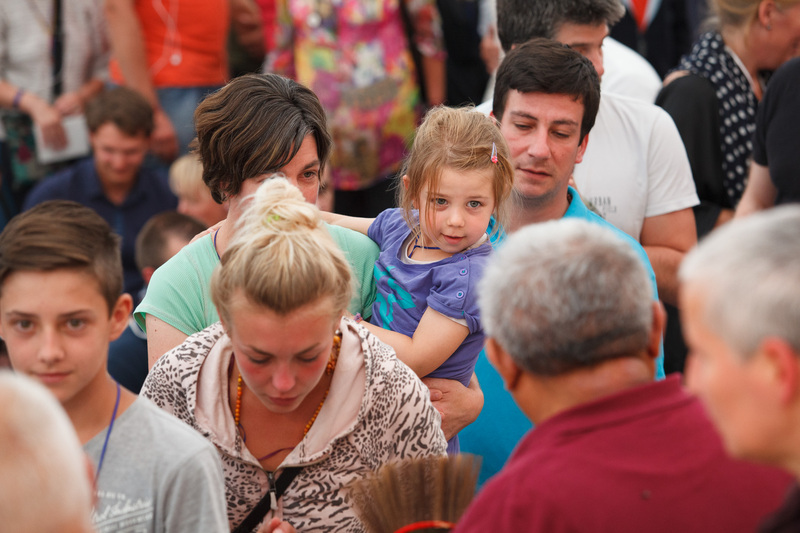 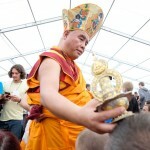 On top of all this, Lama Toensang made time for personal interviews and blessing the families and children as well. 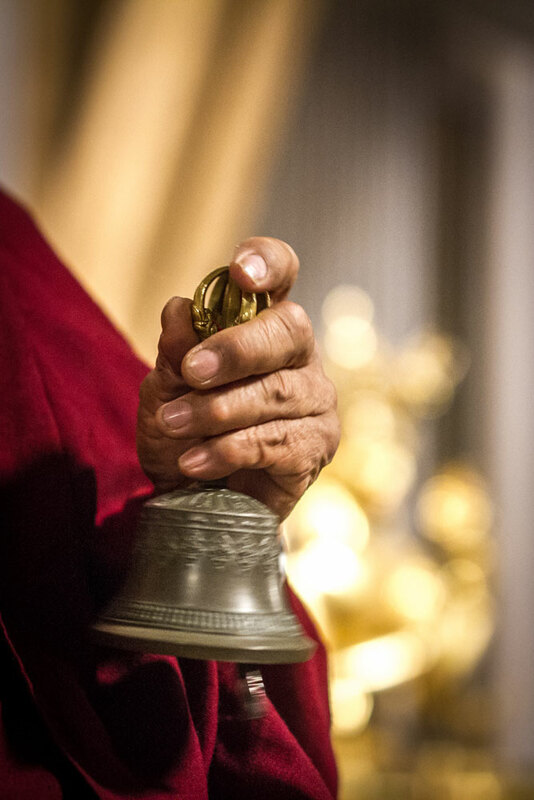 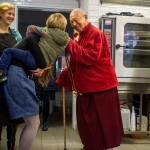 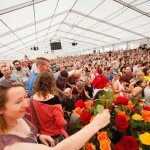 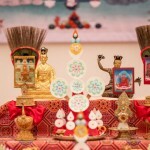 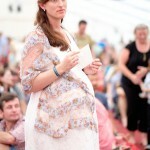 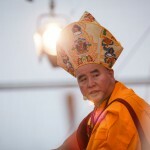 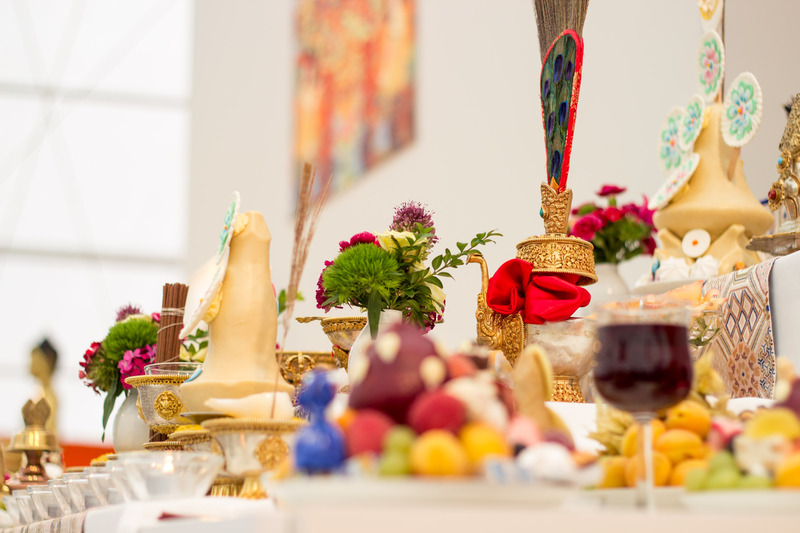 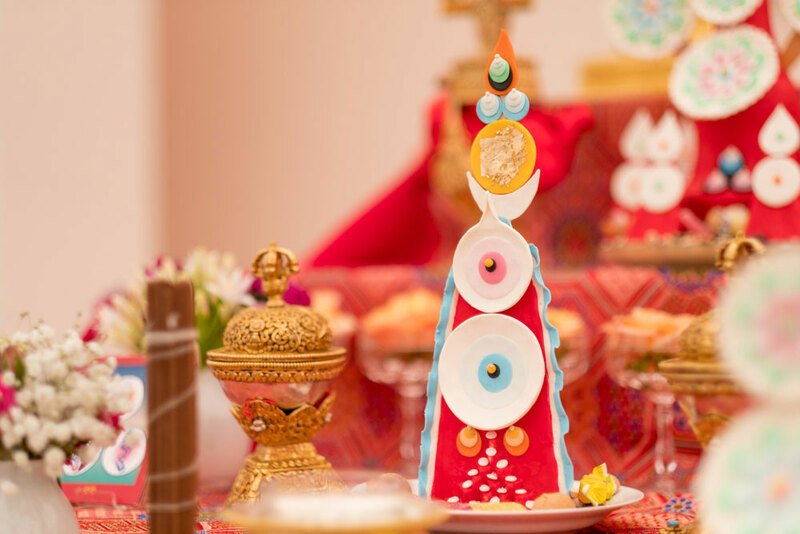 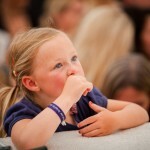 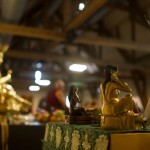 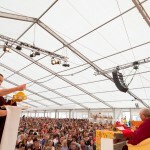 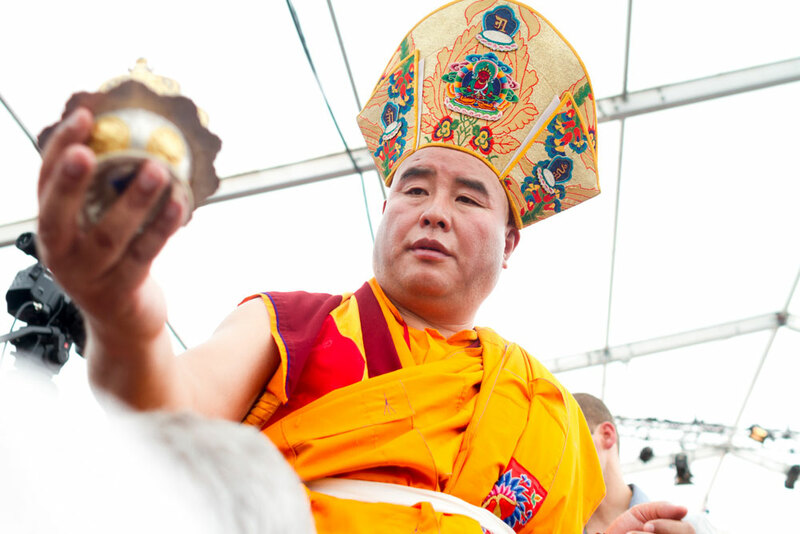 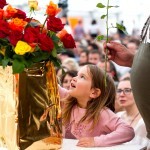 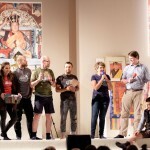 We would very much like to thank Lama Toensang for these amazing days! 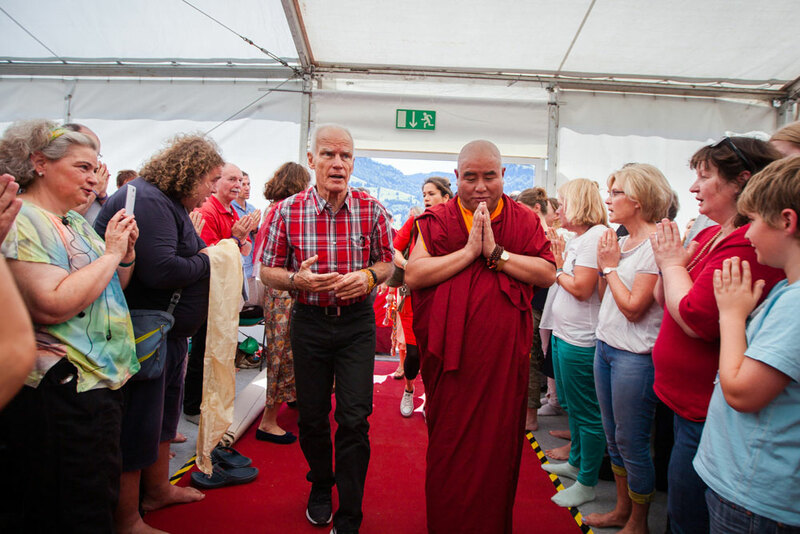 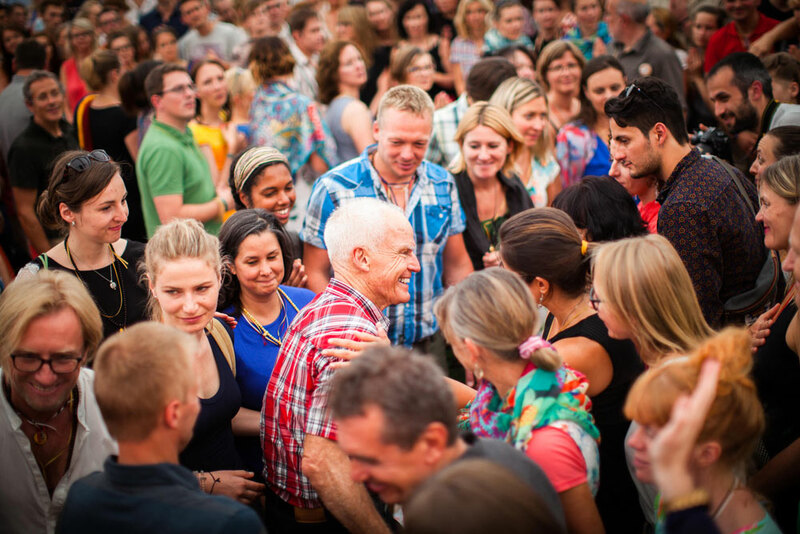 Wishing him many more healthy and fulfilled years, we are very much hoping to welcome him back at the EC next year for more teachings! 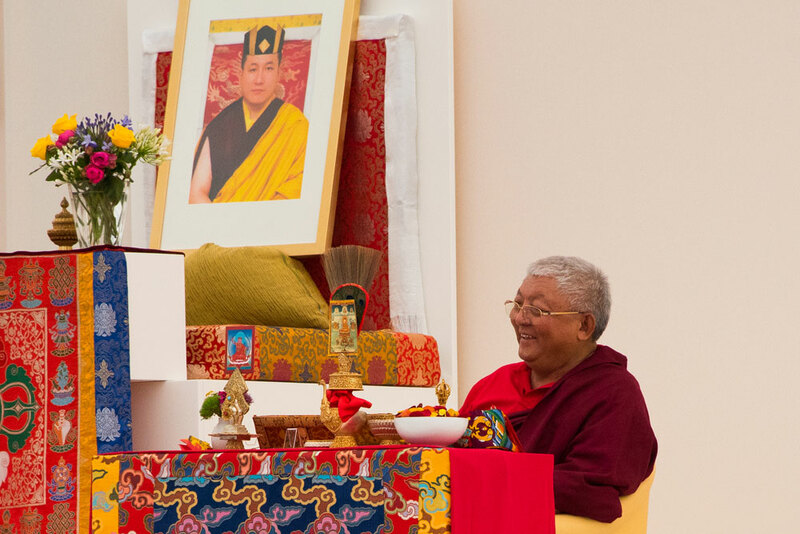 +++ NEWS UPDATE +++ One more empowerment with Lopon Dorji Rinchen Rinpoche! 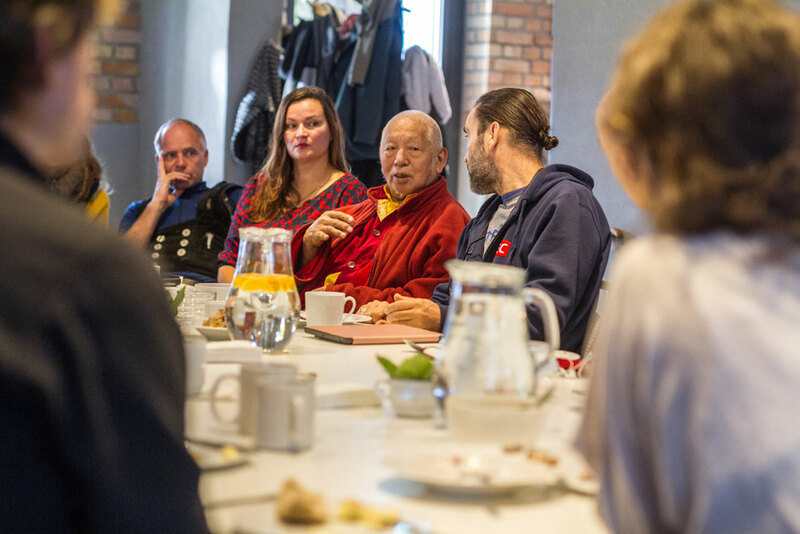 Lopon Dorji Rinchen Rinpoche kindly offered to give us the empowerment into the Buddha of Limitless Light (Skt. 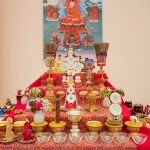 Amitabha, Tib. 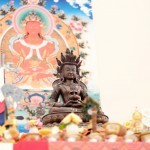 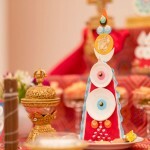 Öpame) and the Buddha of Limitless Life (Skt. 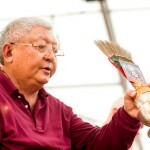 Amitayus, Tib. 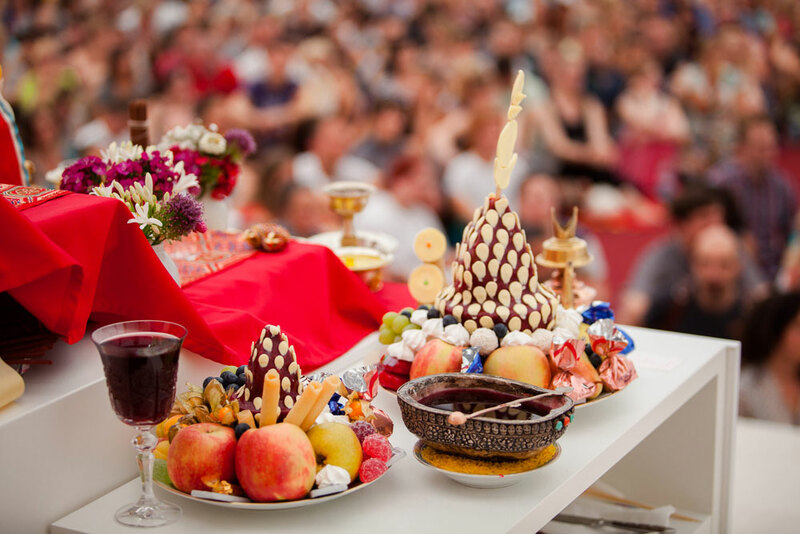 Tsepame) next Saturday, August 13, 2016 at 1pm. 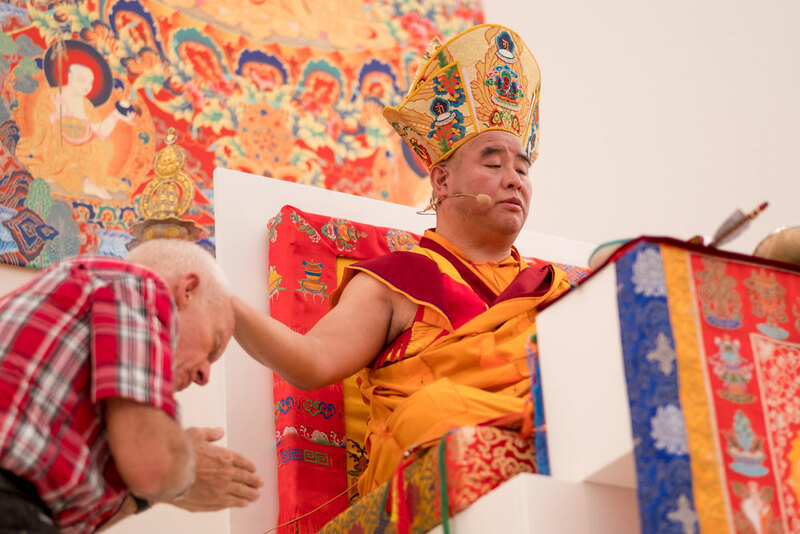 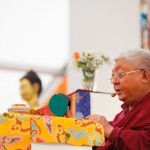 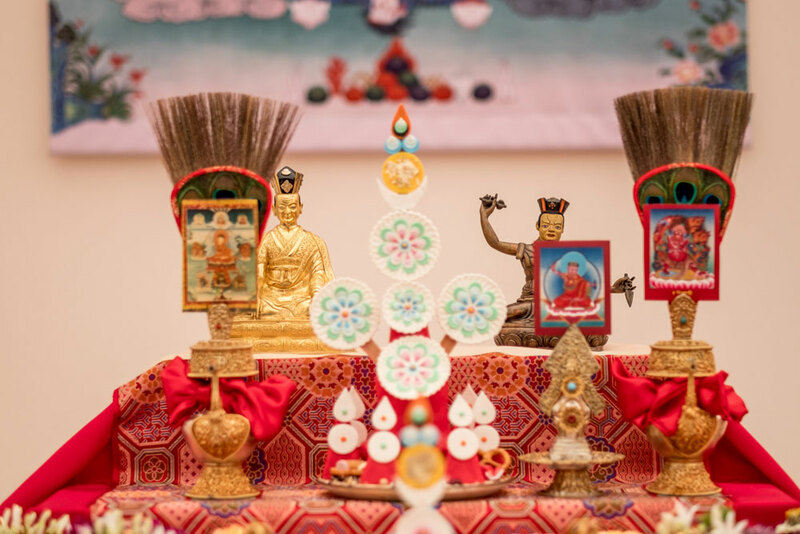 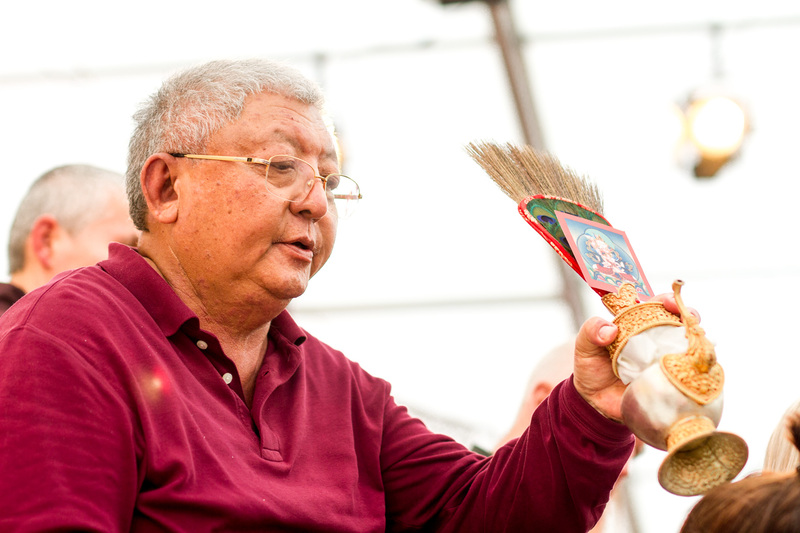 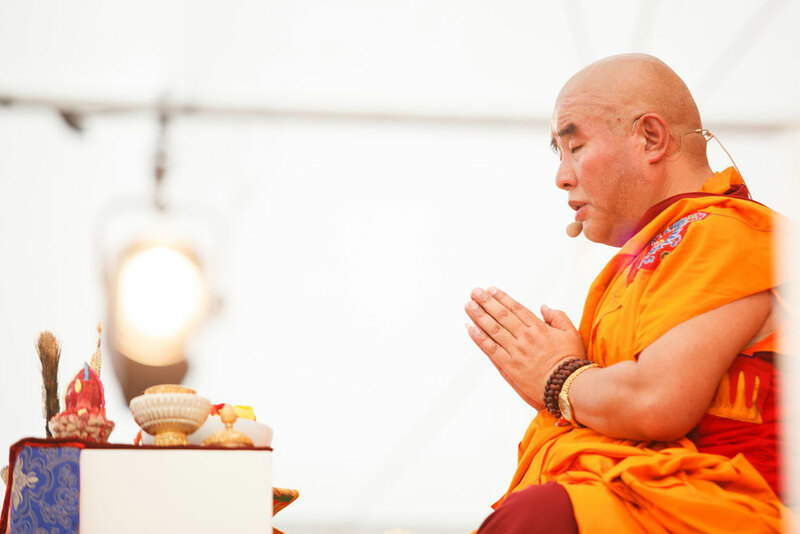 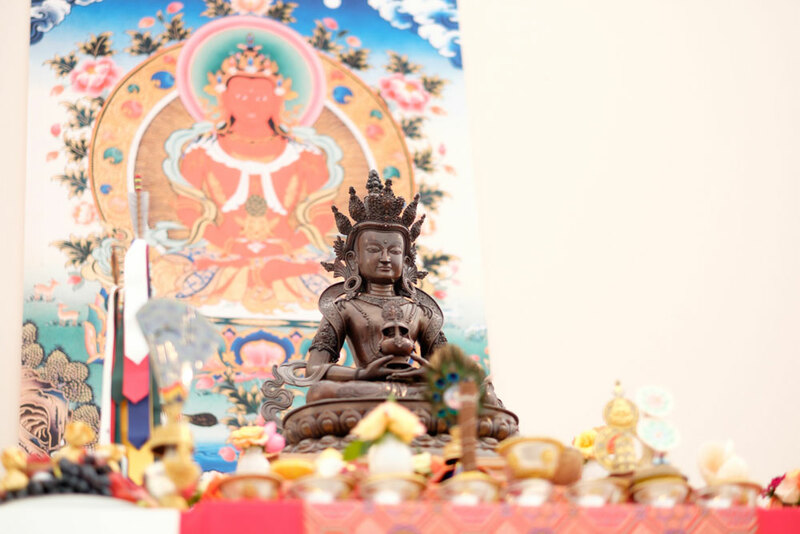 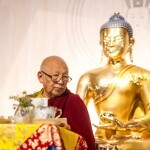 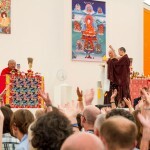 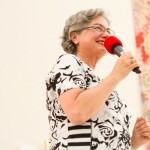 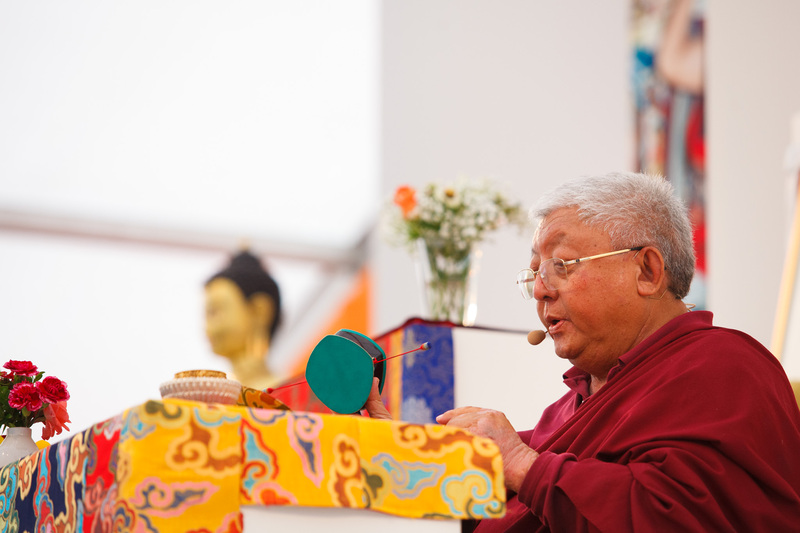 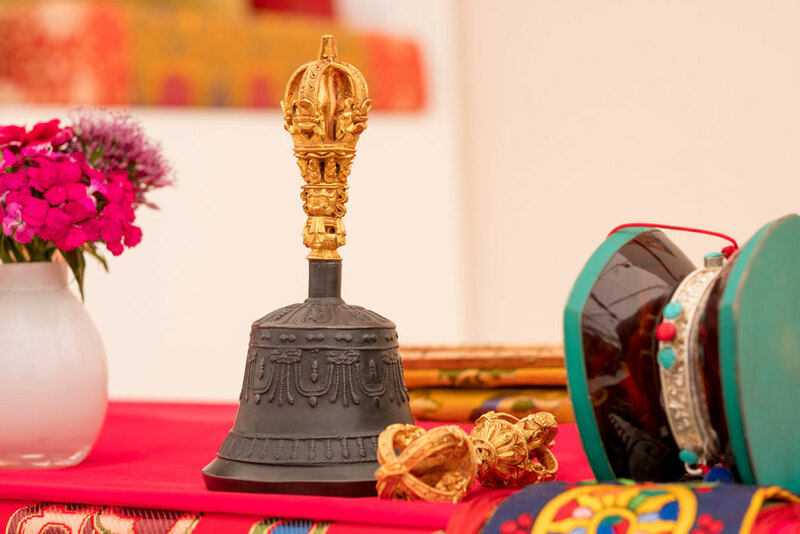 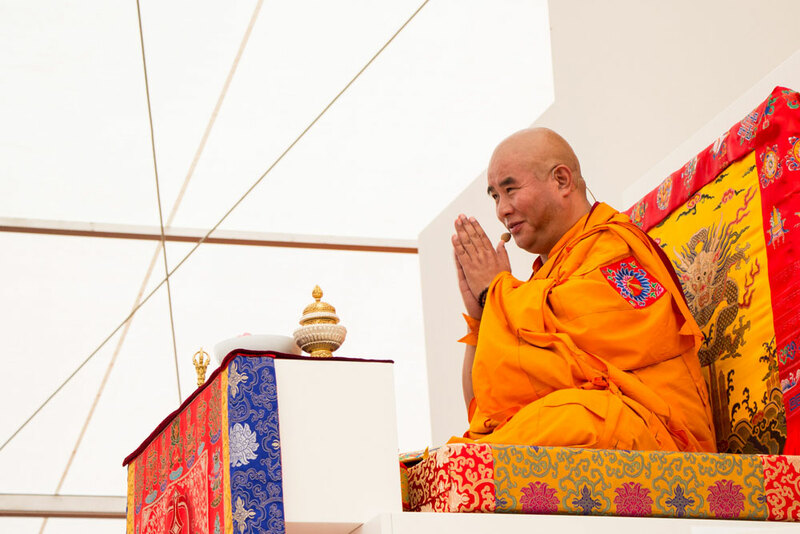 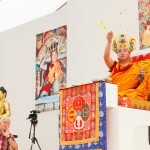 Lama Jigme Rinpoche gave the second of three consecutive empowerments at this year’s Summer Course today, that into one of the most important meditation aspects for practitioners of Diamond Way Buddhism – Diamond Mind (Skt. 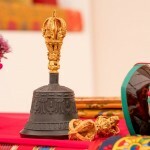 Vajrasattva; Tib. 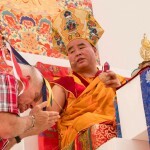 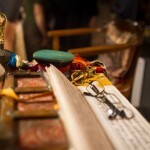 Dorje Sempa), united with his consort Vajragarvi (Tib. 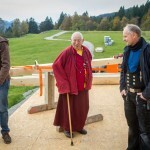 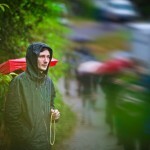 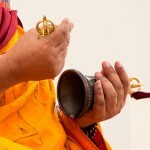 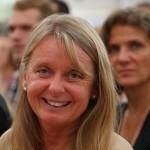 Dorje Nyema). 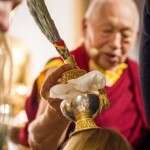 The meditation on Diamond Mind is one of the most powerful methods for purifying imprints in the subconscious that were caused by harmful actions in this and former lives. 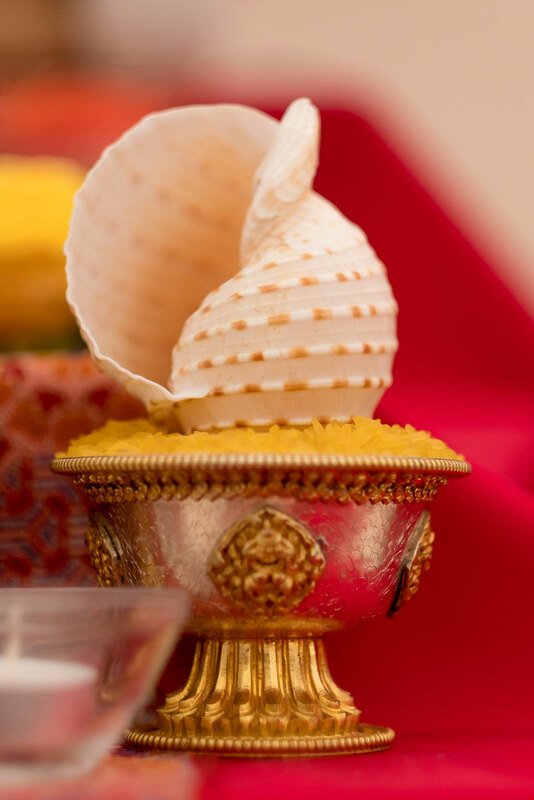 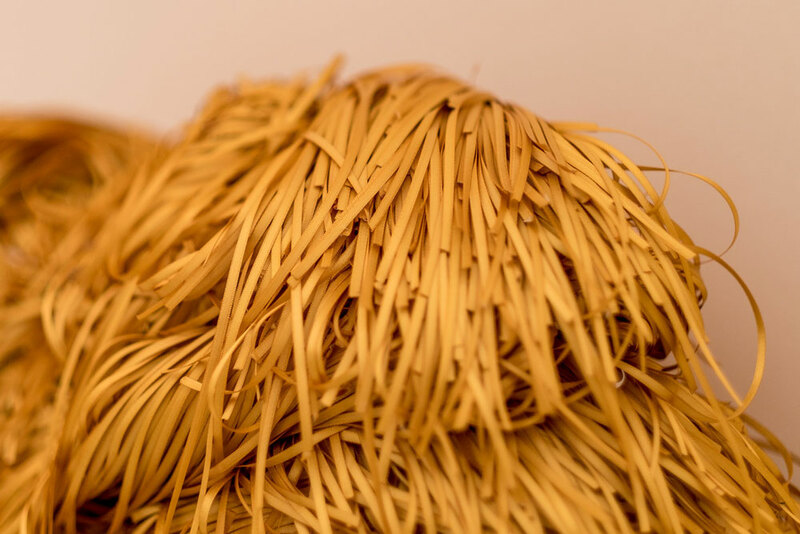 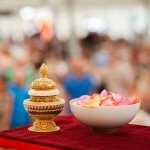 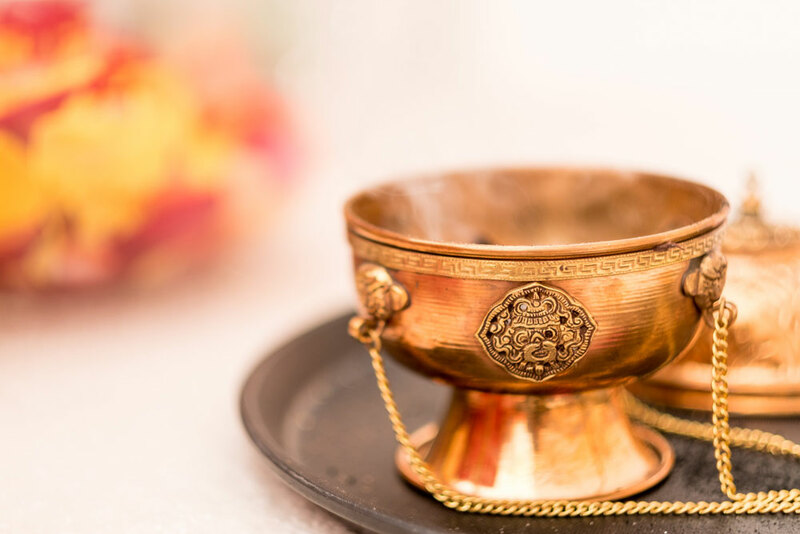 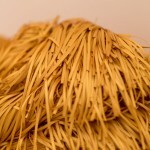 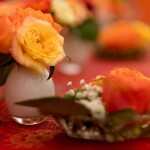 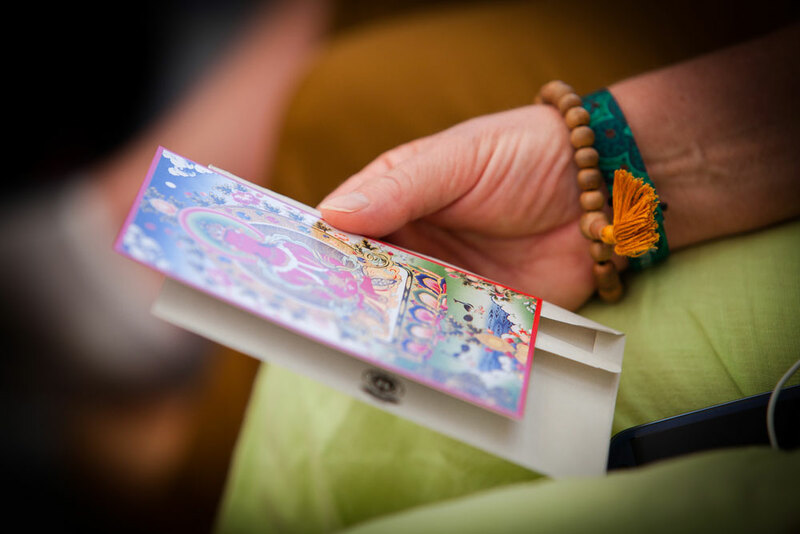 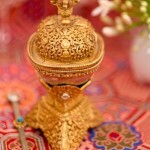 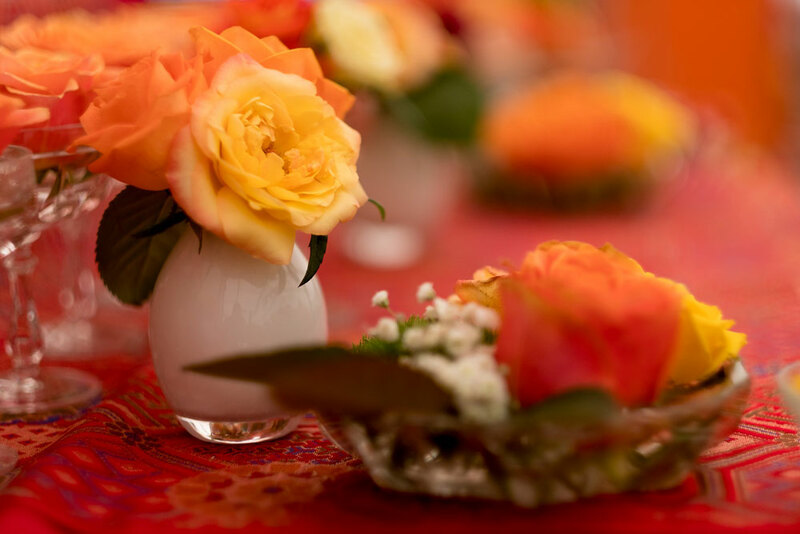 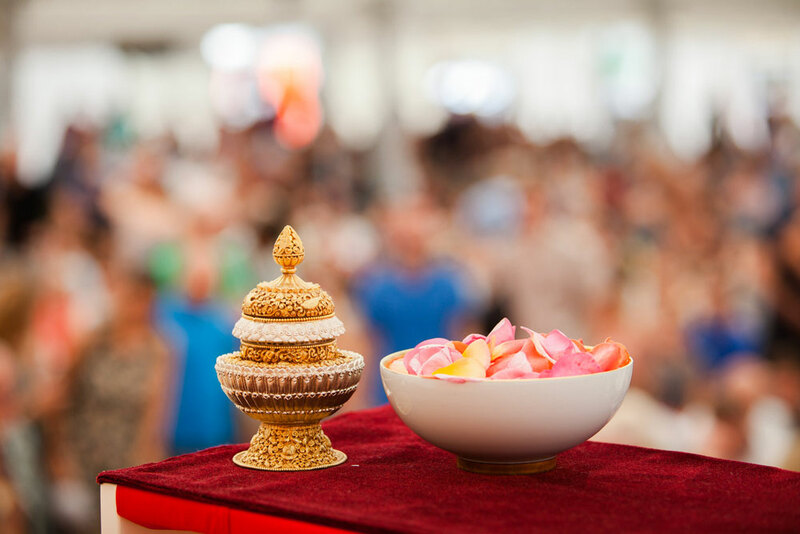 Through this method, karmic seeds can be purified before they ripen in the form of negative experiences. 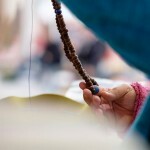 Karma means cause and effect, not fate. 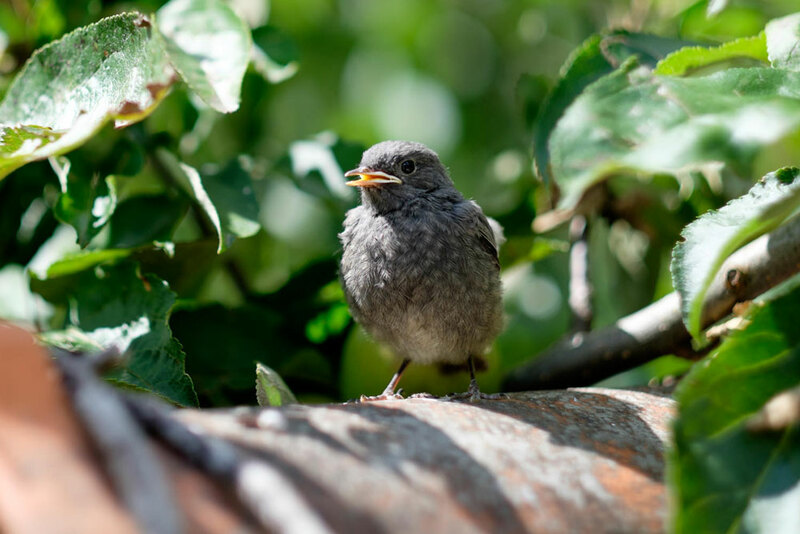 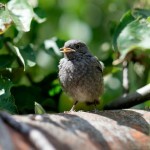 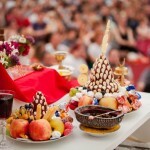 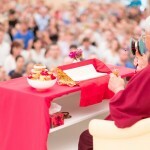 Everyone is responsible for his or her own life and shapes it through thoughts, words and actions. 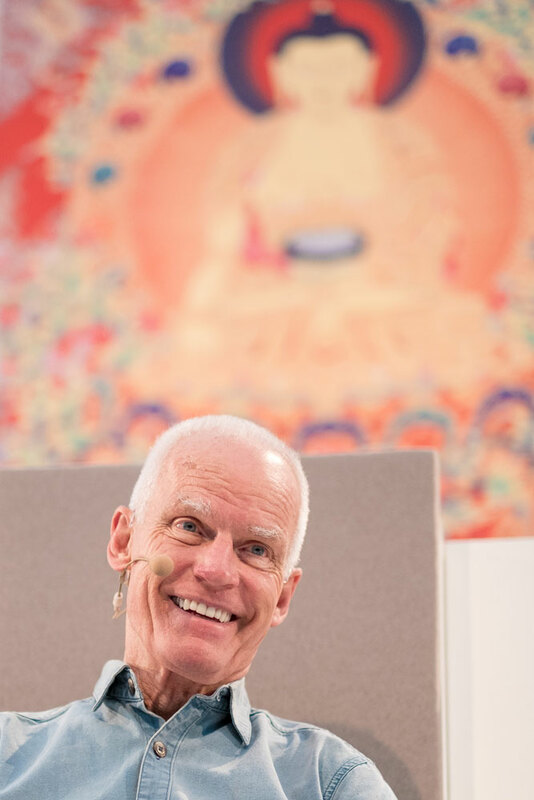 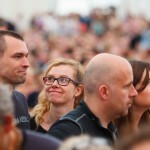 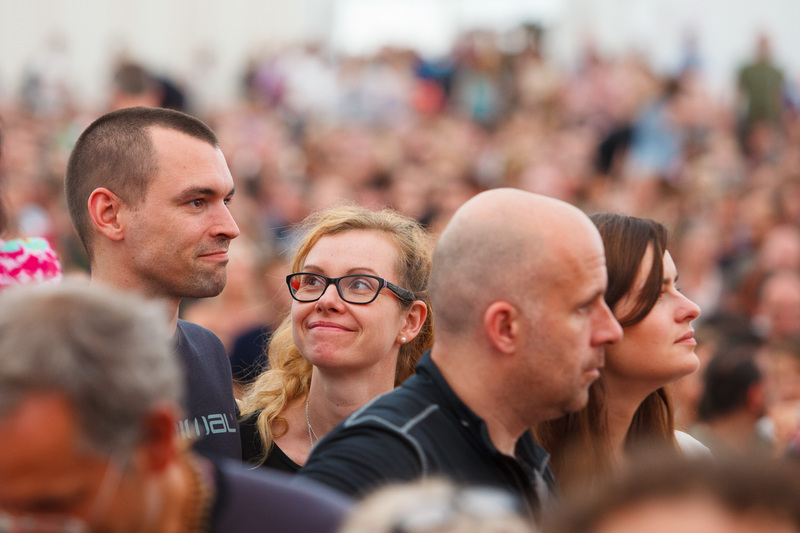 This understanding makes it possible to consciously generate positive impressions in mind, which lead to happiness and help avoid future suffering. 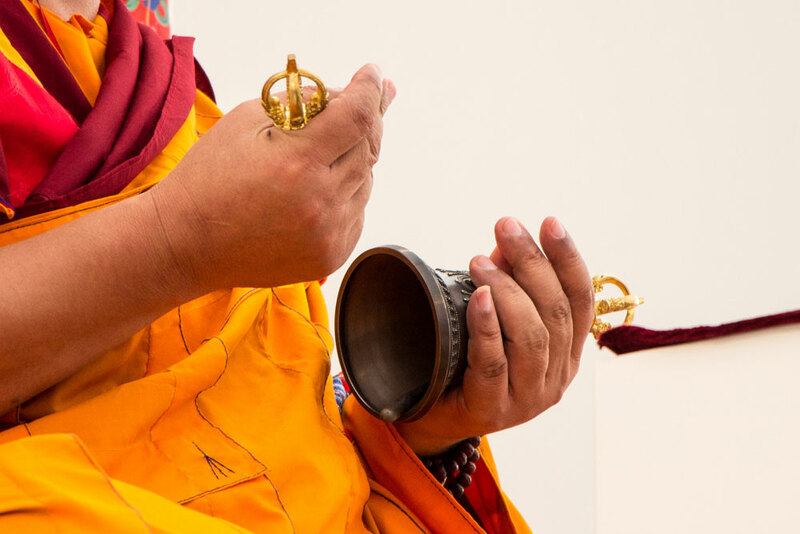 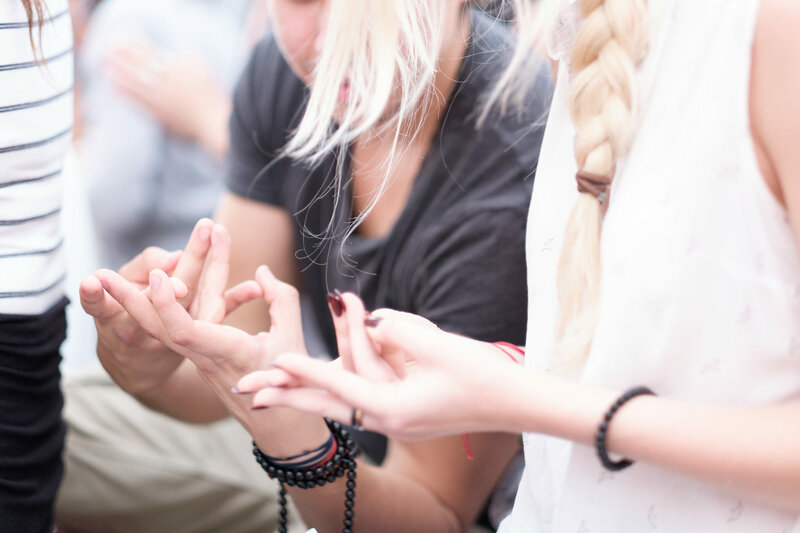 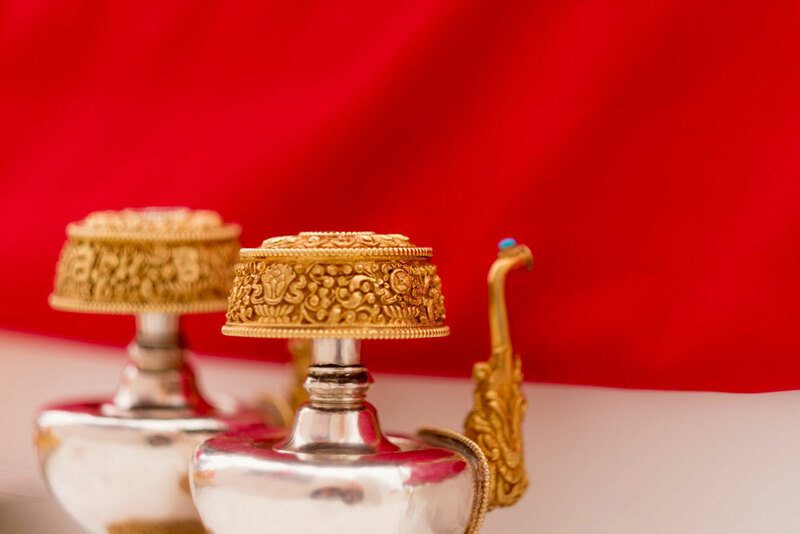 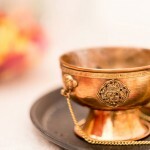 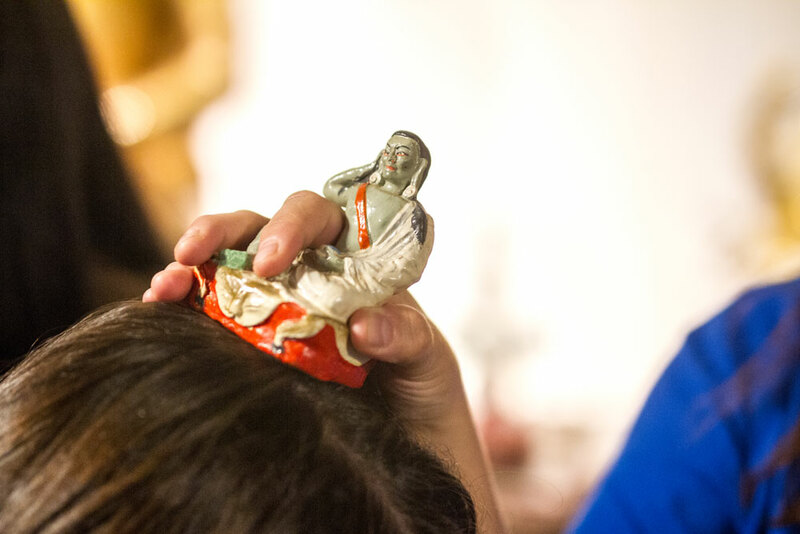 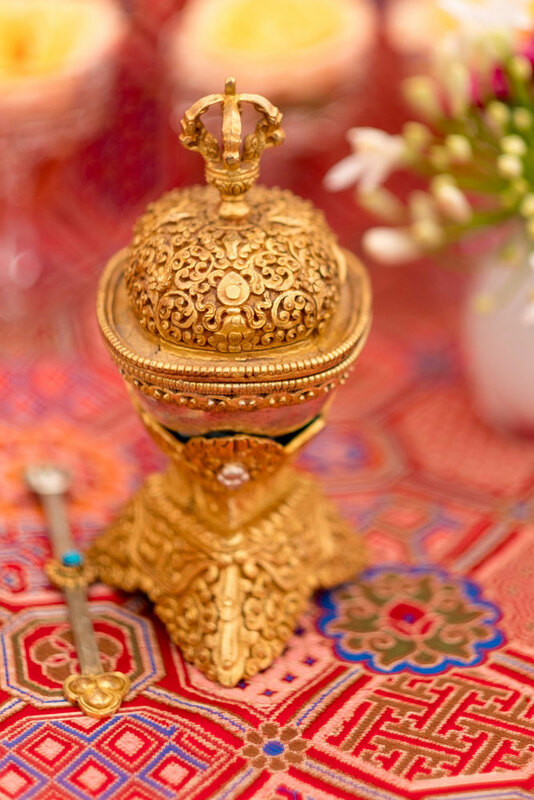 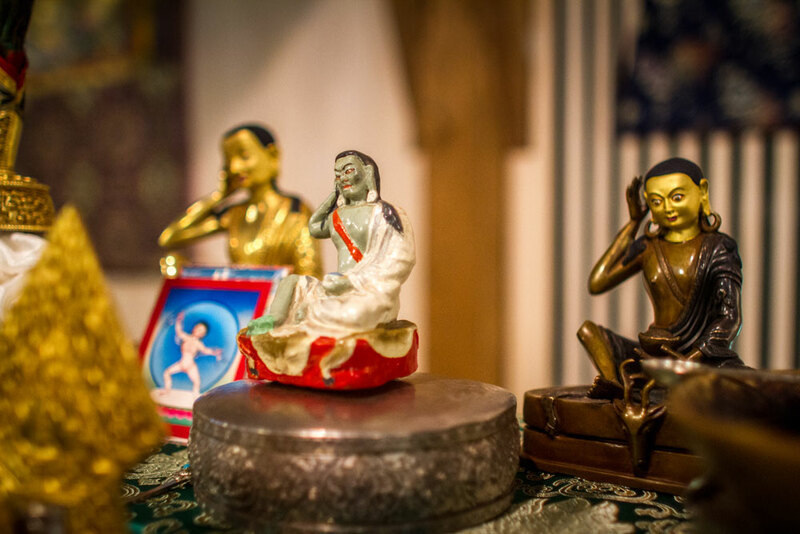 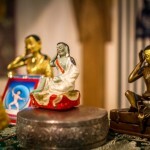 This meditation practice is part of the Four Preliminary Practices in Vajrayana Buddhism. 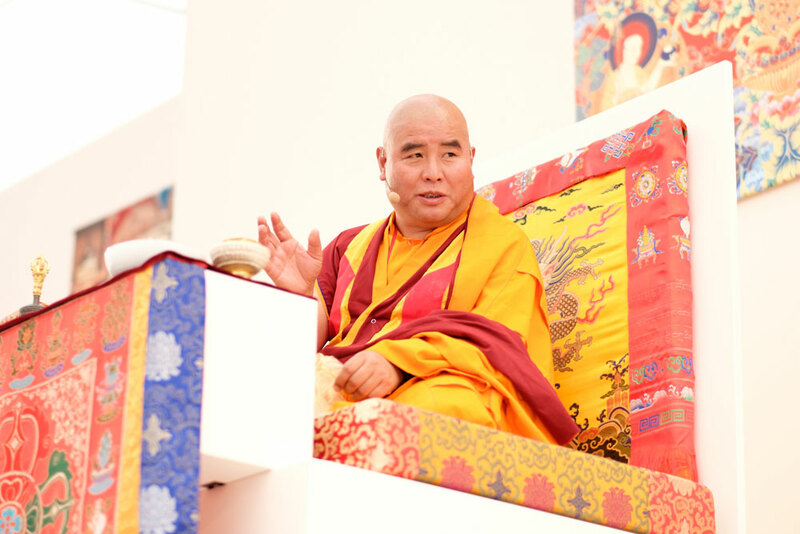 It is said that a practitioner can achieve enlightenment solely by practicing and completing these meditations. 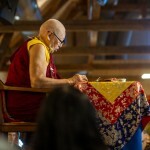 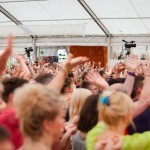 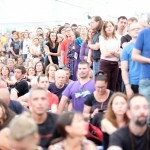 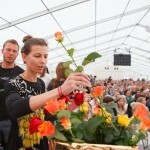 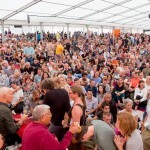 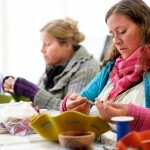 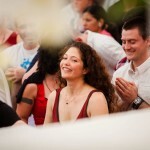 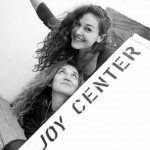 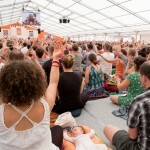 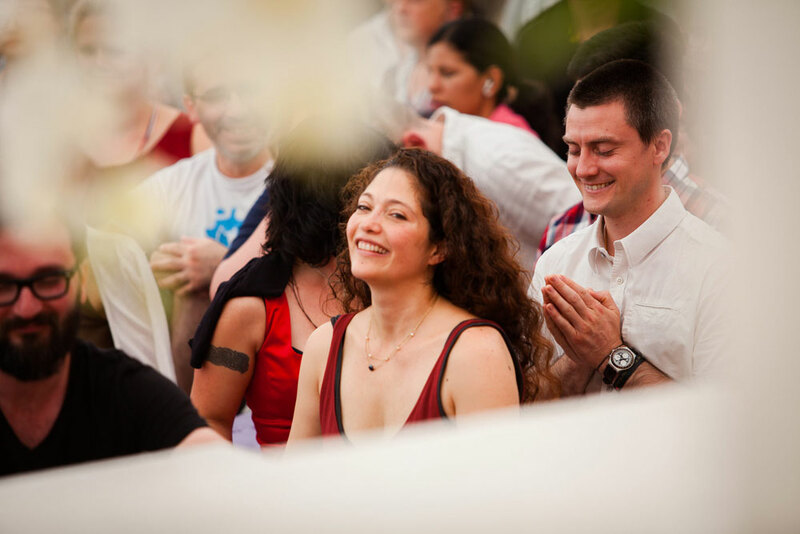 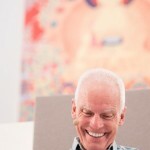 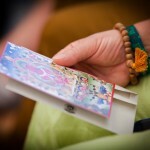 They are the preparation for the following Mahamudra or Guru Yoga practices.